Today is the day we’ve been looking forward to all week! 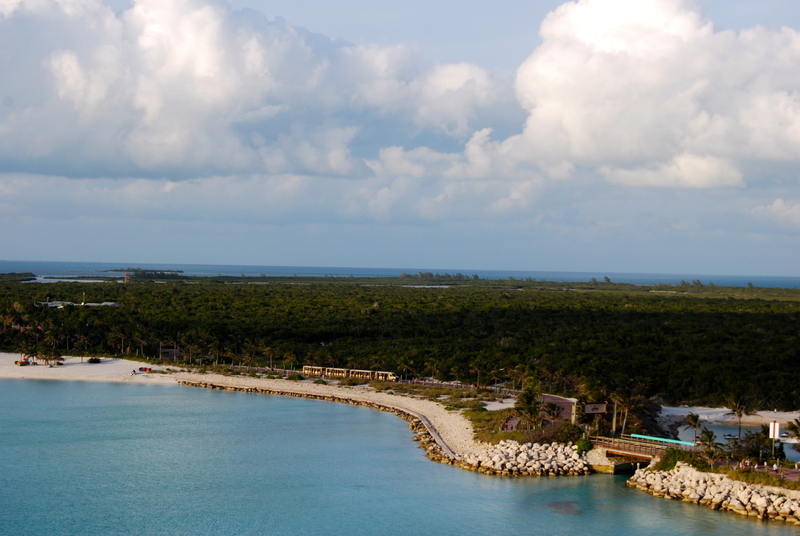 Castaway Cay! 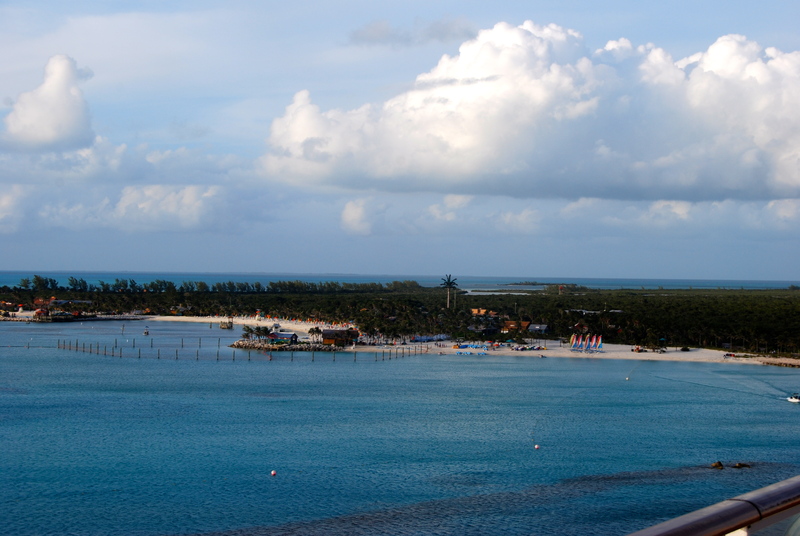 Castaway Cay is Disney‘s private island. 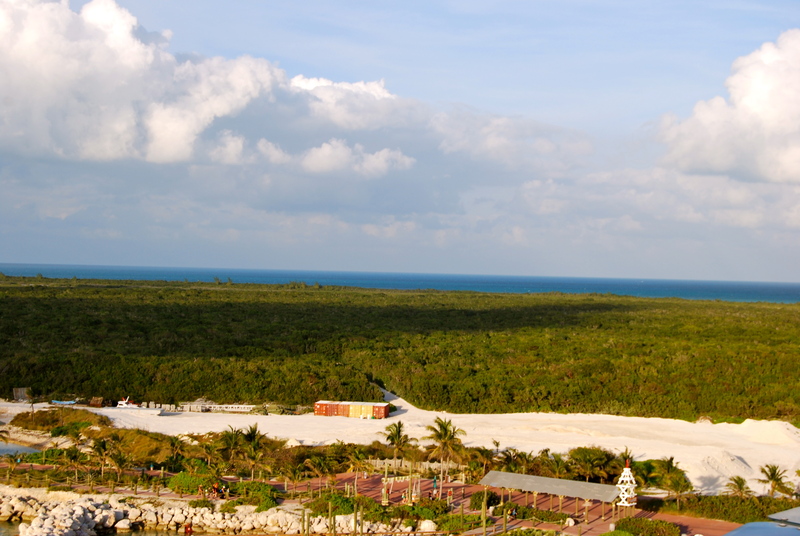 They have 3 separate beaches– the family beach, the sports beach, and the adults only beach called Serenity Bay. 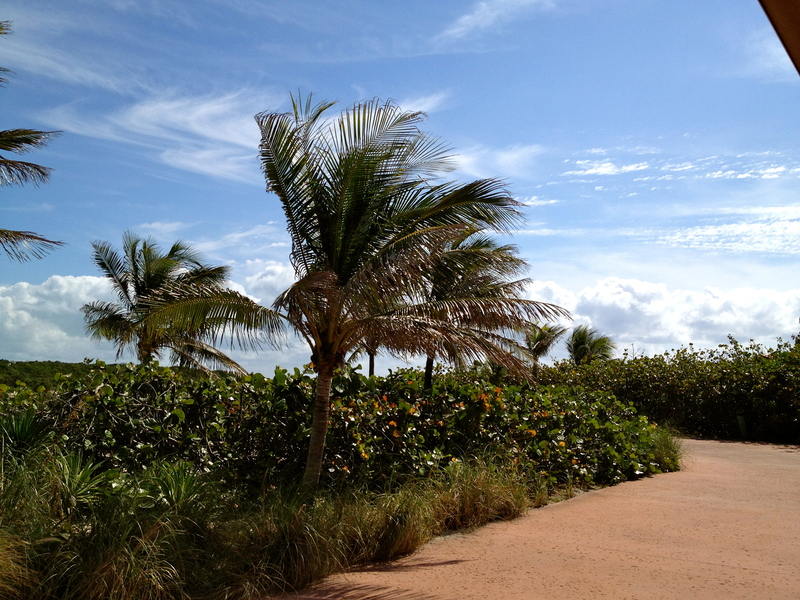 Paradise I tell you! We woke up early and had breakfast in our room. Look at that view! 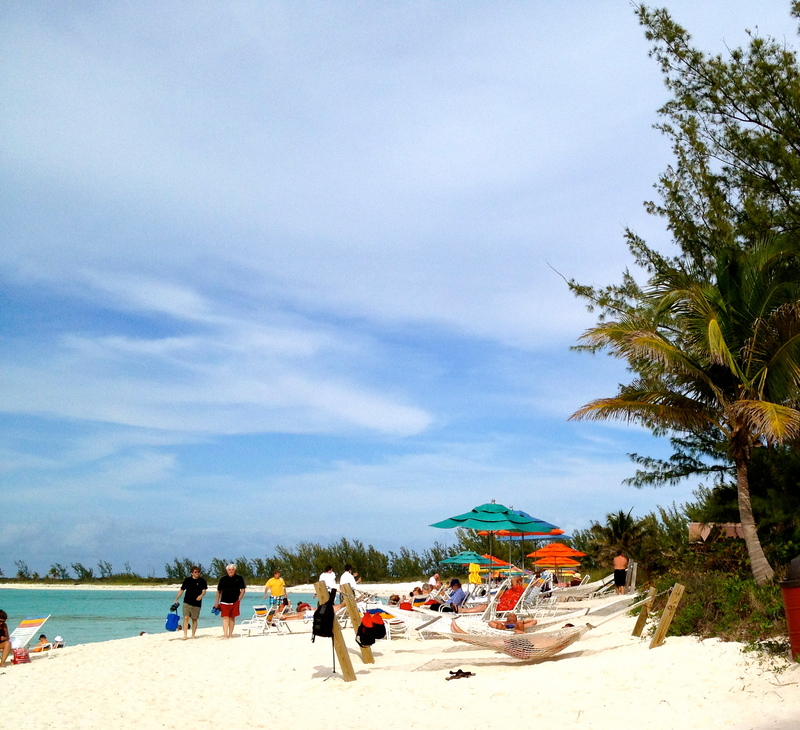 Just as we were about to put on our swim suits and SPF, a message came over the loud speaker. It was the captain telling us they were having technical difficulties. Boo! So there was a 2 hour delay getting to the island. One of the ships’ side thrusters (used instead of tug boats) was malfunctioning. 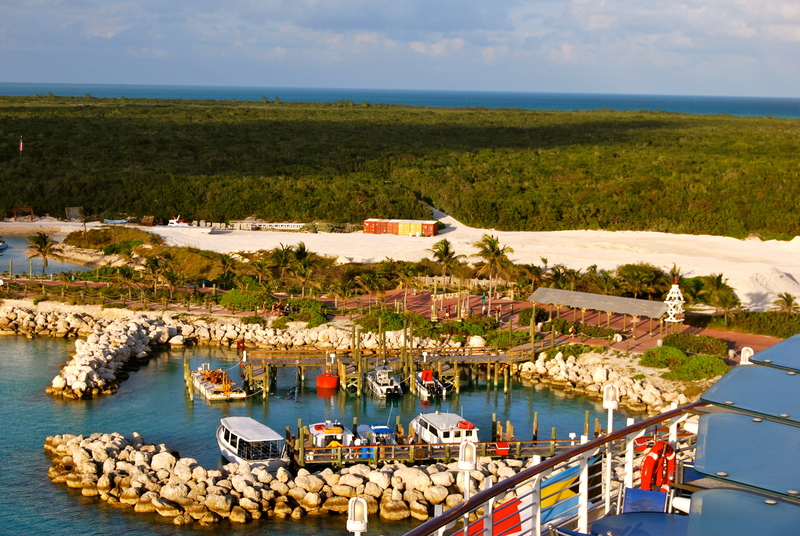 They got it running again and the next thing you know we were docked at Castaway Cay! We got off the boat and went to wait for the tram. 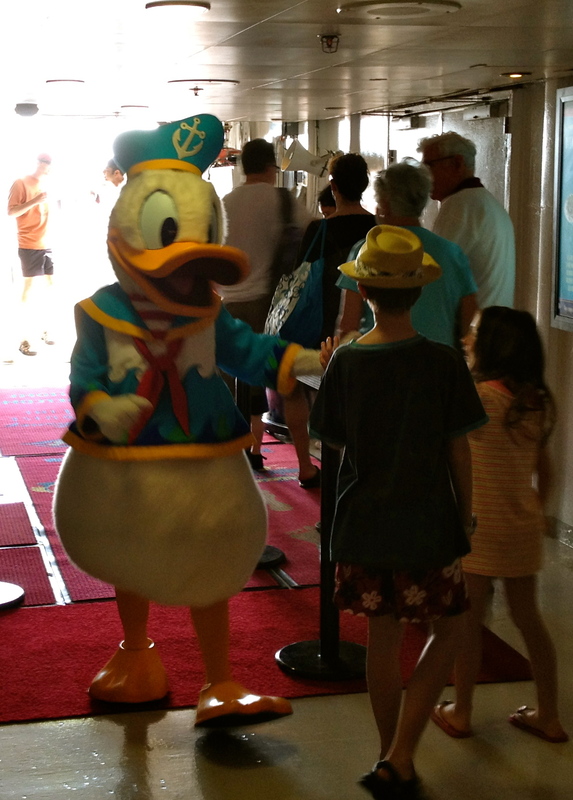 On the way to the gangplank we ran into Donald. 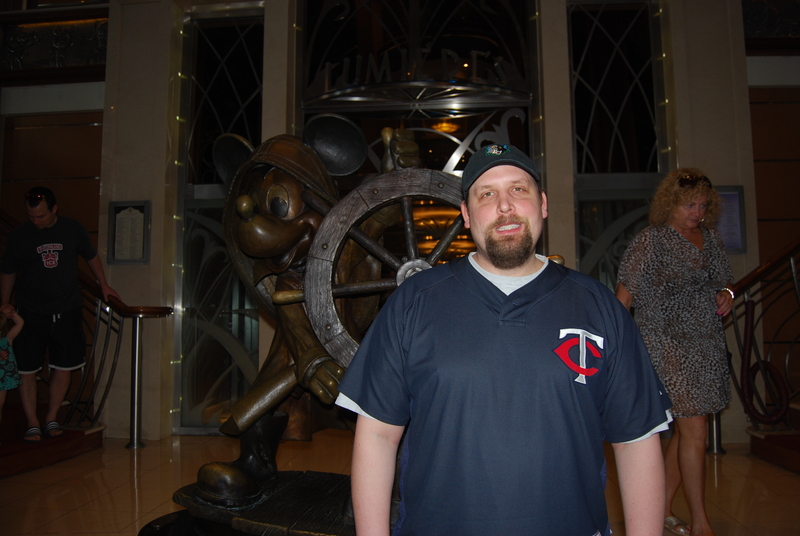 Then CSP got stopped by Minnesota people who recognized the TC (Twin Cities) on his shirt and had to talk baseball! We walked over to the tram station. On the way we passed the post office. 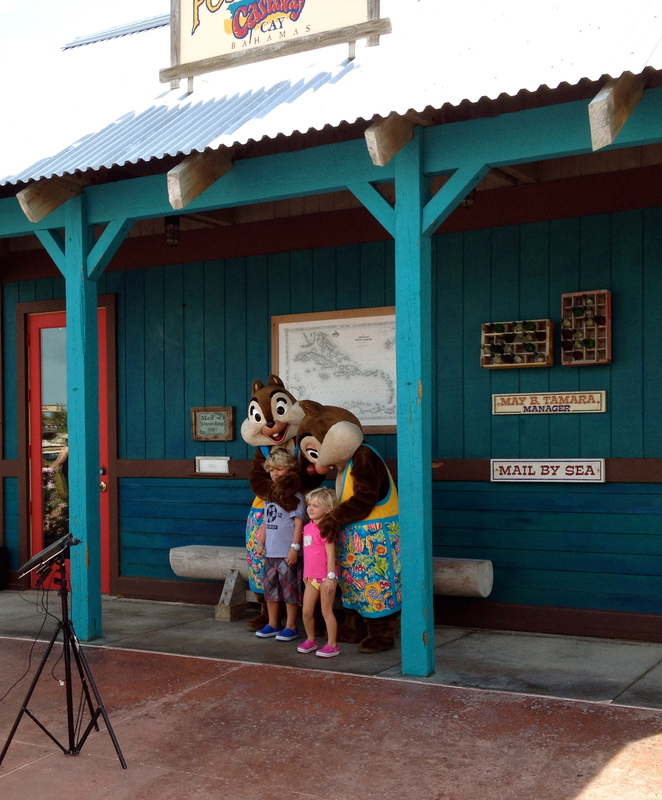 Chip and Dale were there! We took the tram (even the tram route is pretty) to Serenity Bay and got lunch(since it was so late now) before we picked out our chairs on the beach. Lunch was a buffet and I didn’t take pictures. But it was great! Mahi mahi, ribs, chicken, burgers, hot dogs, lots of different salads, fruit, ice cream even! CSP and I picked out our chairs (there are hammocks too!). I didn’t bring my good camera on the island so these are all iPhone pics, but not too shabby eh? This was the view from my chair. We went out into the cool water and swam and swam. Or bobbed and floated! 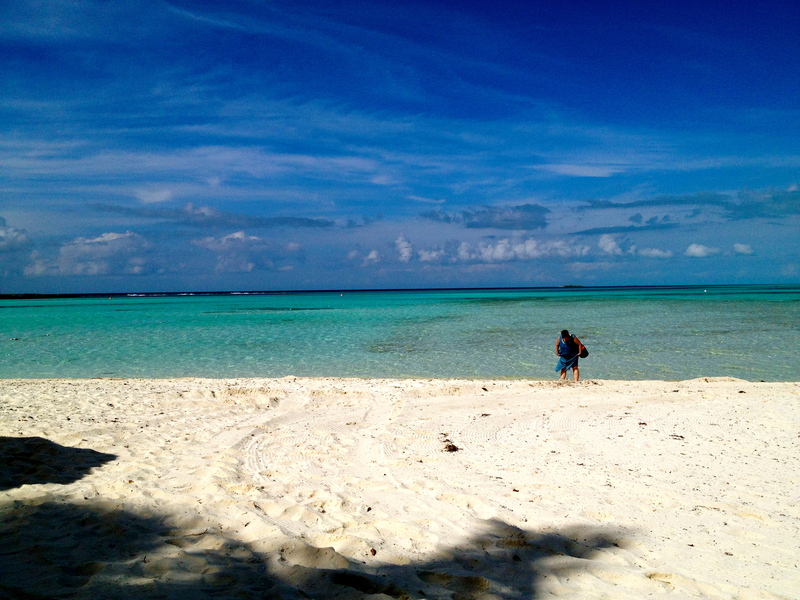 There were some snorkelers nearby who warned us of giant starfish and stingrays. We saw lots of fish and I was calling for a dolphin baby to come see me but no real wildlife. UNTIL…we decided to go chill out on the beach. 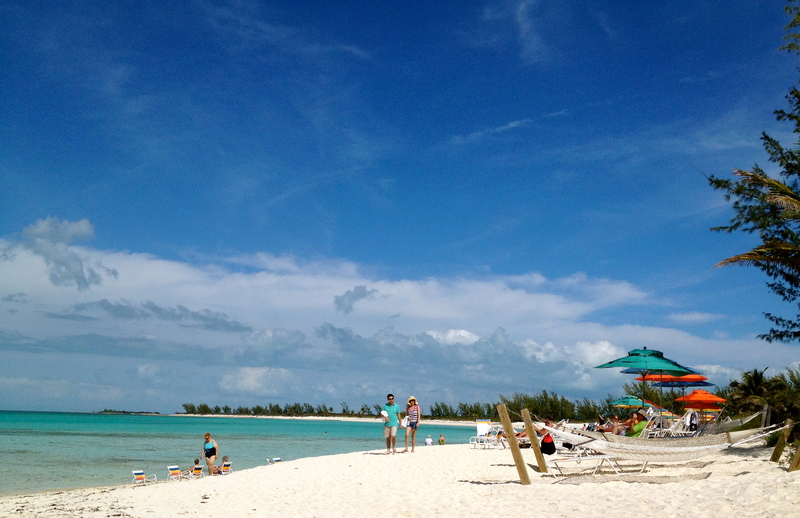 We were really far out in the water and were doing the stingray shuffle as to not step on one. I noticed some holes in the sand under our feet and pointed them out to CSP. I reached down to see what it was just as CSP saw the tail. It was a stingray! CSP started yelling “Crocodile Hunter!” and tackled me to get out of the way of the tiny baby stingray who just wanted to hang out with me! CSP is not a fan of wild animals. We made our way back to our chairs. CSP went and got us some cocktails. We relaxed on our chairs for a while. Reading books and I may have nodded off a bit. We eventually noticed people making their way back to the ship so we packed up and hopped back on the tram. Back on the ship we went up on deck to get some shots of the island. 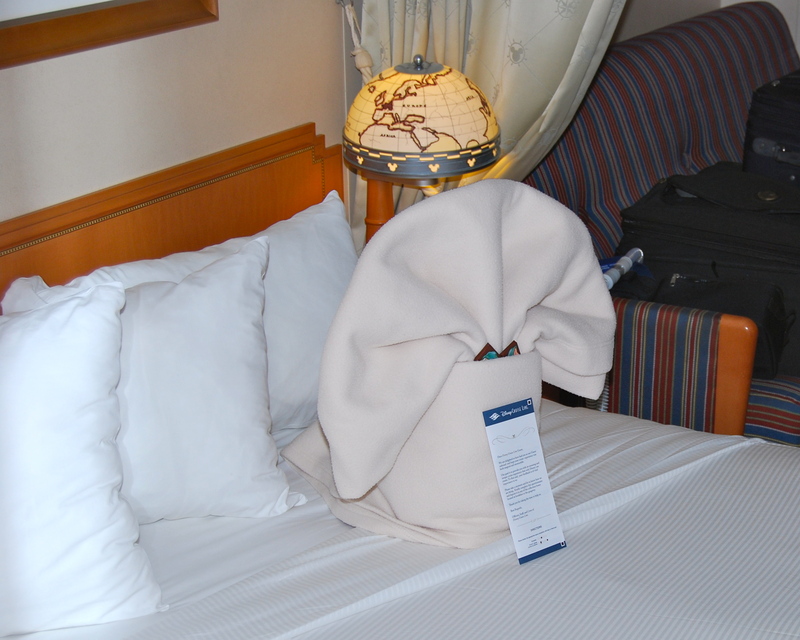 We went back to the room and packed up our luggage since this was our last night on the cruise. 😦 Then we got ready for dinner. 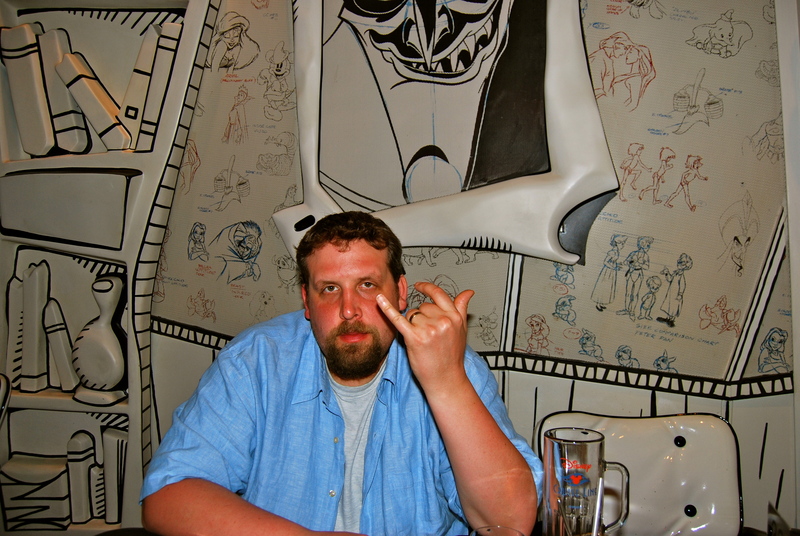 Dinner tonight was in Animator’s Palate. 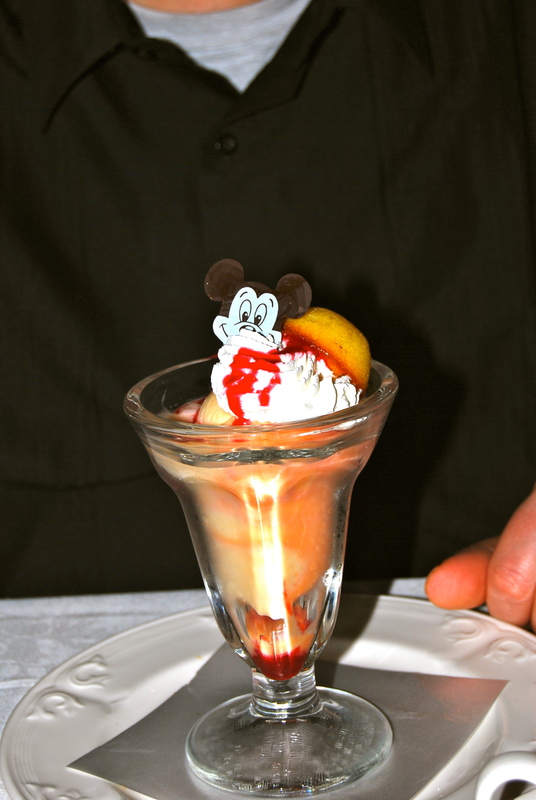 We haven’t been to Animator’s Palate since the first night of the cruise. 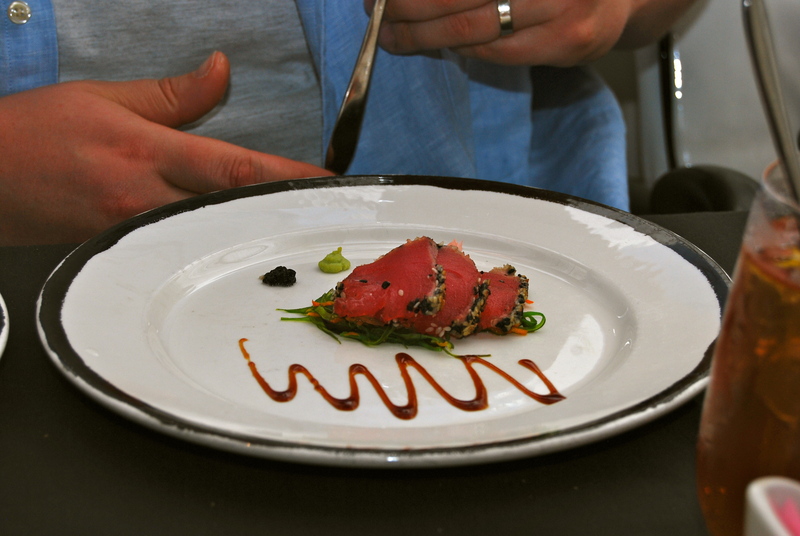 CSP’s appetizer was a sesame seared tuna tartare. So pretty! He also had some sort of seafood mixture. 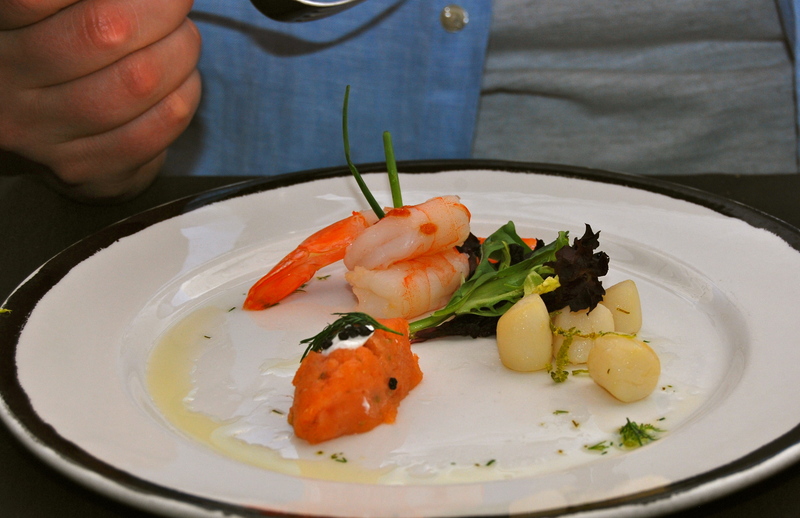 I can tell that’s shrimp and scallops and maybe salmon. Not sure why I didn’t write this down. 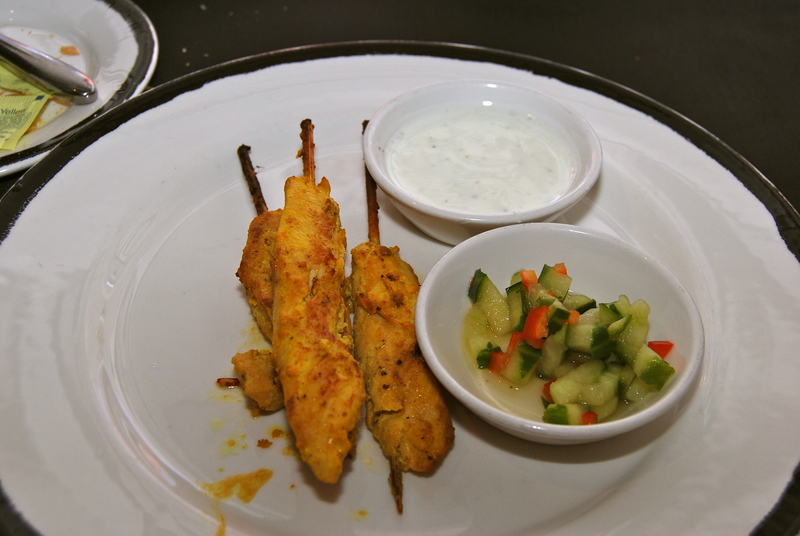 I had the chicken sate . If you’re wondering how I remembered all the things we ate, I brought a tiny notebook and put it in my purse. Then after we ordered I’d write down everything we ordered. Just before bed I’d write down everything we did that day. There’s no way I’d remember everything on my own! We both had soup- CSP had lobster and crawfish bisque while I had potato leek soup. 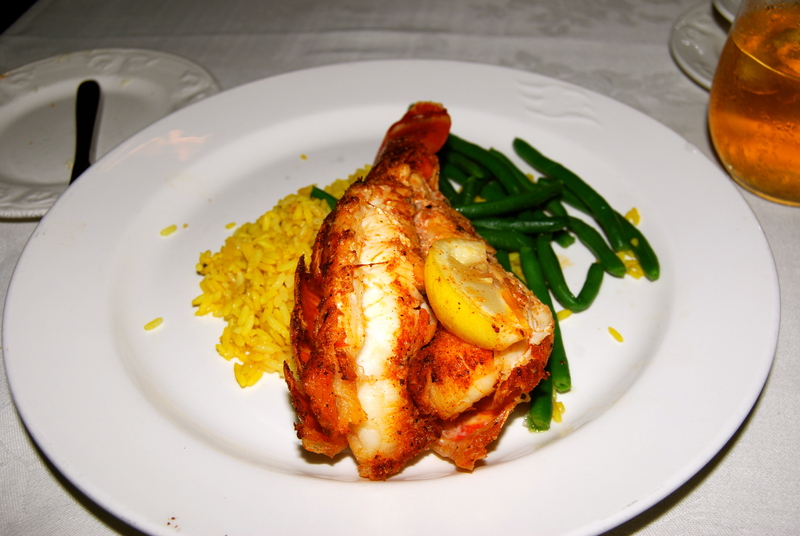 Our entrees included orange roughy stuffed with crab for CSP and seafood pasta for me. Lobster, scallops, shrimp and clams. I put those clams on CSP’s plate immediately. I can’t stand the idea of their shells touching my food! 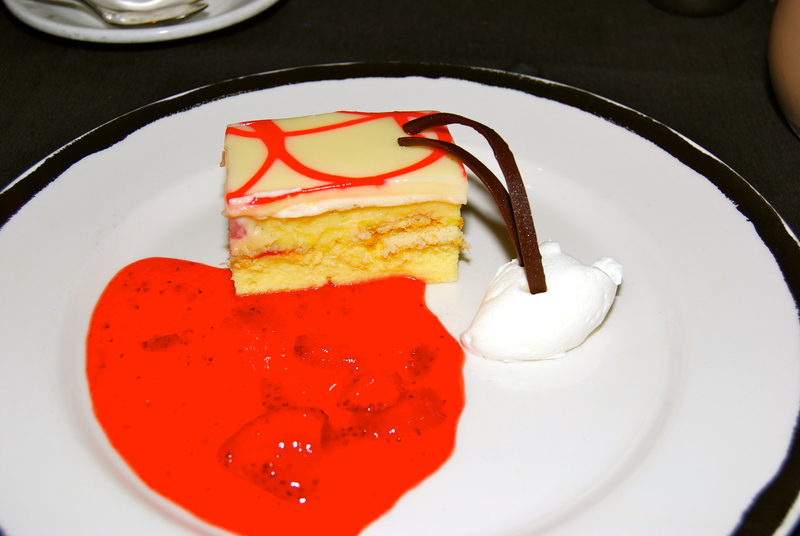 Dessert was a yummy strawberry and creme cake called Celebration Cake for me and the trio for CSP. 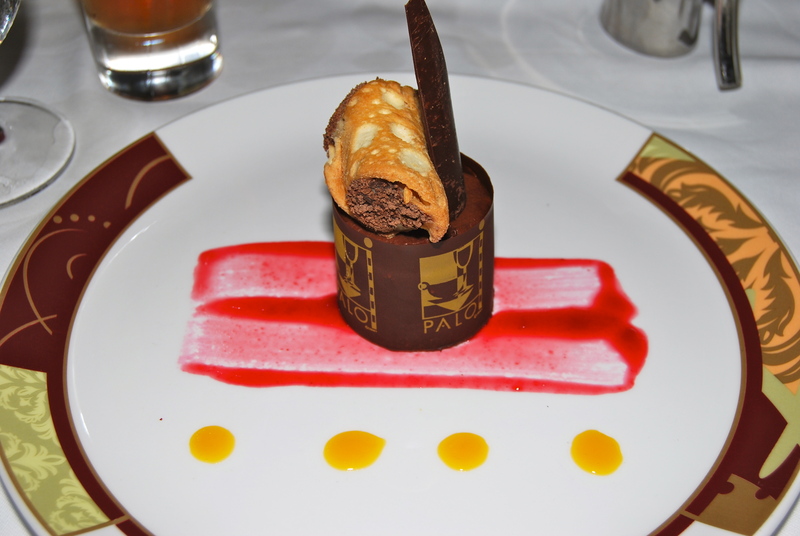 It included chocolate mousse,a chocolate tart and a little celebration cake. During dinner service there was a little show. The man waving is Val, our waiter. We love Val. He’s from Romania and his wife works on the ship too. 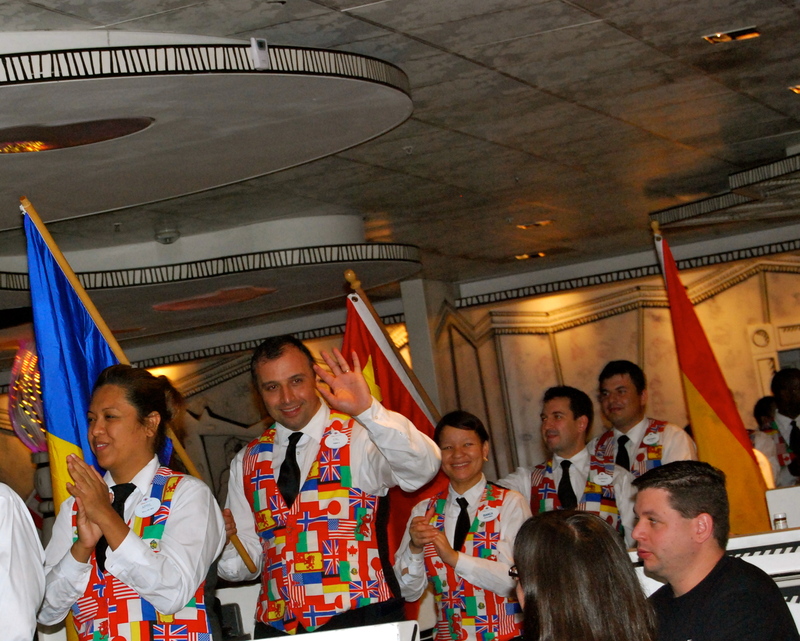 There are over 55 countries represented in the dining staff alone! After dinner we went back to our room and went right to bed because tomorrow we have to get up early for breakfast and debarkation! 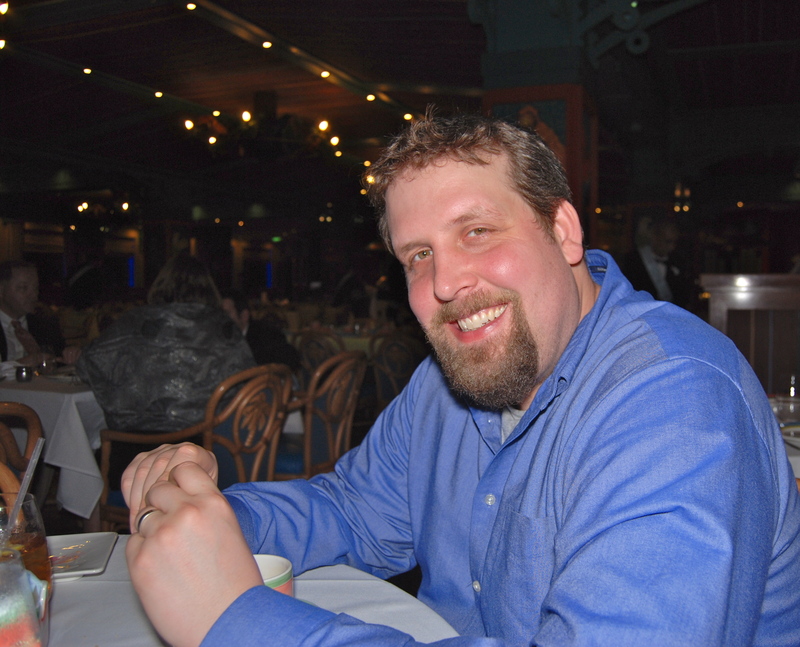 Thursday, February 2, 2012. Last Sea Day. I can’t remember exactly when during the trip, but we watched a ton of movies. Mostly just before bed. Included in these are Apollo 18, Puss in Boots, Cowboys & Aliens, and the end of Dolphin Tale. 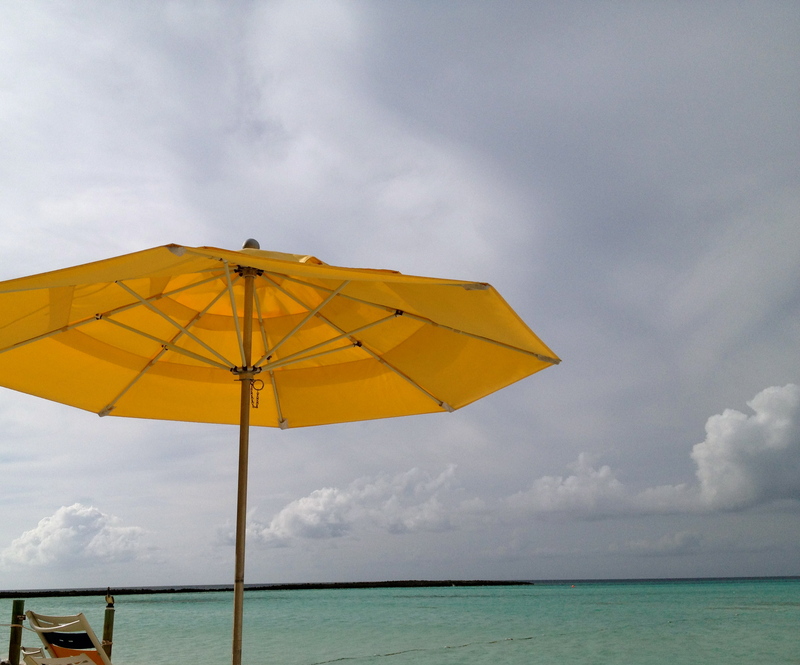 Today was our last sea day. I love sea days. 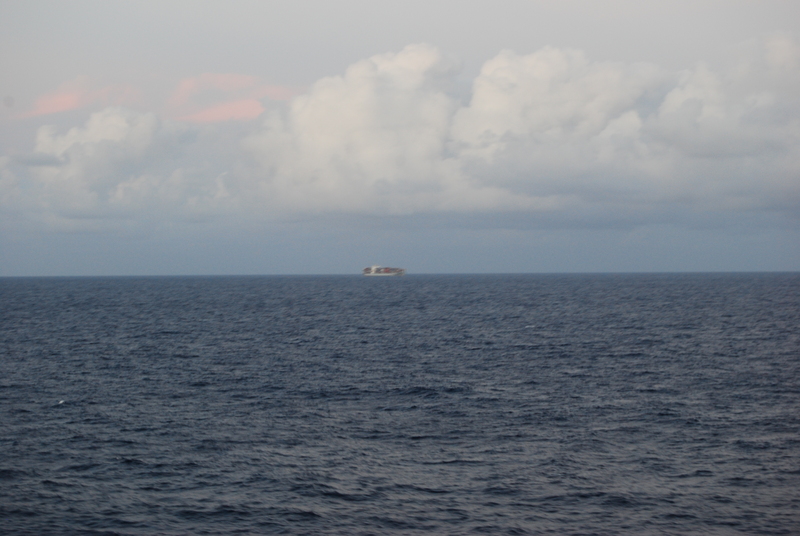 It’s so odd to me that we can be all the way out there in the ocean and see literally NOTHING. No land, no ships, no nothing. Except if you look closely you can see another cruise ship on the horizon. Didn’t happen often so when we’d see one we’d try and capture it. 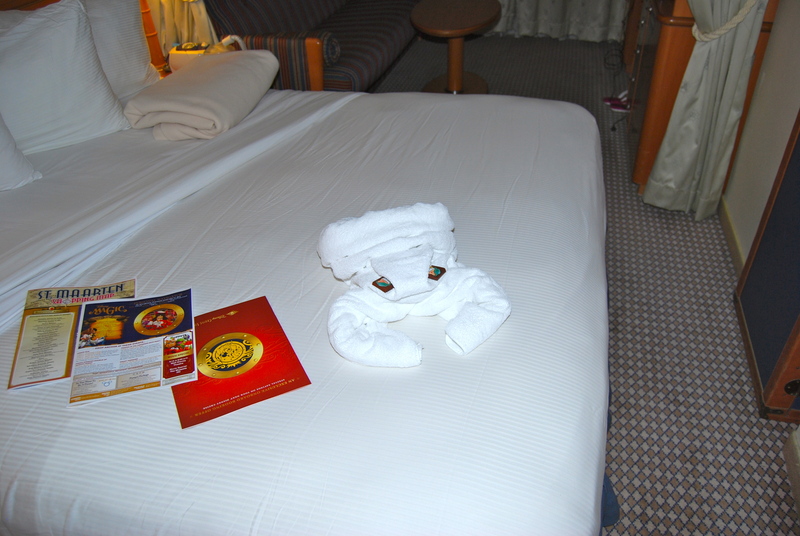 And by the way, I get the best sleep of my life on a cruise ship. It’s the gentle rocking I think. 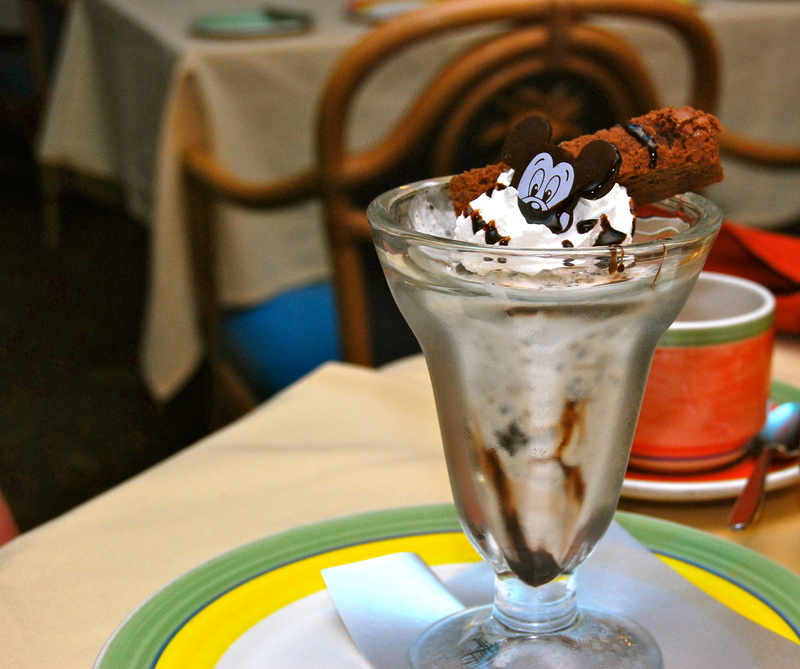 Today we slept late, skipped breakfast and went to Lumiere’s for lunch. 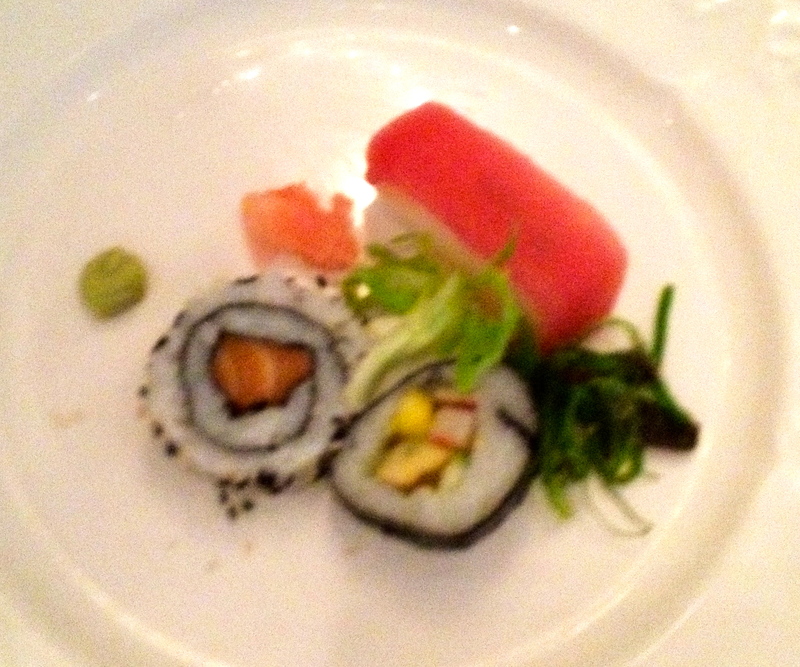 CSP had sushi. I think sushi is so beautiful. 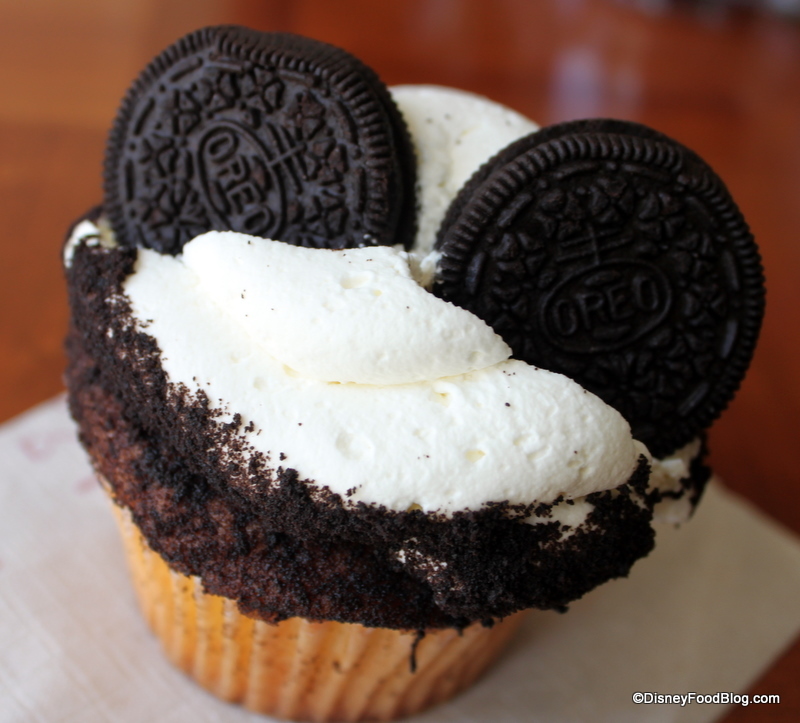 I wish I wanted to eat it! Ha! He also had a salmon cake and salmon over risotto. The man has been putting down some fish! I had fruit, then a pear/nut salad, and a burger. CSP ate my fries since they were the big fat ones. I like skinny fries. 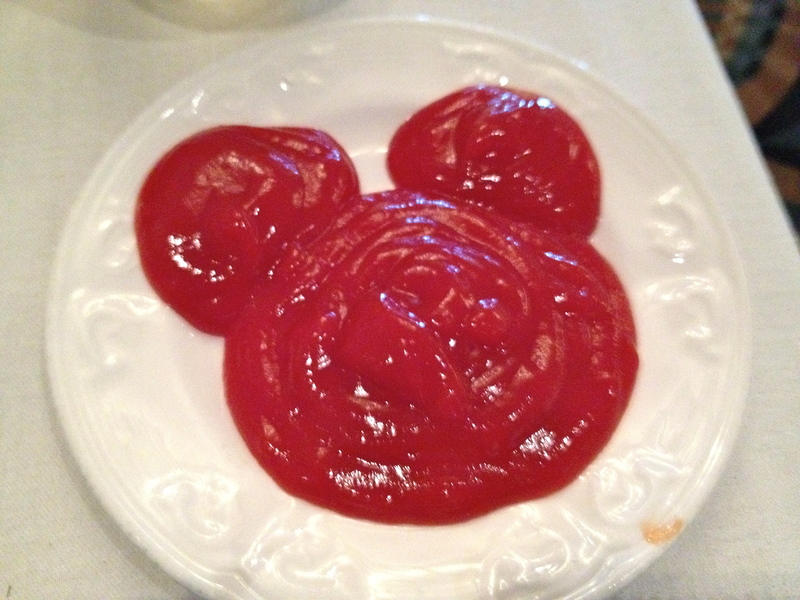 I asked for ketchup and this is what the server gave me. So cute! After lunch we went back to the cabin and read books on the balcony. Then I delivered my Fish Extender gifts. That took a good while of touring all over the ship. After a short nap it was time to get ready for dinner and the show. I finished my bottle of wine tonight. SO good. Thank you Christina! Tonight’s show was Dreams. We’ve seen this one before. It’s really good. All about believing in your dreams. After the show we stopped into Diversions so CSP could have a beer. Diversions is the sports/games bar. It’s family friendly until 9pm. They also have a little buffet with nachos and wings on it. CSP liked the wings. Tonight was semi formal night. 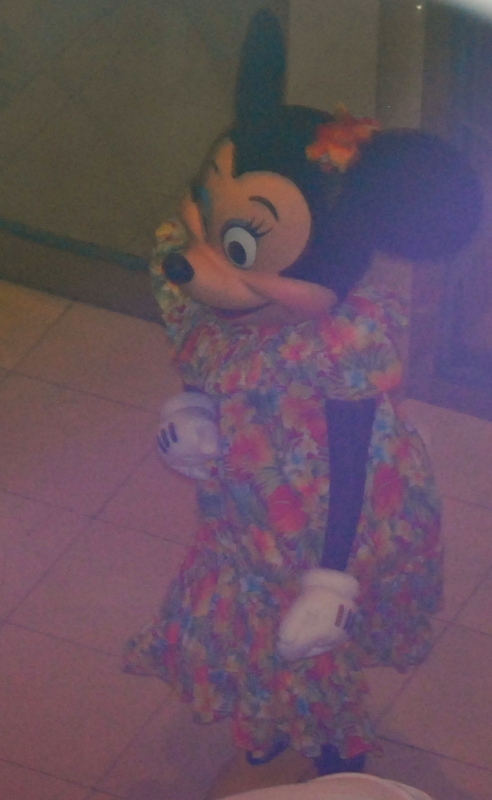 Minnie was all dressed up again. 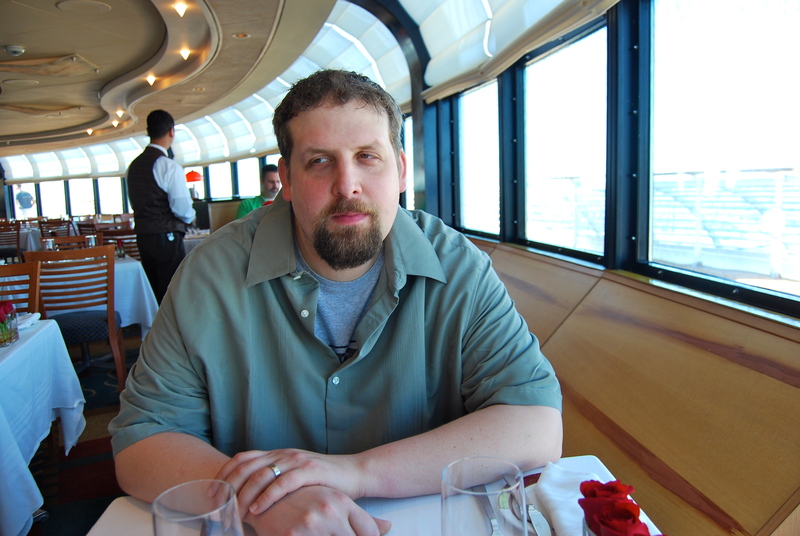 It’s so interesting to me what people wear on cruises these days. When I was 7 I went on my first cruise. Back then people REALLY dressed for dinner. And formal and semi-formal nights meant tuxedos and suits and fancy dresses. 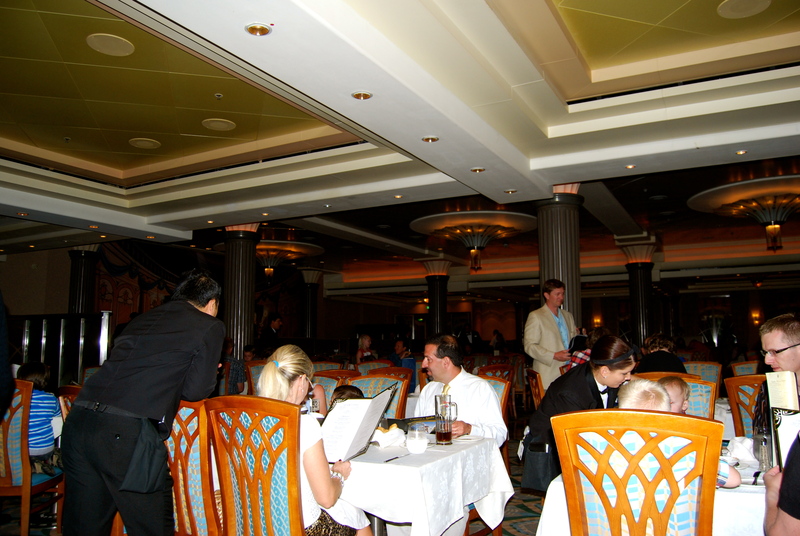 Some people on this cruise still fancied up but there were some who wore beach wear into the dining room for dinner! 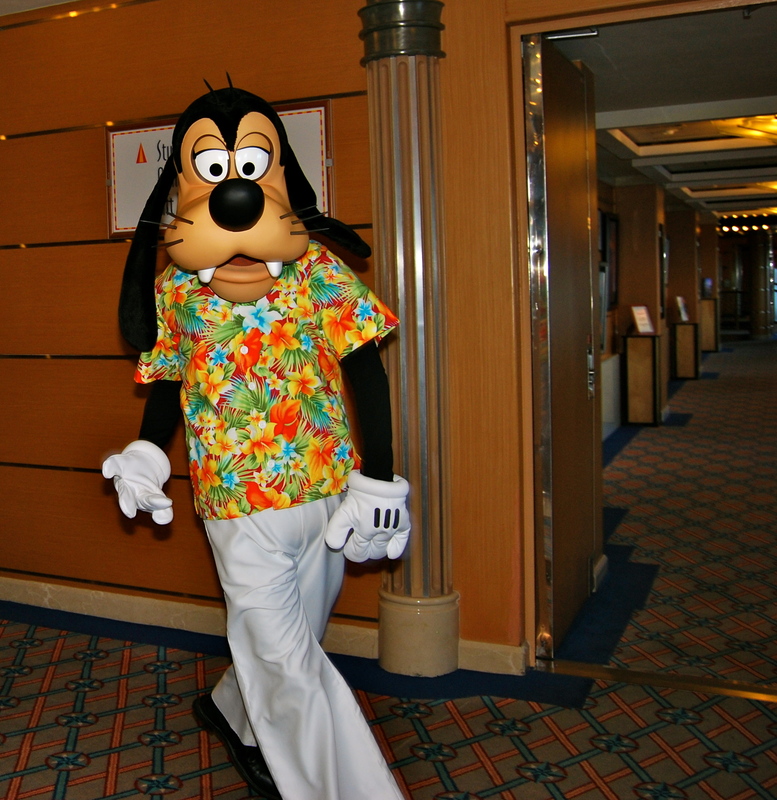 Disney asks that no flip flops or shorts or beachwear be worn into the nice dining rooms. I think it makes it more special when you put a little effort into it. 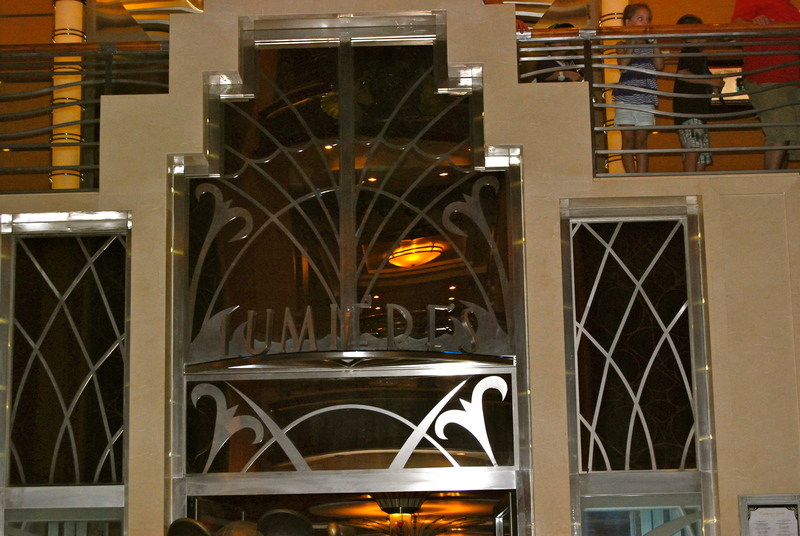 Anyway, tonight’s dinner was at Lumiere’s. 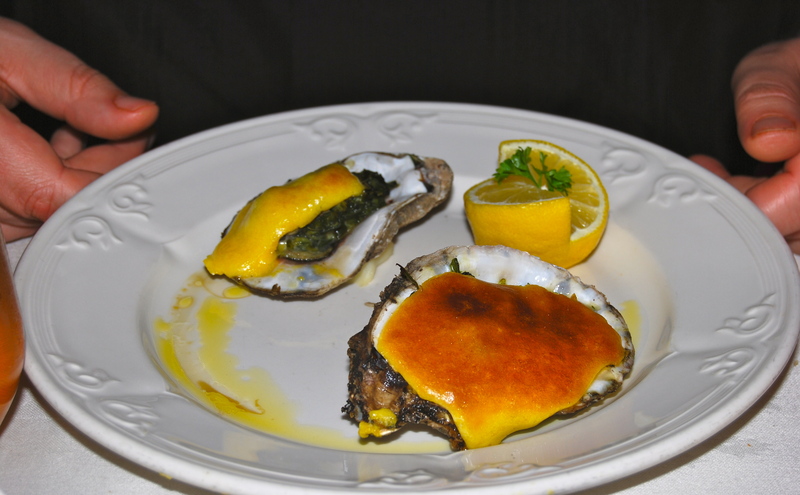 CSP started with oysters rockefeller while I had some grilled shrimp. We both enjoyed the wild mushroom soup. Tonight was lobster night! We both got the lobster tail with green beans and rice. 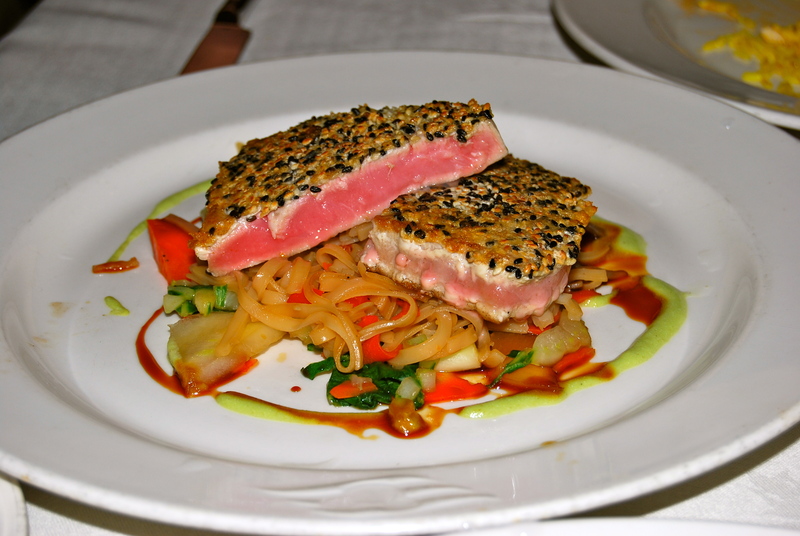 CSP also got the sesame seared tuna. He actually liked the tuna better than the lobster! It is really pretty! For dessert CSP had the tropical sundae and I had the trio- coconut macaroon, amaretto cheesecake, and banana creme brulee. So yum! After dinner we went to Rockin Bar B to see the adult show of Buckets N Boards. Not sure what was adult about it except there were no kids there. It’s not like they tell dirty jokes or drum more sexily. ha! This show was really funny and we had a great time. 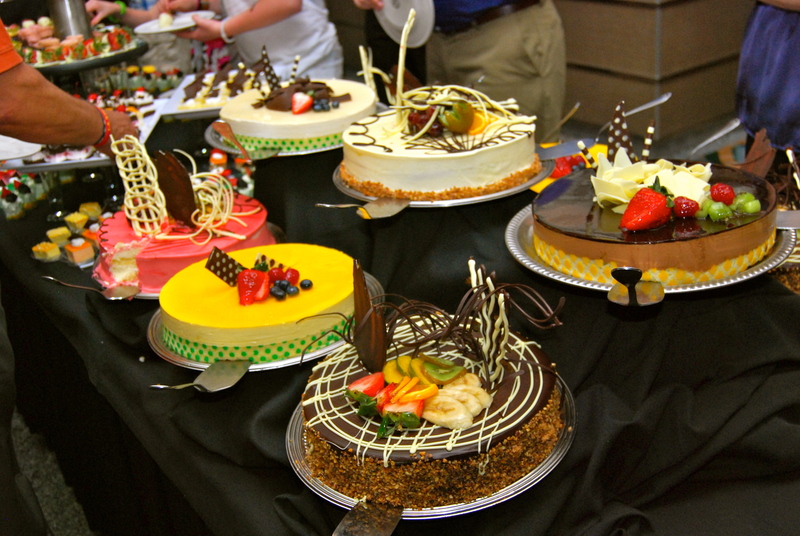 Tonight was the late night dessert buffet. We were really close to the front of the line so I was able to get some pictures before it was picked over. So gorgeous! 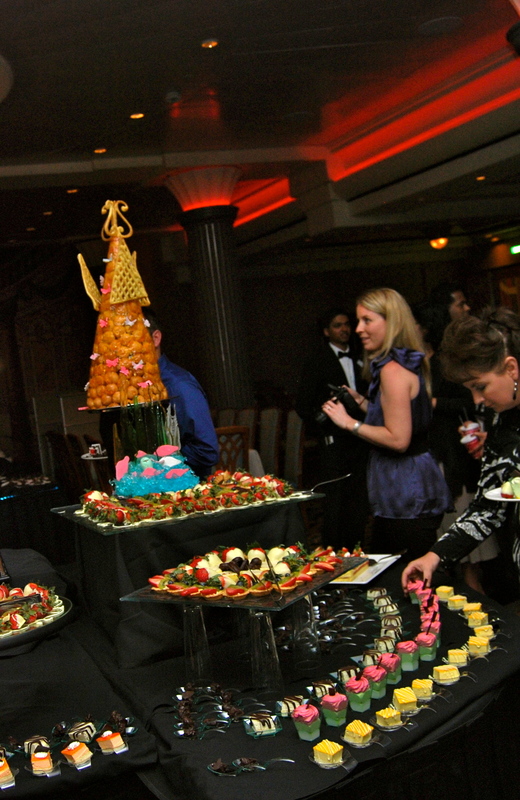 Once we were finished ogling the desserts we went straight to bed. We were so excited for tomorrow! 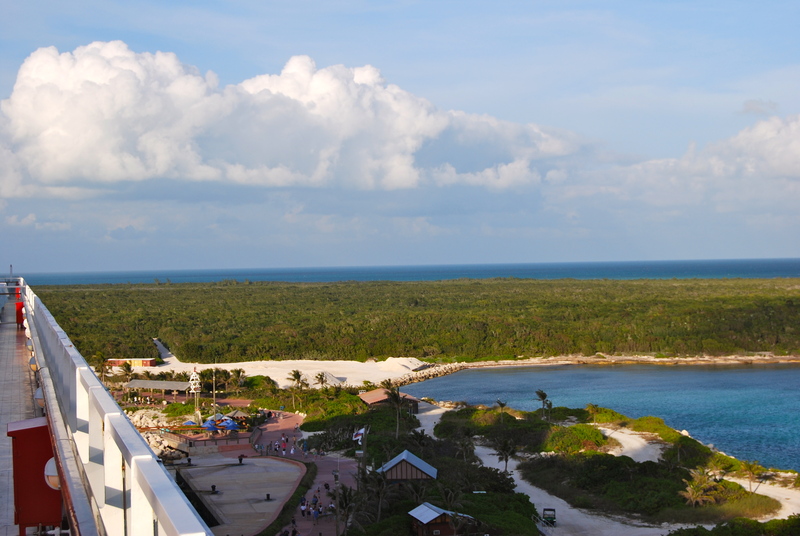 Castaway Cay day! Wednesday, February 1, 2012. 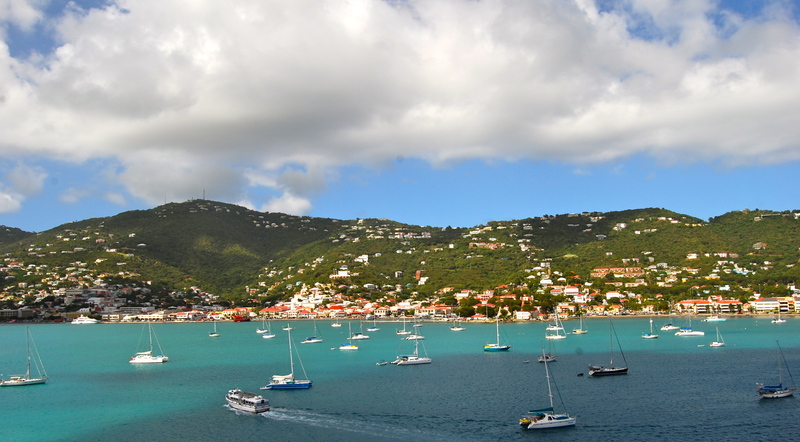 St. Thomas. 1. 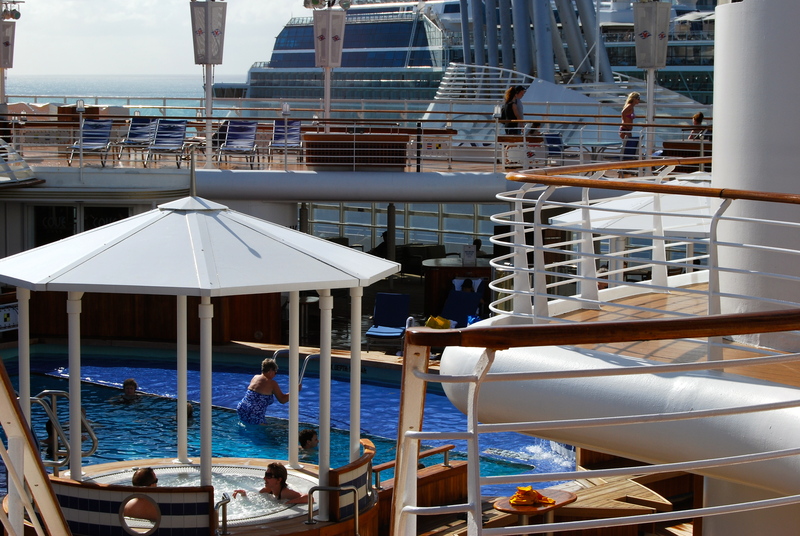 You get a 10% discount off your next cruise if you book while on board. 2. 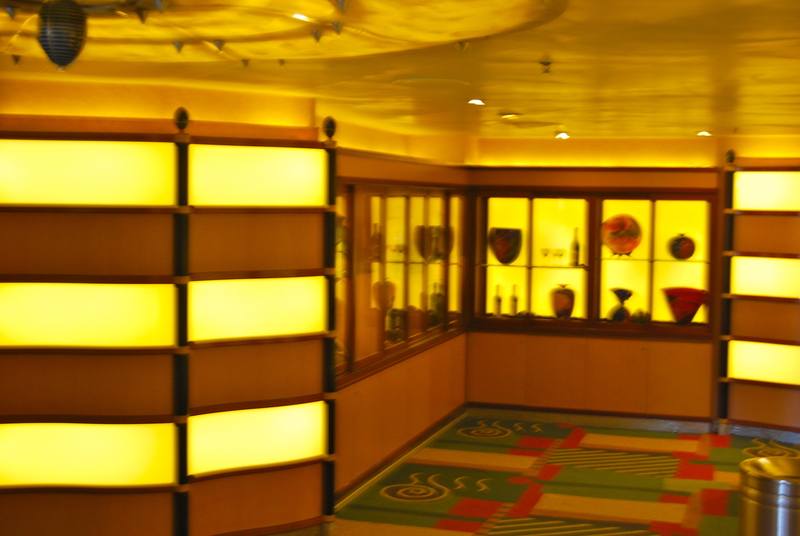 You get up to a $200 stateroom credit, which you can use on things like Palo or souvenirs in the gift shop, etc. 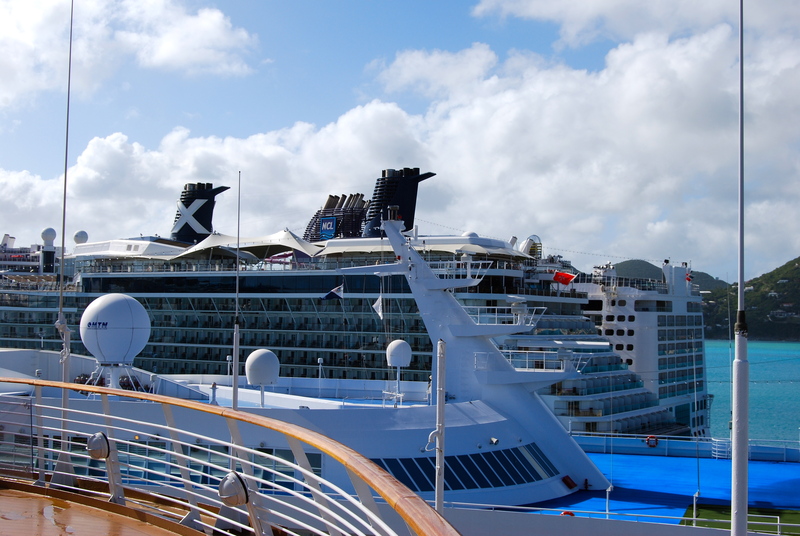 You get $200 if you book a 7 night or longer cruise and $100 if it is shorter than 7 nights. We got the $100 credit. That will take care of all our Palo visits next time! 3. You only have to put 10% down instead of the standard 20% as your deposit. Now, you might be wondering “if you book onboard how can Lisa still be in charge of your cruise?”. I wondered that myself. 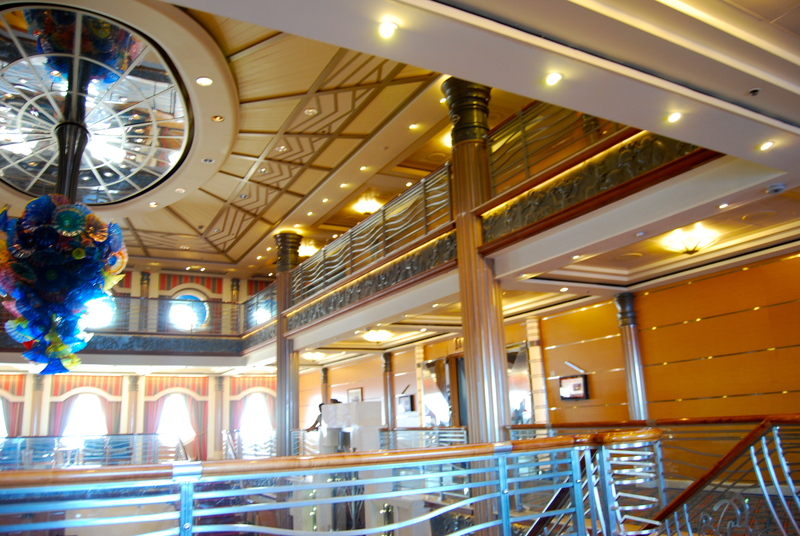 But I asked Lisa about it before we boarded the ship and she told me what to do. 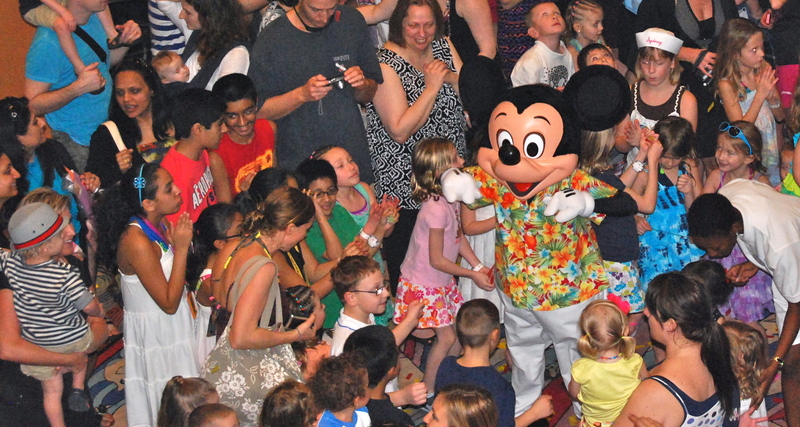 All you have to do is tell the booking agent onboard that you want your booking attached to your personal Disney travel agent Lisa Reese with Pixie & Pirate Destinations. 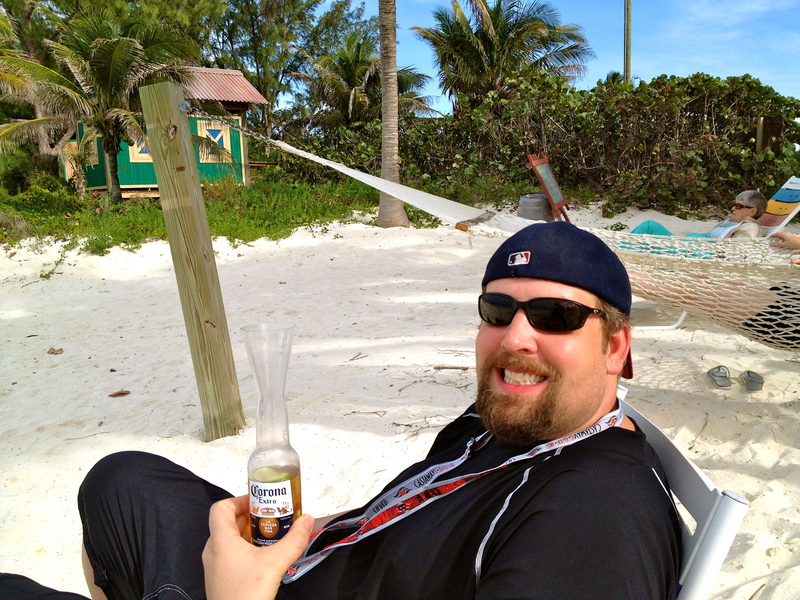 Sure enough, Lisa received an email about our booking before our cruise was even over! You might also be wondering “what if plans change and we have to move our reservation?” No problem. Just book onboard, get the discounts, and then you can move it around when you get home if you need to. We might have to change our date based on CSP’s work schedule, but Lisa can handle that for us when/if it happens. Ok, back to the trip report! 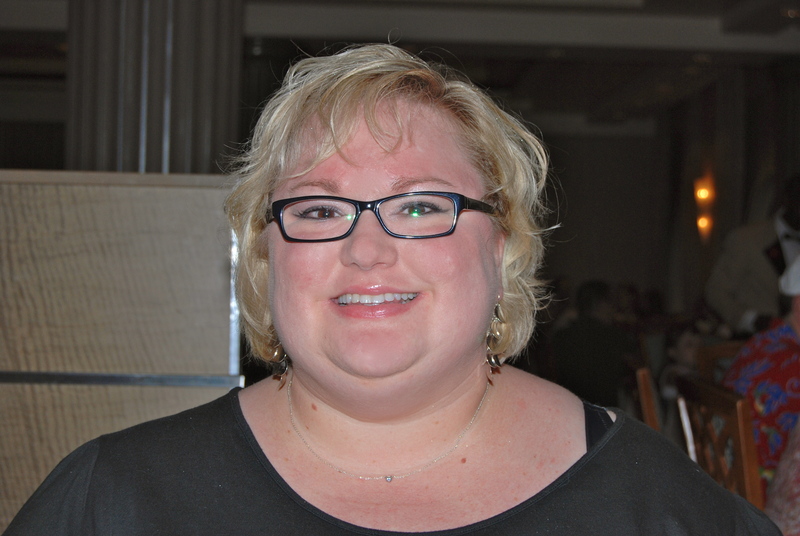 Remember to click on the photos to enlarge them. Today was much like yesterday. 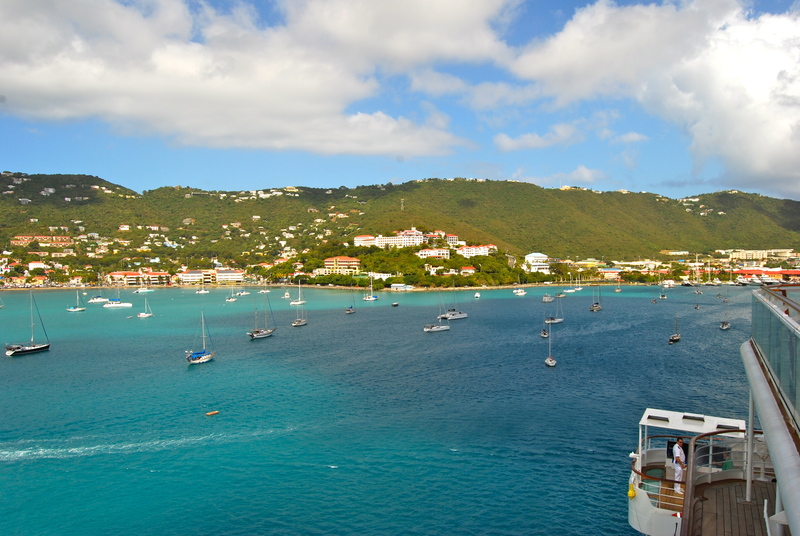 It was a port day (St. Thomas) and we’ve already been here so we chose to stay onboard again. We woke up to breakfast in our room (by the way, that does not cost extra), then went up to the pool/hot tub for a few hours. 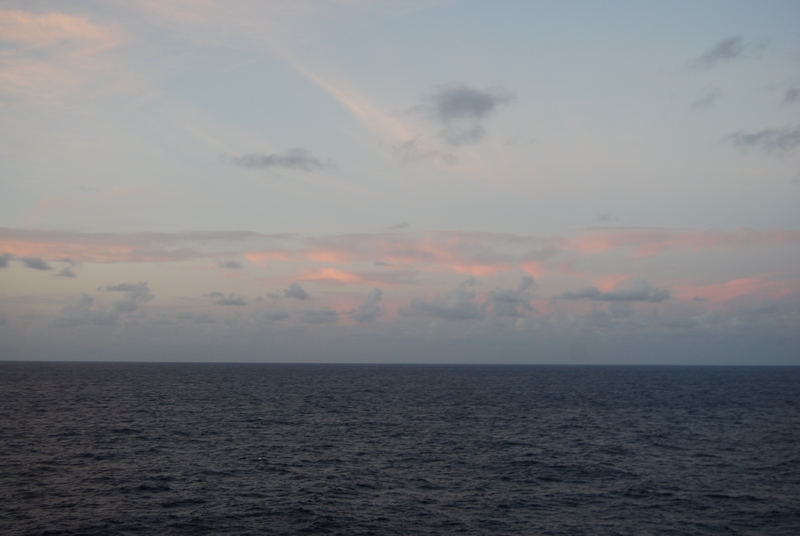 We really like being able to see the sunrise out over the ocean! 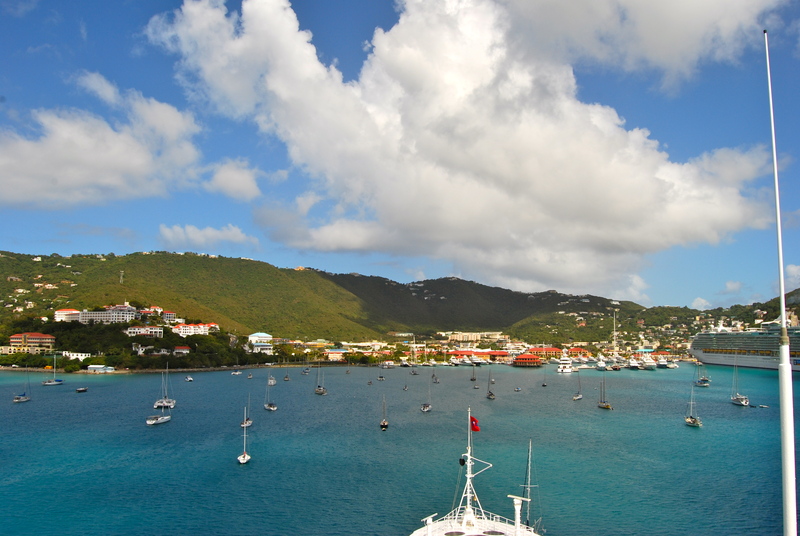 St. Thomas was so cute with all the sailboats in the harbor. Some ships bigger than others! Ha! 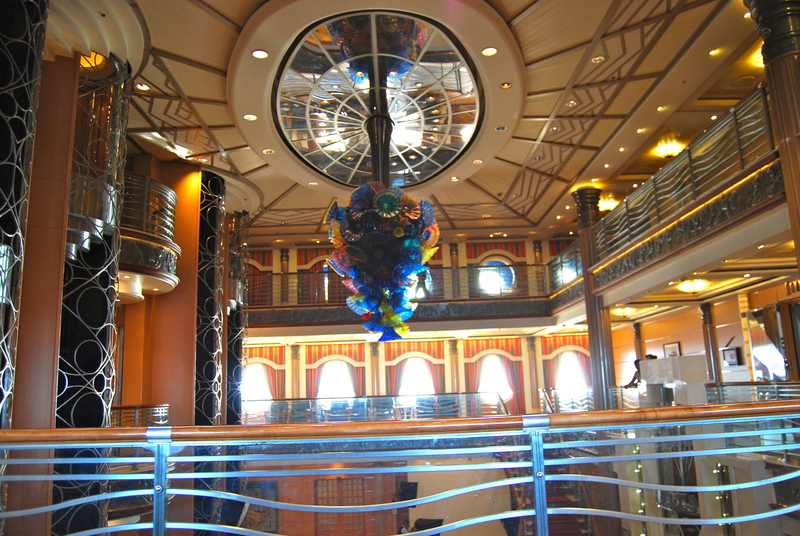 Our ship was the prettiest of all though. 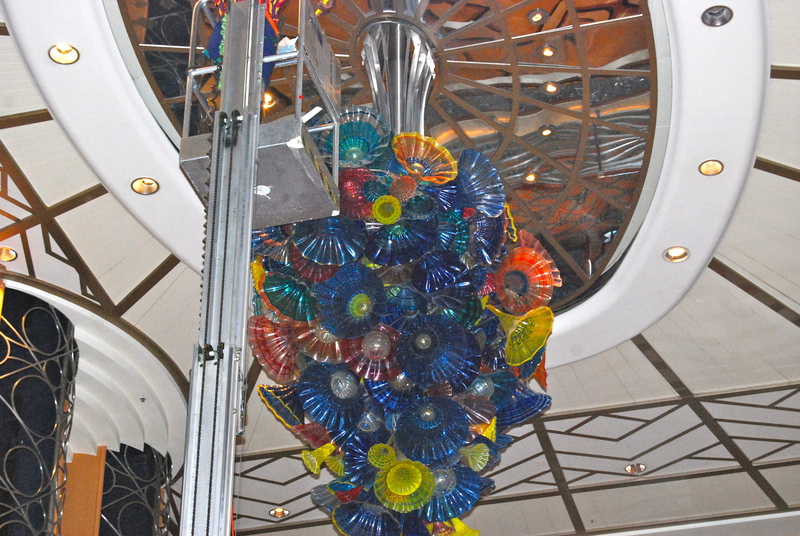 As we were walking through the ship we noticed they were cleaning the HUGE glass sculpture in the main lobby. Amazingly delicate work. 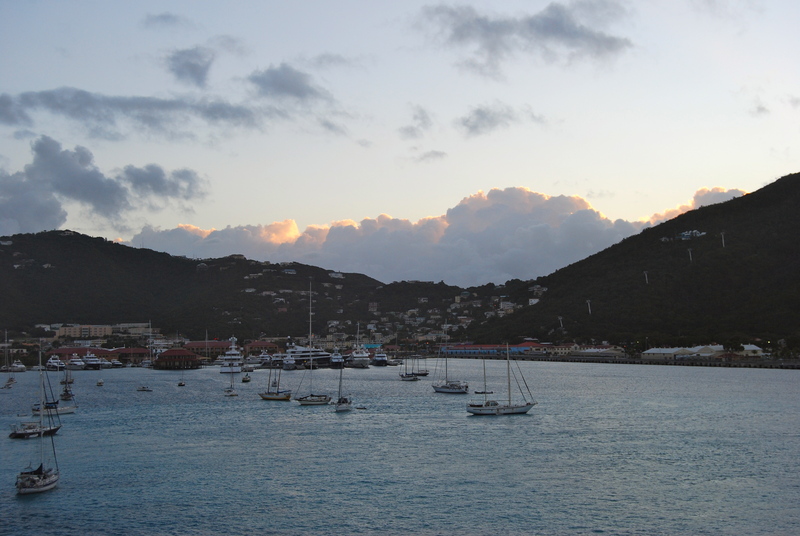 Now for some pics of St. Thomas and around the ship. 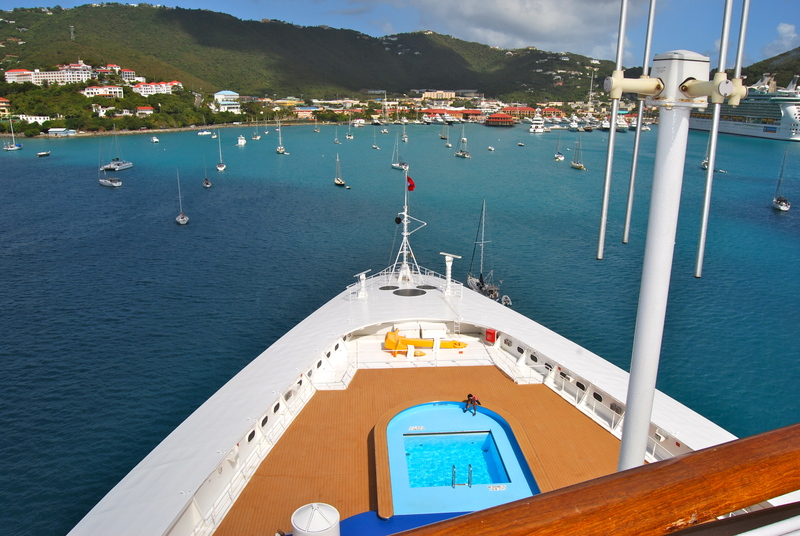 This is the crew pool. We never saw anyone in it. Up on the sports deck. I just love all the blues in the water. 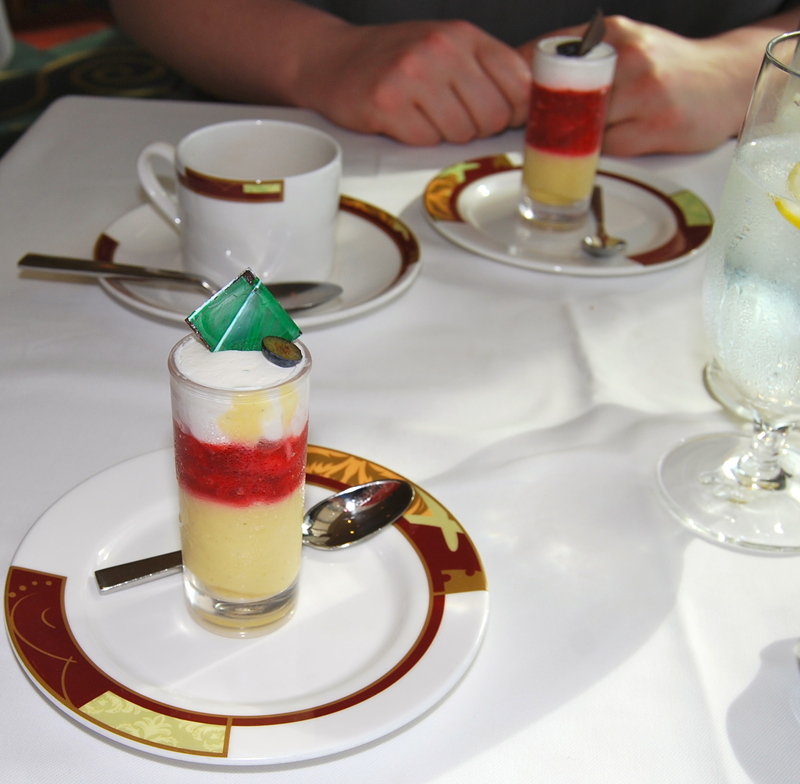 After the pool and walking around the ship we changed clothes and went to Lumiere’s for lunch. I forgot to take pictures of our lunch somehow. 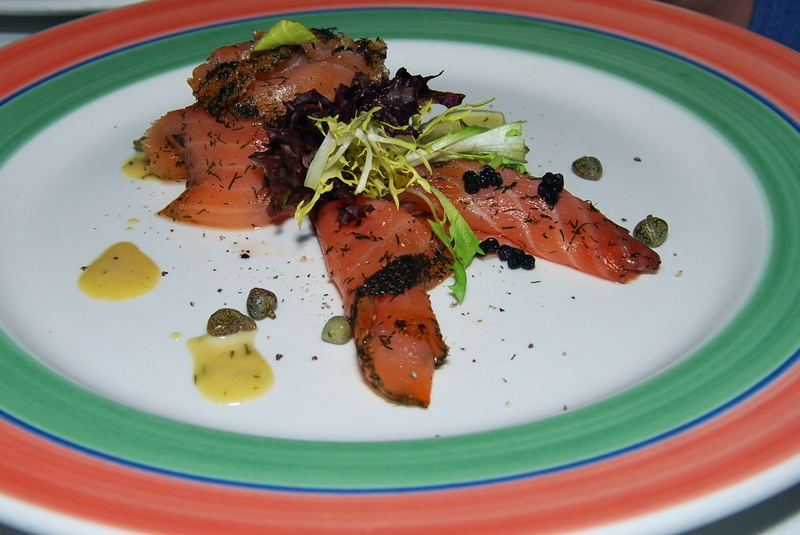 CSP had marinated salmon for his appetizer. 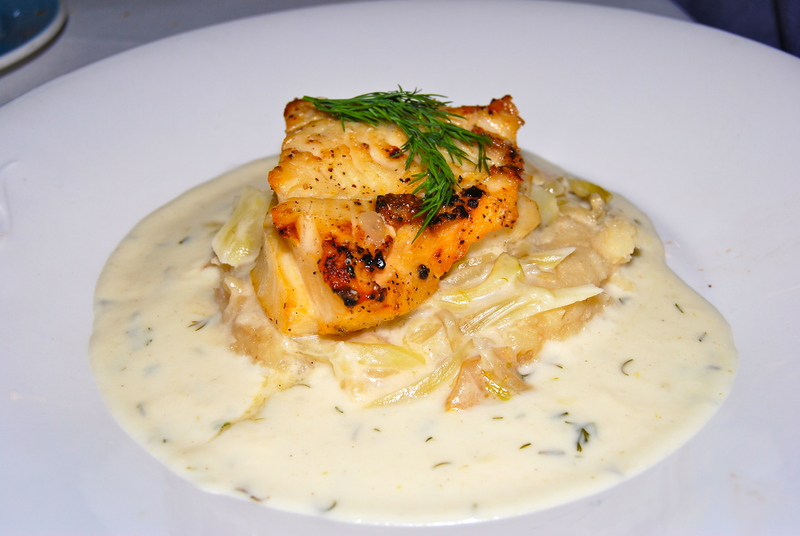 His entree was tilapia with carmelized onions on cheese grits. I had shrimp cocktail, tangerine soup, steak and fries. We were seated next to this couple and their two adorable daughters. 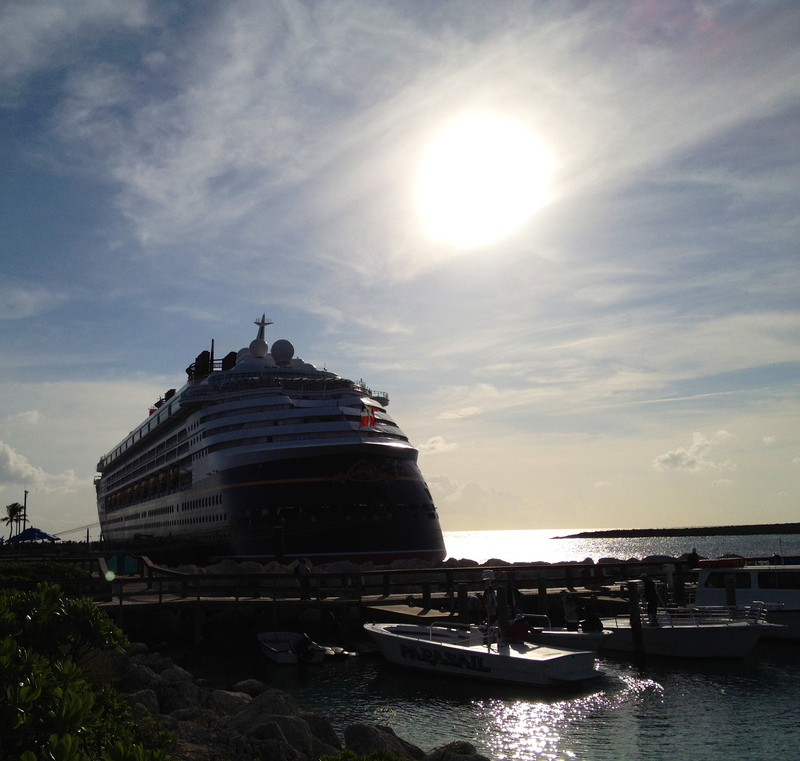 I can’t wait to be able to bring our kids on a Disney cruise! 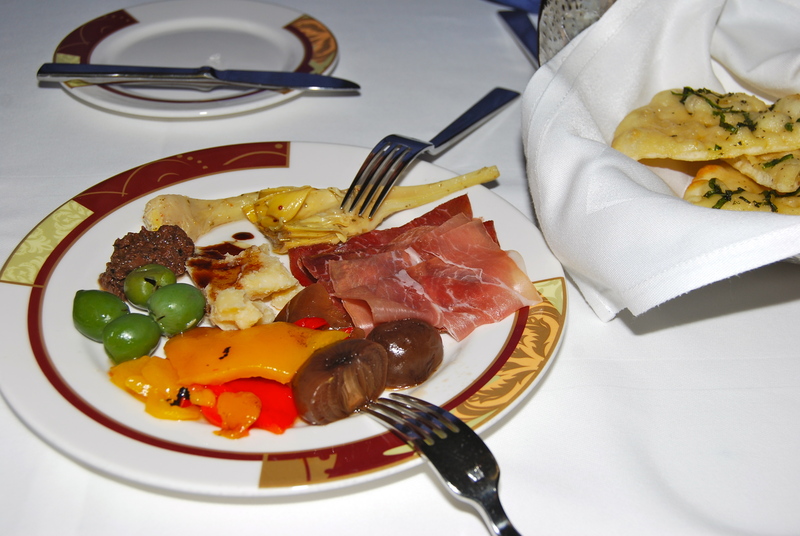 The food is just so much better in the sit down restaurants versus the buffets. But when you’re in the pool and lose track of time, sometimes the buffets are your only option. After lunch we went back to the room for our afternoon nap then woke up in time to watch the ships pull out of port from our balcony. 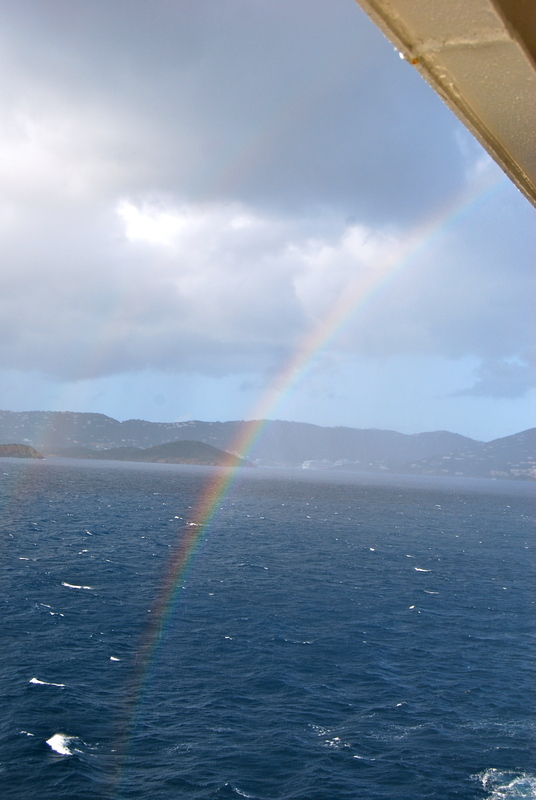 It was raining lightly and all the sudden a double rainbow appeared! It was SO vivid and gorgeous and I just hope it conveys in the pictures. Next thing you know it was time to get ready for dinner and the show. The show tonight was really neat. It was Buckets N Boards. 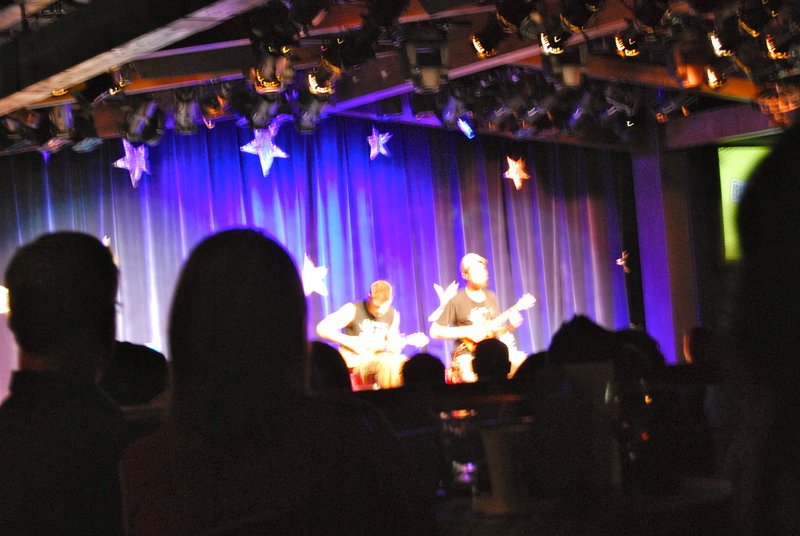 They tap dance, play drums on buckets, and they are a comedy show. Kind of like Stomp lite. They are really talented. After the show we went to Diversions for cocktails again. I know I keep saying that but what it really means is CSP gets a beer in his refillable mug and I get either a ginger ale or orange juice to mix with my whipped cream vodka. I very rarely drink so it’s a huge treat to have a grown up drink at night. Although since I rarely drink I have a very low tolerance so my limit is one. 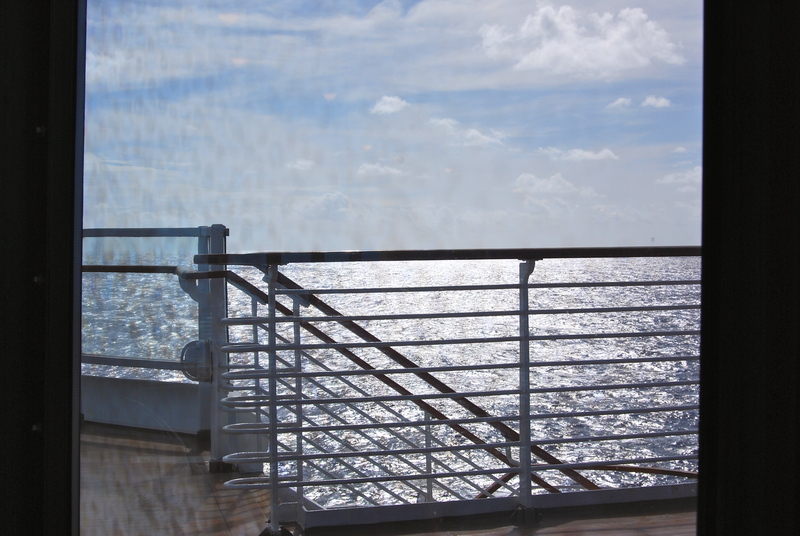 While we were in Diversions we saw through the window another cruise ship all lit up. 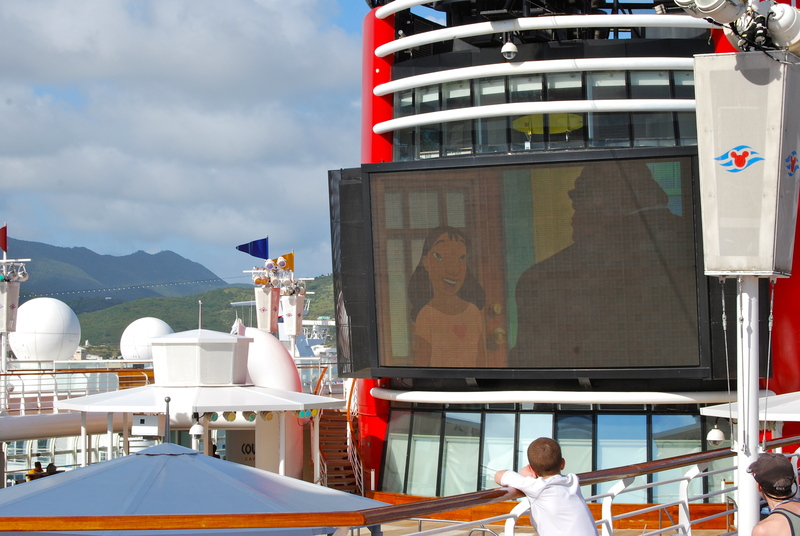 The crew told us last night that other cruise ships hang out to watch the Disney ships’ fireworks. I thought no way, but I guess it’s true! 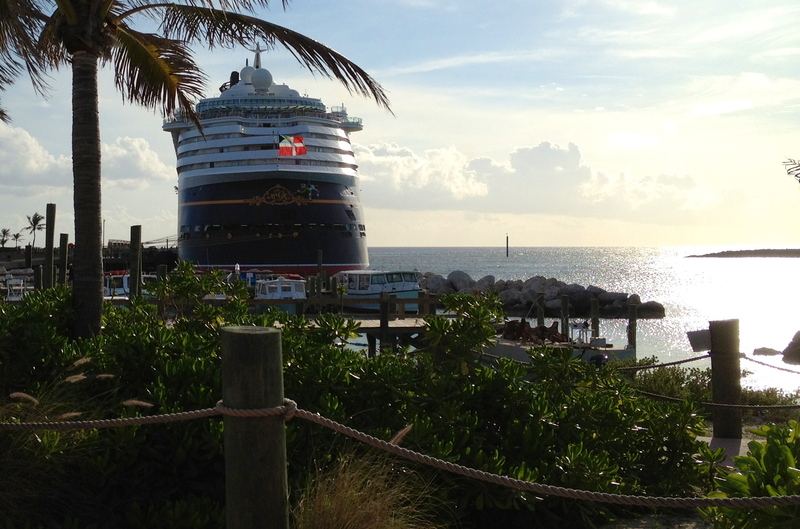 Disney is the only cruise line with a fireworks permit. Tonight dinner was at Parrot Cay. We saw Cinderella on the way. I love her dress. Dinner was wonderful again. Each night we had a 4 top table to ourselves. Thanks Lisa! CSP had 2 appetizers again tonight. 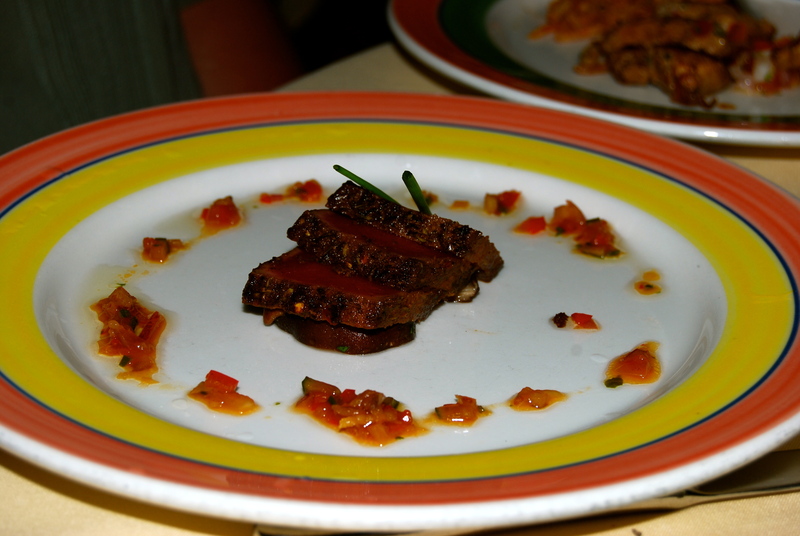 He had Jamaican jerk chicken and Ahi tuna. 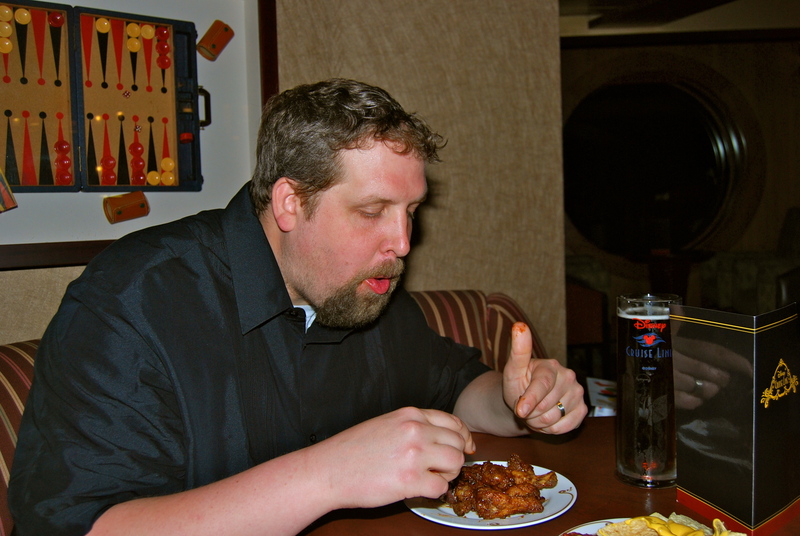 We counted at the end of the trip that he ate over 14 different types of seafood on this trip! 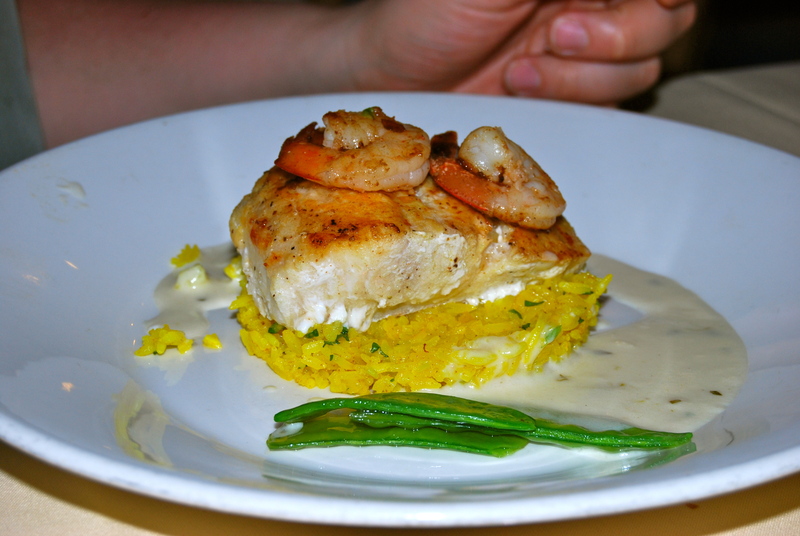 For his entree he chose the pan seared grouper. His dessert was the ice cream sundae. Look at the little Mickey! 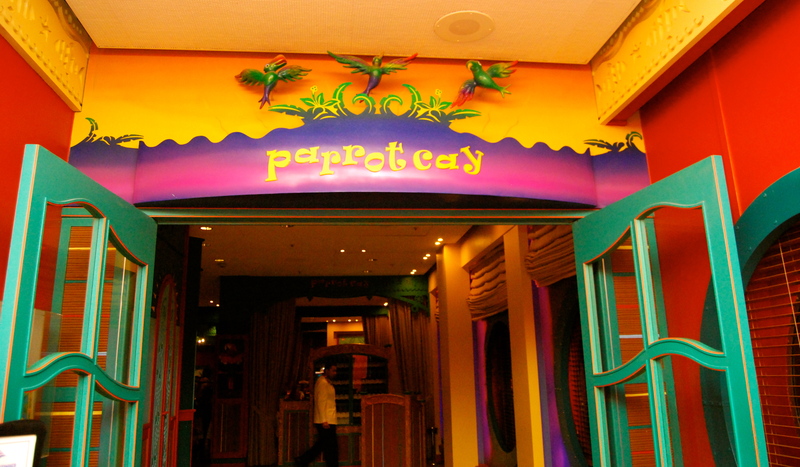 Parrot Cay is an island themed restaurant so the meals are more tropical. 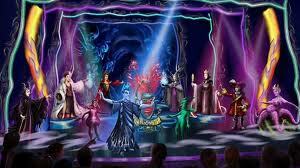 Lumiere’s is French and based on Beauty and the Beast. Side note- we were not the only couple there with no children. We met lots of couples who were on the cruise sans kids (whether they didn’t have them at all or just left them at home). Disney is NOT just for kids! 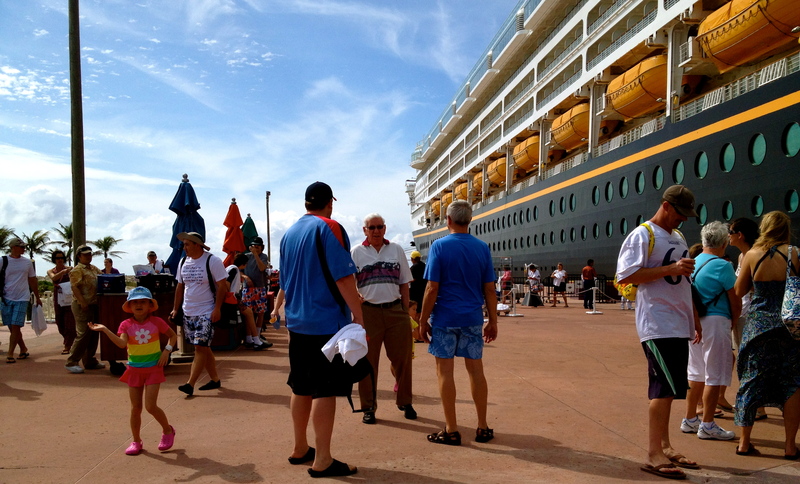 We met this one older couple- they were on their 19th Disney cruise! Can you believe it!?! Back to my dinner. 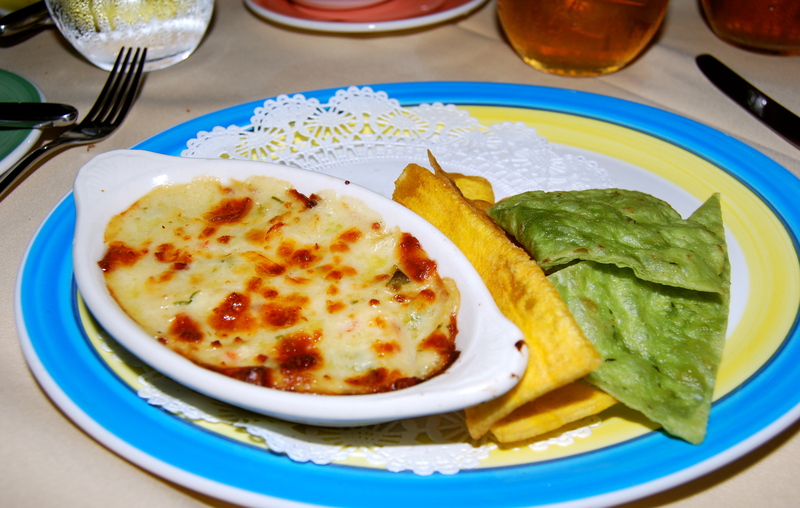 I had the crab dip with plantains and chips for my appetizer. Then I enjoyed a cold mango soup. 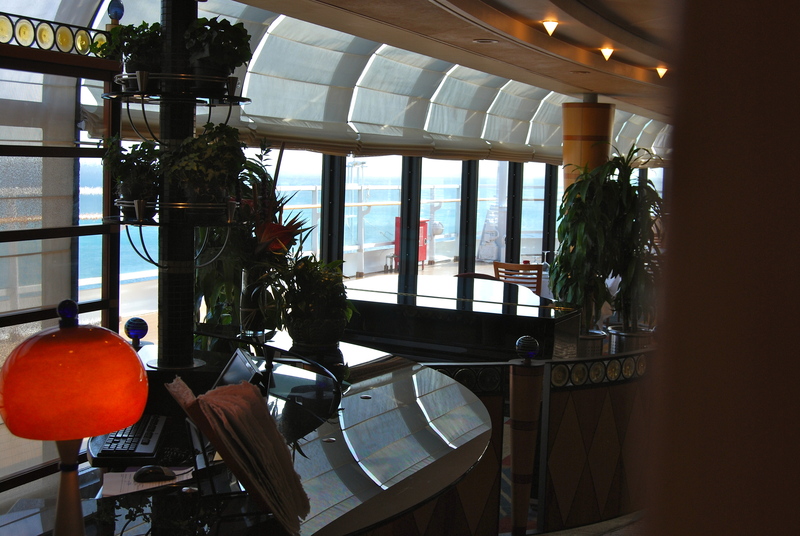 I love cold soups and only ever seem to see them on cruises. 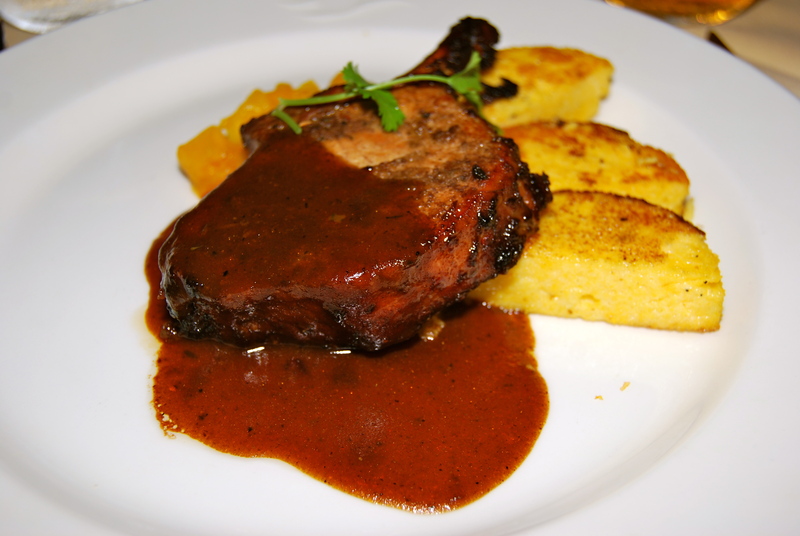 My entree was a Jamaican pork chop with mango and polenta. 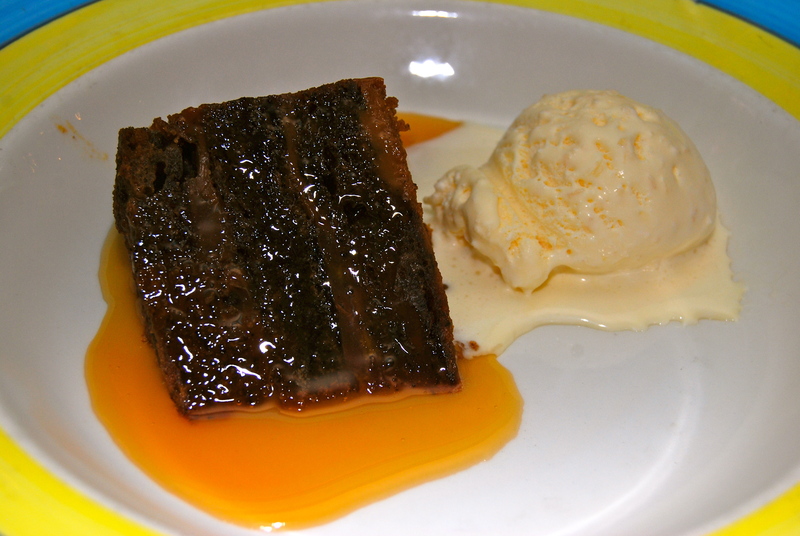 My dessert was an amazing French Toast banana bread pudding with coconut ice cream and caramel sauce. 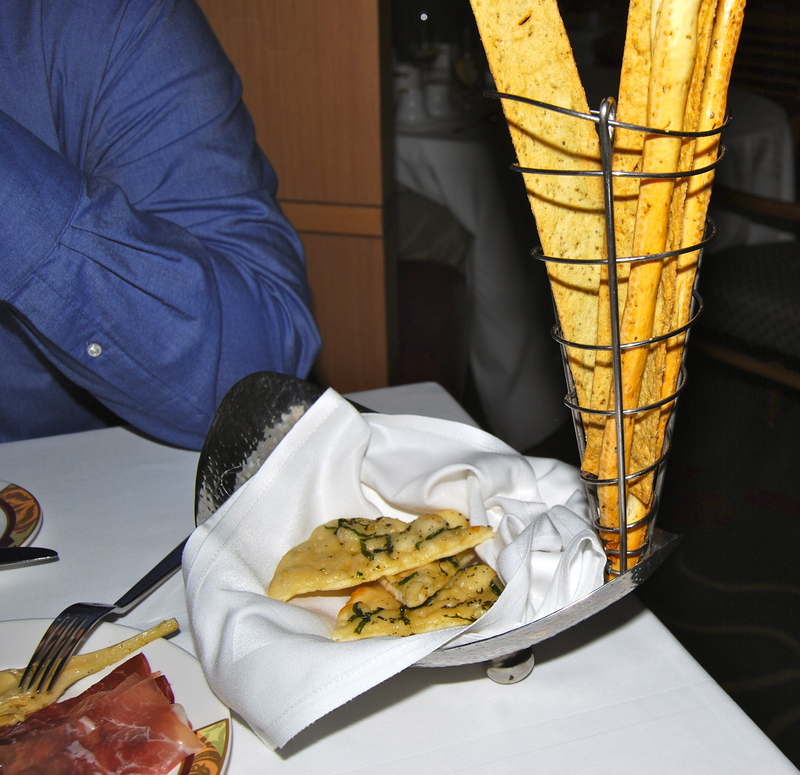 After dinner I asked our waiter Val if he knew any tricks. 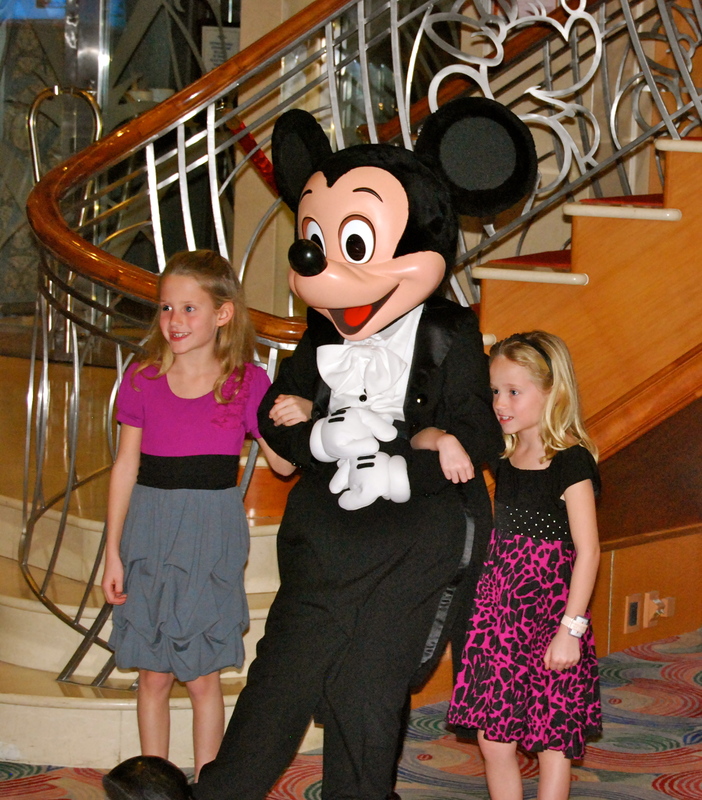 You always see cruise waiters doing tricks for the kids. Well I love tricks too! 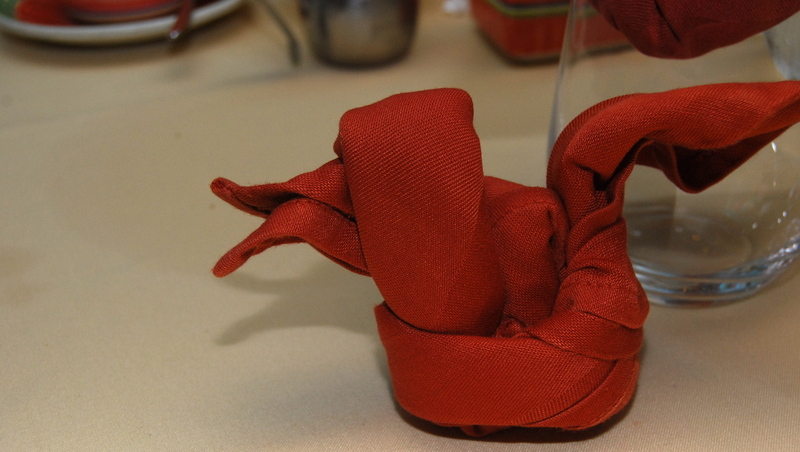 He made me a napkin duck and a beautiful rose! 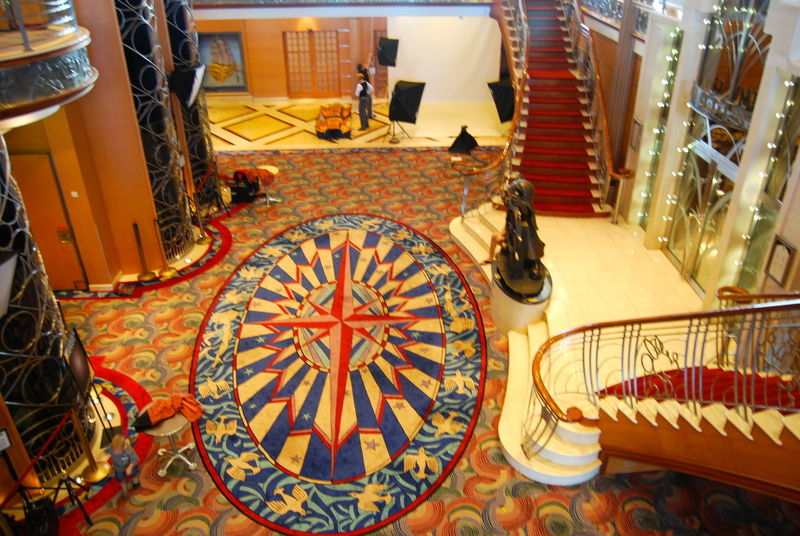 We took my rose back to our room and changed then went up to deck 9 to watch Remember the Titans on the big screen. Then we went back to our room and watched Captain America until we went to sleep. 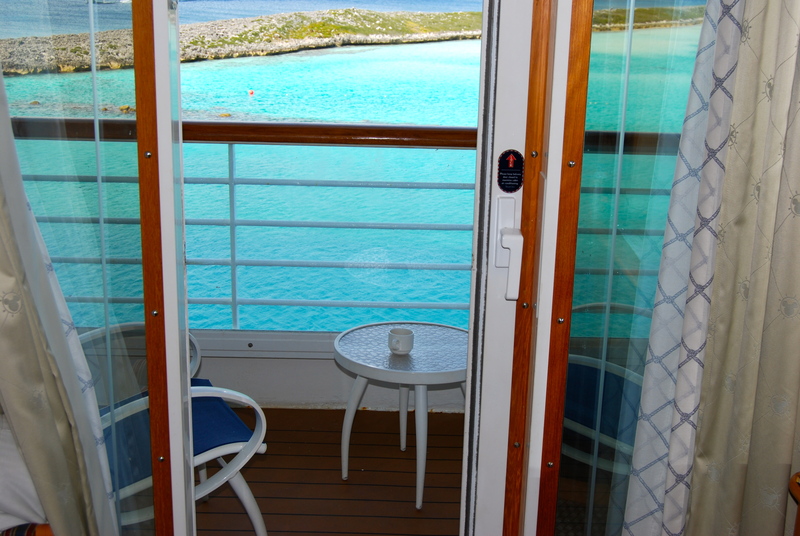 We woke up today at 7 am to have breakfast in our room and watch the ship pull into port. Can you guess who’s idea that was? 🙂 Once we were parked we took a nap as we were up super late the night before. We woke back up and put on our swim gear then headed over to Quiet Cove Pool. Ahhh, now this is the life. Everyone was off exploring the island and we had the pooland hot tub nearly all to ourselves! 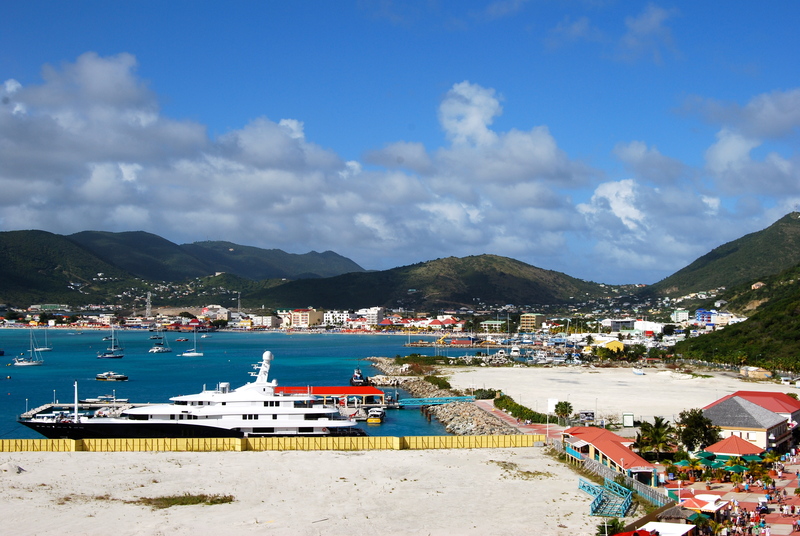 We’ve been to St. Maarten and decided to skip it this time to enjoy the ship without the crowds. We swam for like 3 hours & hot tubbed it for a while too. (check out how great my iPhone takes pics!) We got hungry in the sun (but didn’t get sunburned thanks to our new SPF swim shirts! ( mine came from here and CSP’s from here) so we went to Topsider’s for the buffet. 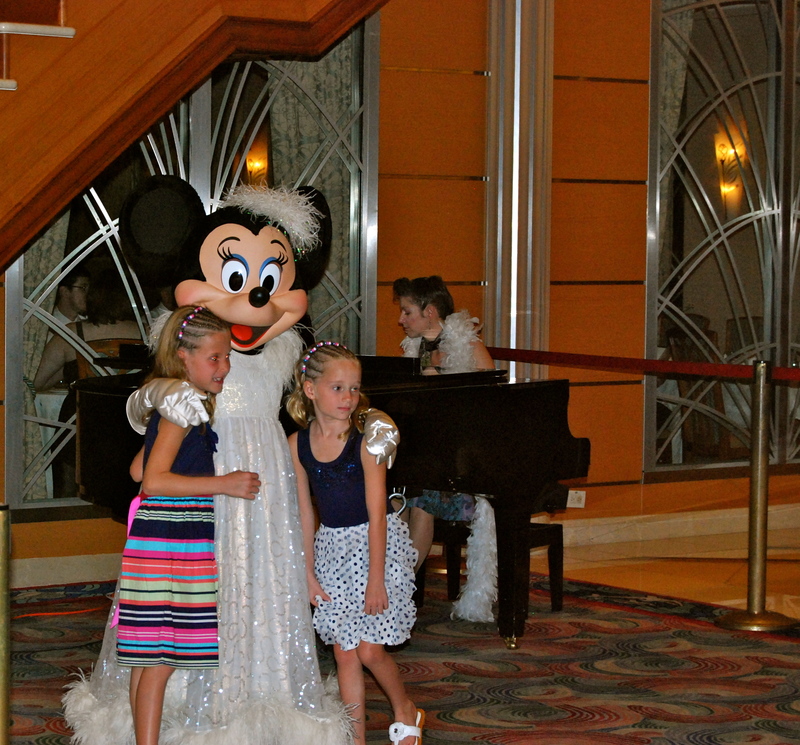 We were wet from the pool or we would have gone to Lumiere’s for sit down service. I wasn’t all that impressed with the buffet, but CSP found some things to eat. I got a salad and a crepe. After lunchwe walked around the ship so we could get some pics of the island andall the ships. It was likea parking lot and CSP could not get over it! Look! Five ships in a row! And that’s not counting the one behind us! 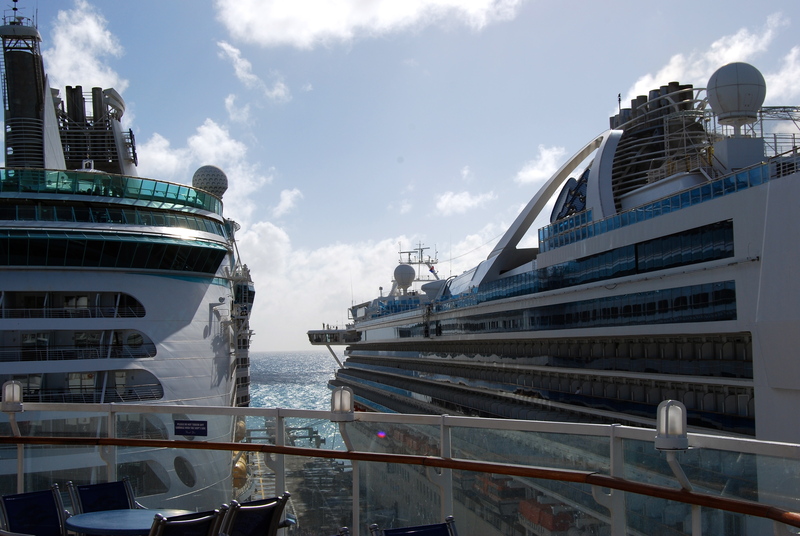 It IS pretty amazing that they can parallel park these HUGE ships theway they do! 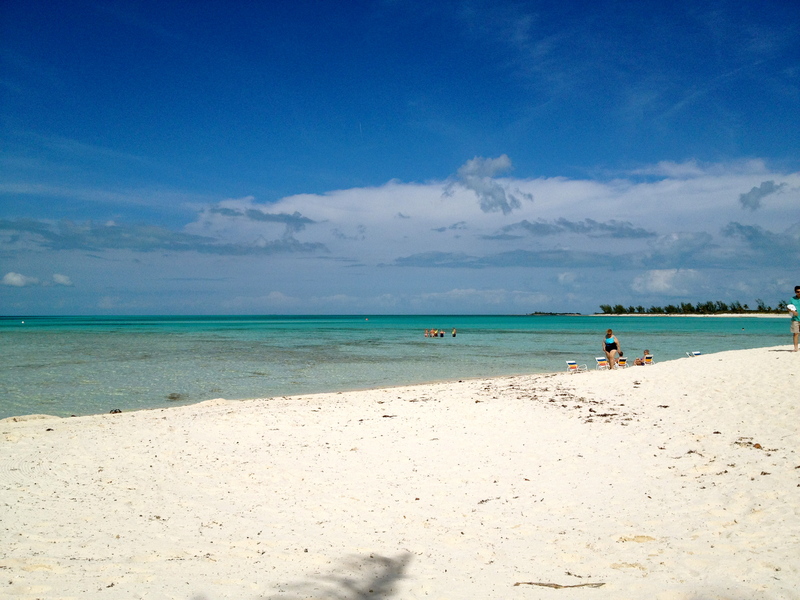 Since everyone was off on the island it gave us a chance to photograph the pools without the throngs of people! 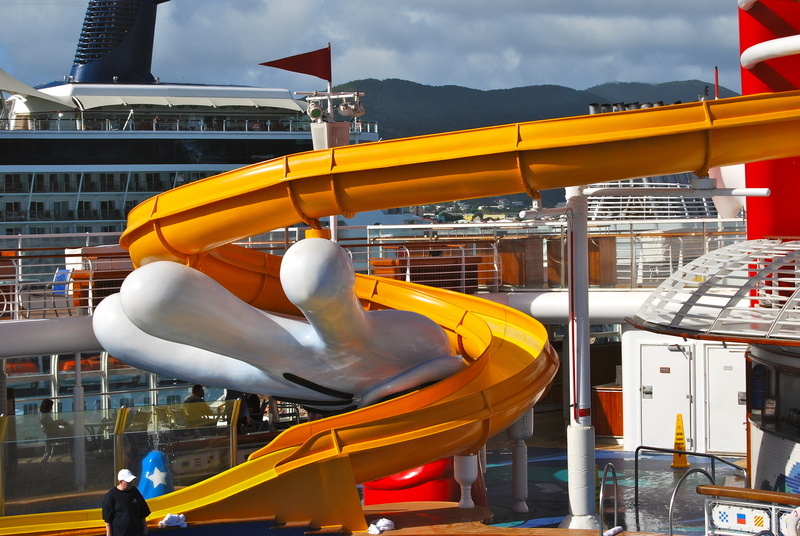 Here’s Mickey’s pool and slide. And this is theFunnel Vision big screen tv over Goofy‘s Pool. They show movies on this screen day and night. We went back to the room for nap time. When I woke up I put my Fish Extender Gifts together. 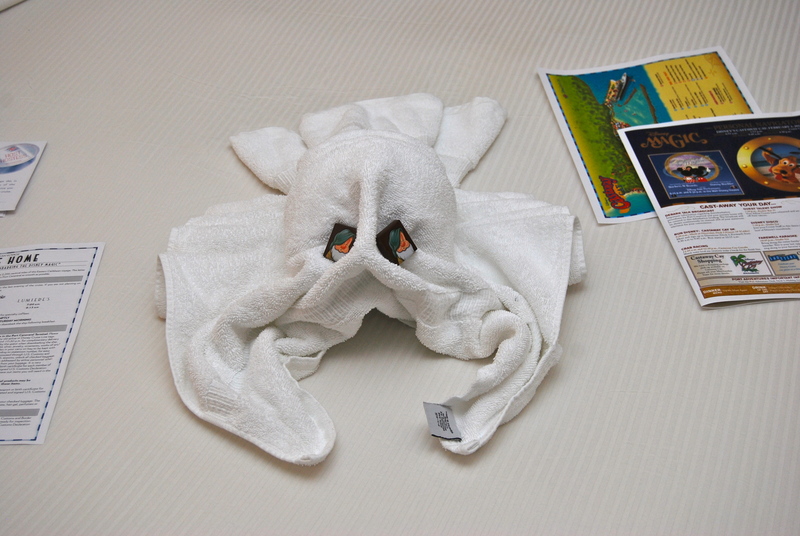 Outside of every stateroom door is a fish. It’s a little place where crew members can leave you notes/ materials. The fish extender is a long thing with lots of pockets that usually has your family name on it. 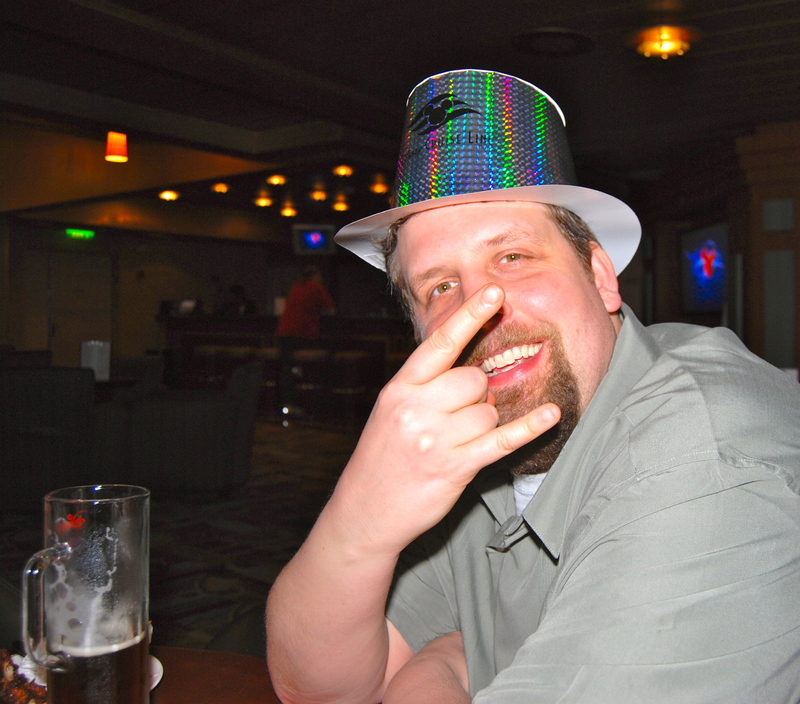 We got ours when we went on Lisa & Pete’s wedding cruise back in 2008. Besides the exchange (which I’ll explain shortly) they are great as a landmark so you can pick out your room in the long hallways. You can either make your FE (fish extender) or buy one from someone crafty on Etsy or eBay. 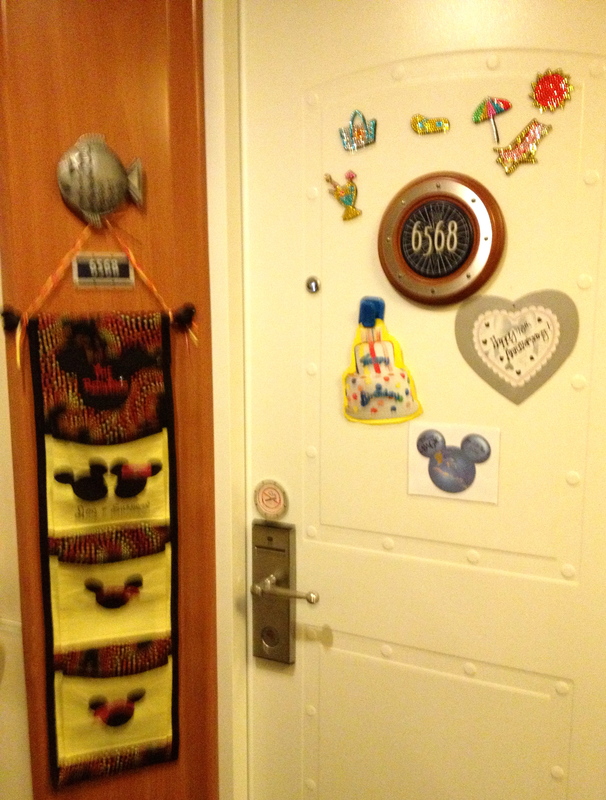 By the way, the room doors are metal so you can decorate with magnets (just no tape). Here’s a great explanation of the FE ritual. 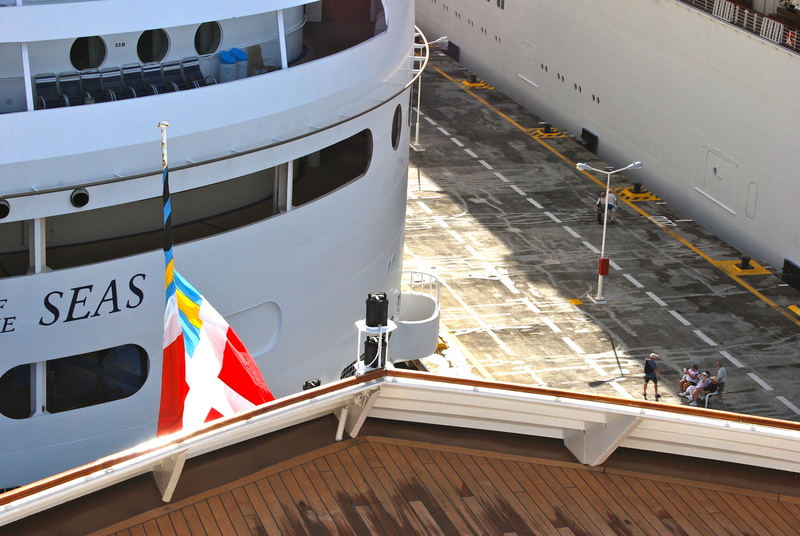 You sign up to be part of the FE exchange via your cruise thread on the DIS boards. 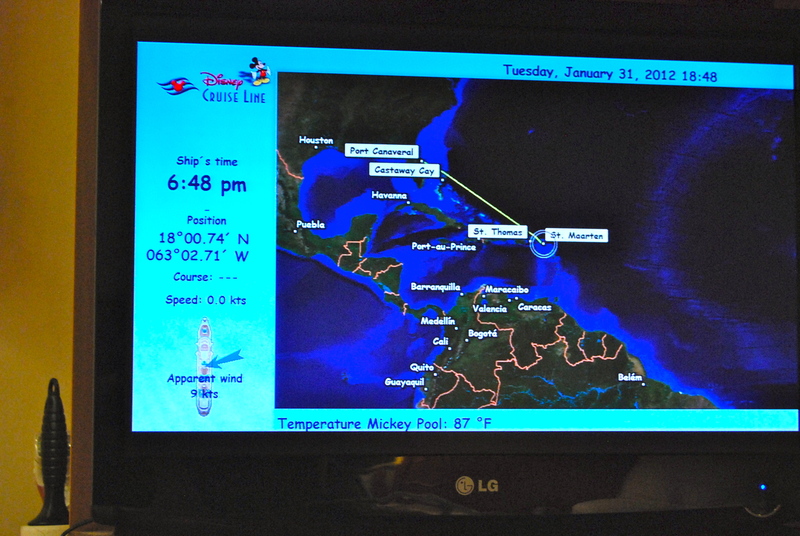 It’s a big message board for Disney travelers. There is a thread for each cruise date and someone from that group organizes it. 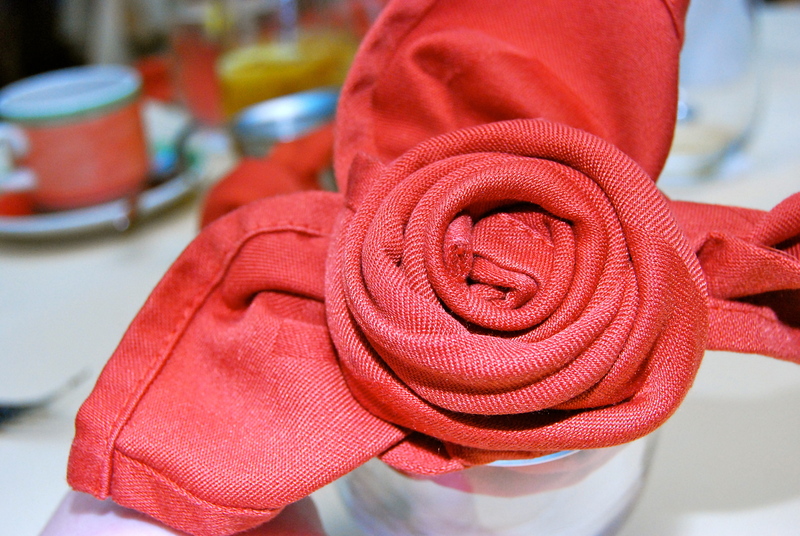 Everyone comes up with inexpensive little travel friendly gifts to exchange. I like it when the gifts say something about where the giver is from. Like last time we got maple sugar candy from people who live in Canada. This go round we had 15 total cabins participating. CSP and I went to Shealy’s to get barbeque sauce since the Carolinas are famous for BBQ. I also included a Thirty-One key fob and a mini catalog since I’m an Independent Consultant with Thirty-One. 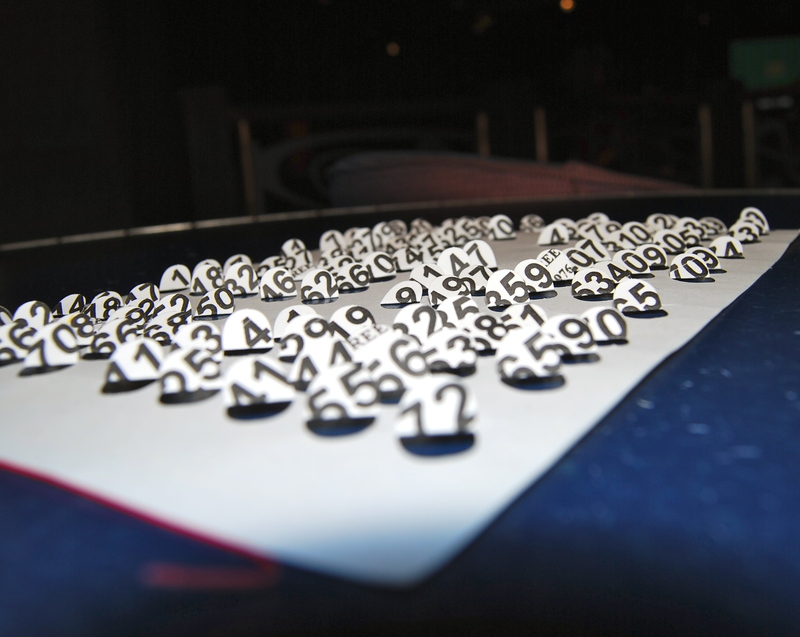 Did you know our new catalog is out and this month’s special is amazing! For every $31 you spend you can take 31% off ANY catalog item! 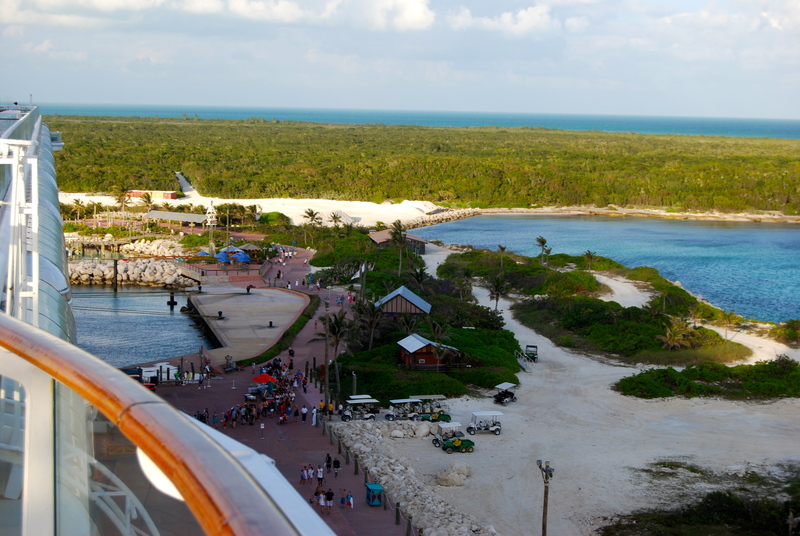 Ahem, back to cruise reporting! 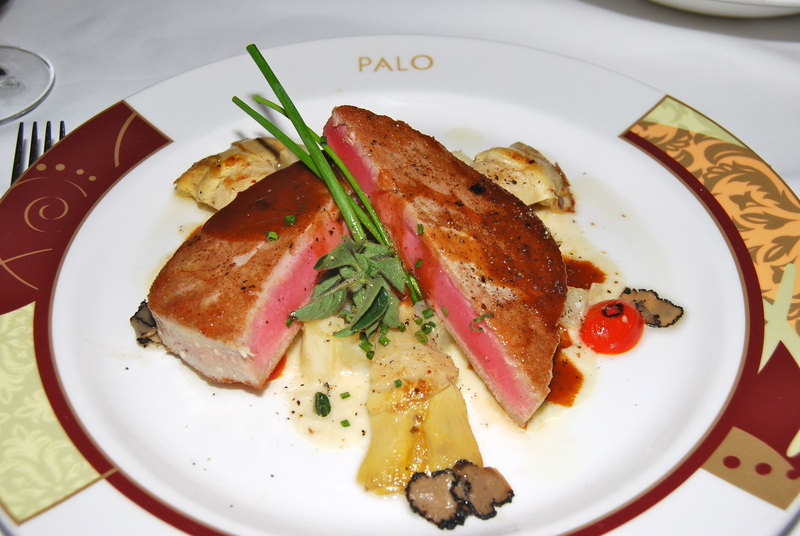 Tonight was our dinner at Palo! We were so excited! 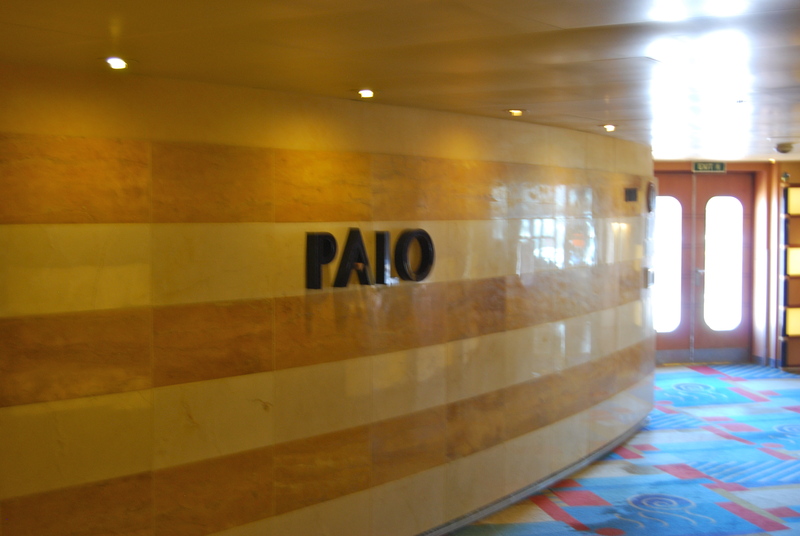 Palo has their own elevator lobby. Everything Palo is so gorgeous. Maria was our server again. She brought out our bread first in a cool basket that CSP wanted to try and fit in my purse. She also brought out anti pasta. Then came our appetizers. 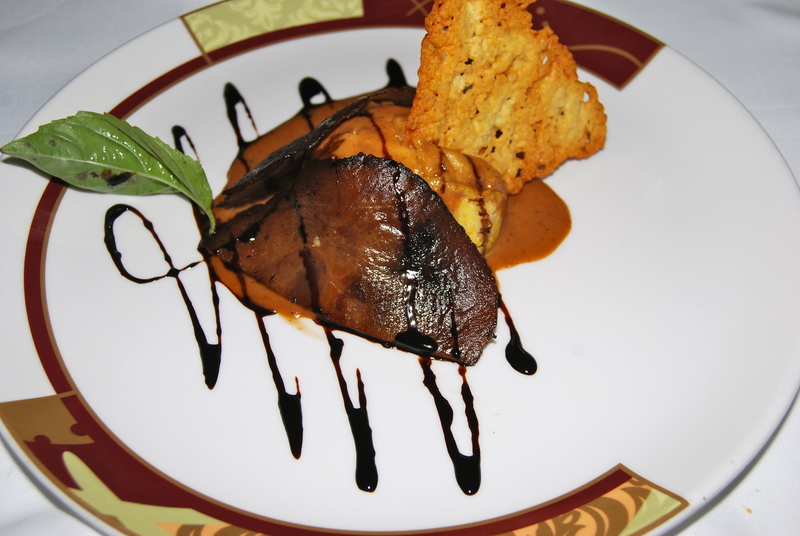 I chose polenta with portobello mushrooms. SO good. 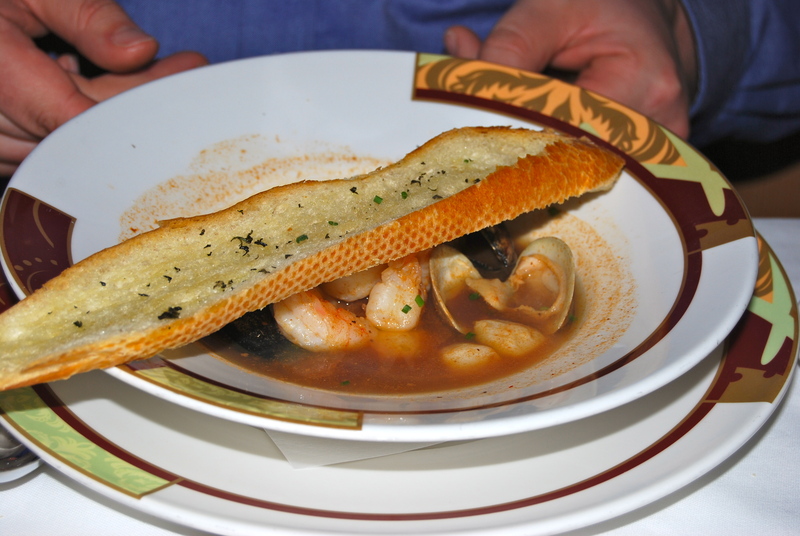 CSP got cioppino- a mixture of mussels, clams, scallops, and shrimp in broth. It looked amazing and he about licked the bowl. 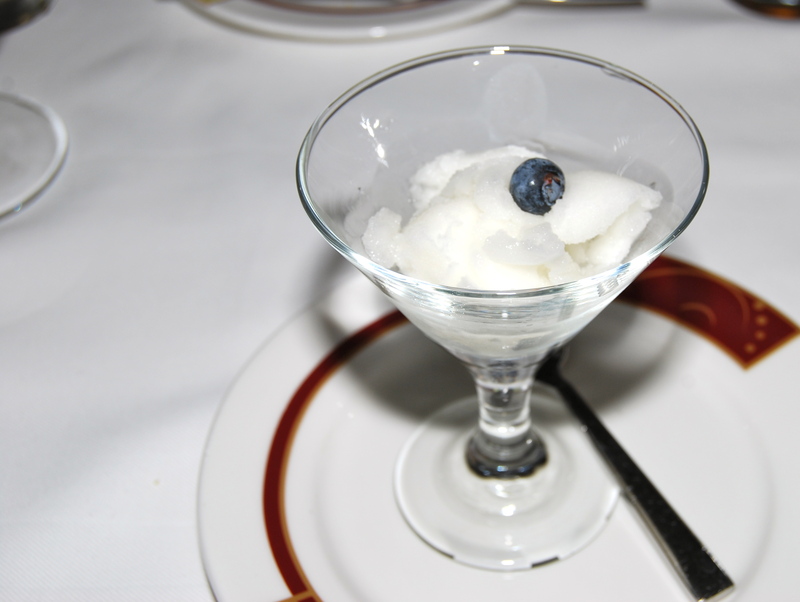 Maria brought us a lemon sorbet to cleanse our palates before the main course. 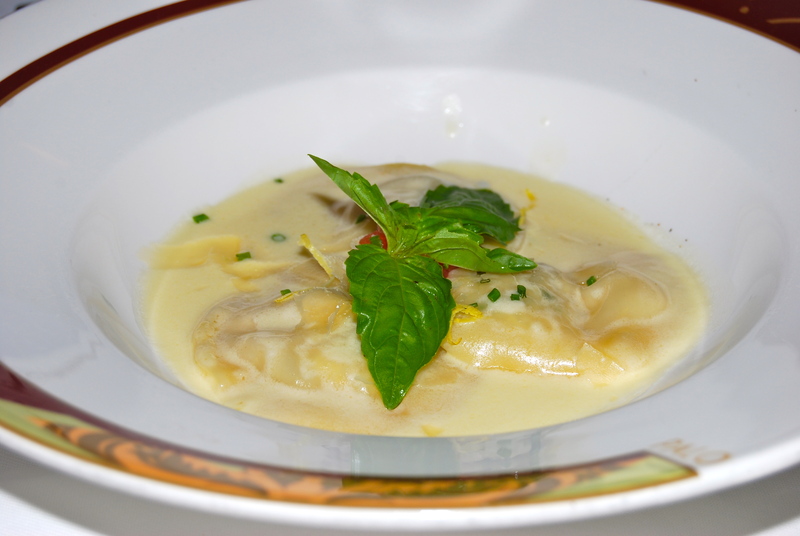 For our entrees we shared a lobster ravioli on Lisa’s recommendation. OMG. You could totally tell the pasta was handmade. It melted in your mouth. And you could taste the lobster. Ahhhmazing. 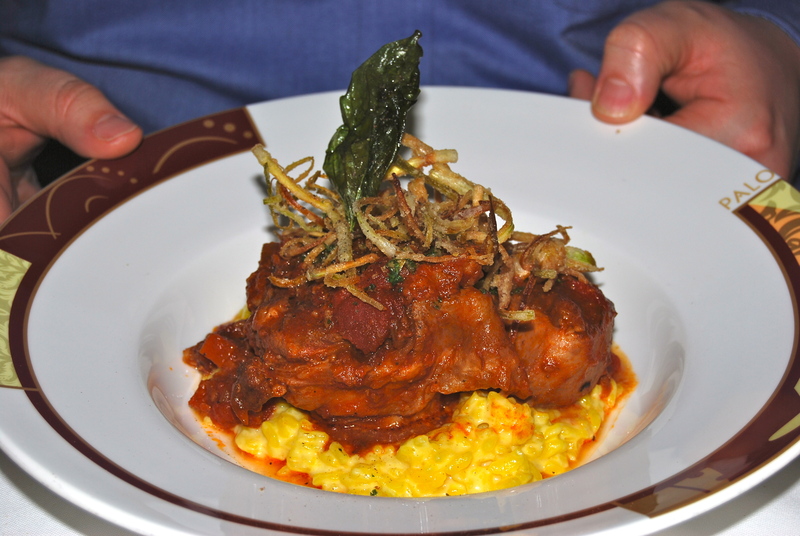 CSP got the osso buco with the creamiest risotto ever made by human hands. Osso buco is a veal shank. They included the bone and CSP scraped out the marrow like some woodlands animal. He was all proud of the empty bone at the end but I refused to photograph that carnage! He really loved it all though and said the meat was like butter. I was more civilized and ordered a tuna steak with potatoes, artichokes, and truffles. I’d never had truffles before! I felt like I was on the Food Network. Dessert came next. CSP got coffee and a tiramisu. That boy loves tiramisu. He said this one was fantastic. I had a pot of the most amazing jasmine tea and a dessert called amaretto indulgence. Honestly, I barely tasted any amaretto (one of my most favorite flavors), but it was still wonderful. The little orange circles were some sort of orange liqueur so when I dipped the chocolate in the orange circle it tasted like the chocolate oranges you get at Christmas. So yum. 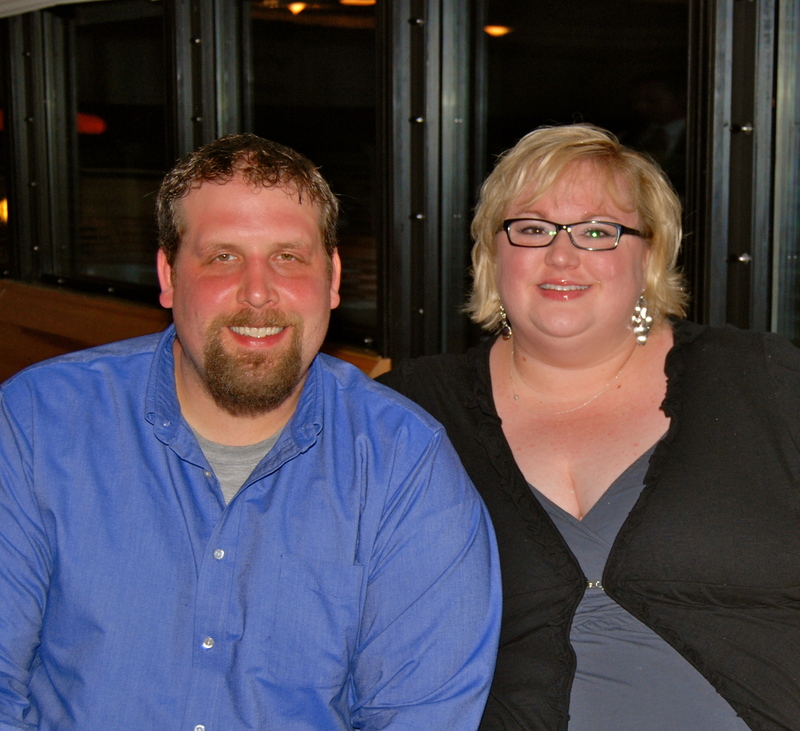 Maria was kind enough to take our picture for us. Don’t we look cute? And full? ha! We missed the Pirates IN the Caribbean dinner and party because of our Palo dinner. We left Palo just in time to watch the fireworks through a window. So no firework pictures. Oh well. It was worth it. 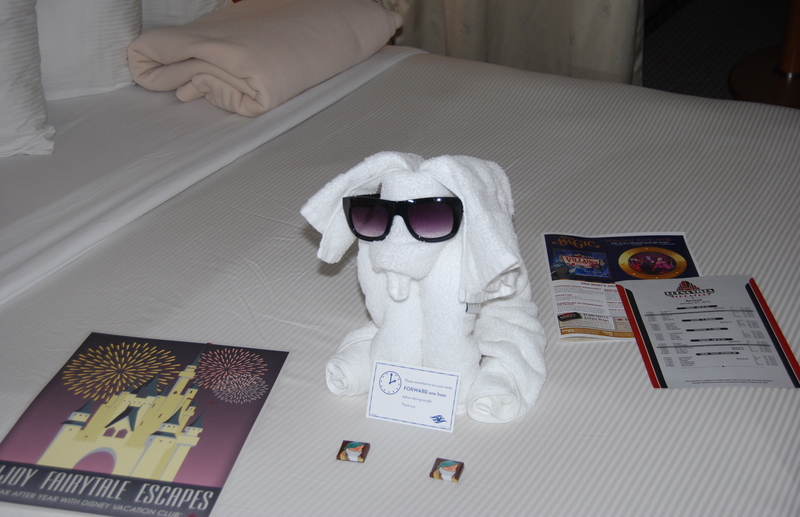 We got back to our room and met our towel monkey. 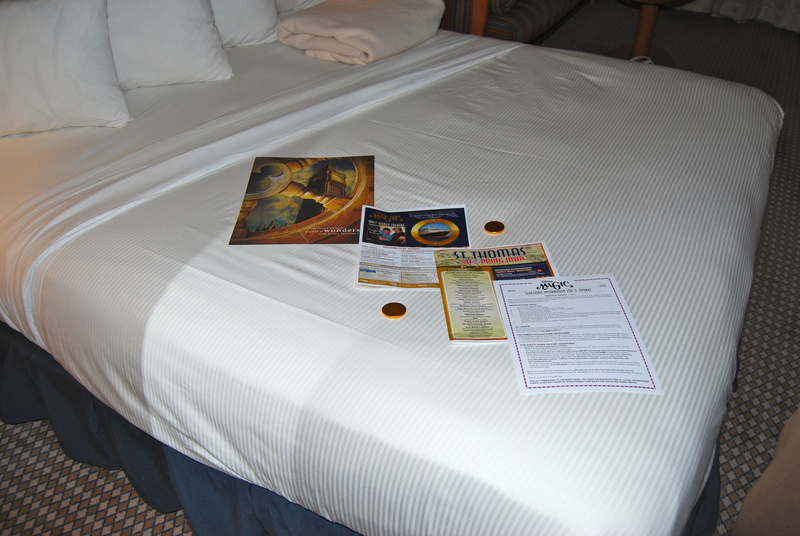 You know, the turn down service is one of the things I miss most. It’s so nice to slide into a tightly made bed every night. I’d be remiss if I didn’t mention CSP’s favorite tv channel on the ship. He loved being able to see how fast we were going, how strong the winds were, and see our position in the ocean. I admit, it was really cool. We didn’t stay up too late tonight and were asleep by midnight. 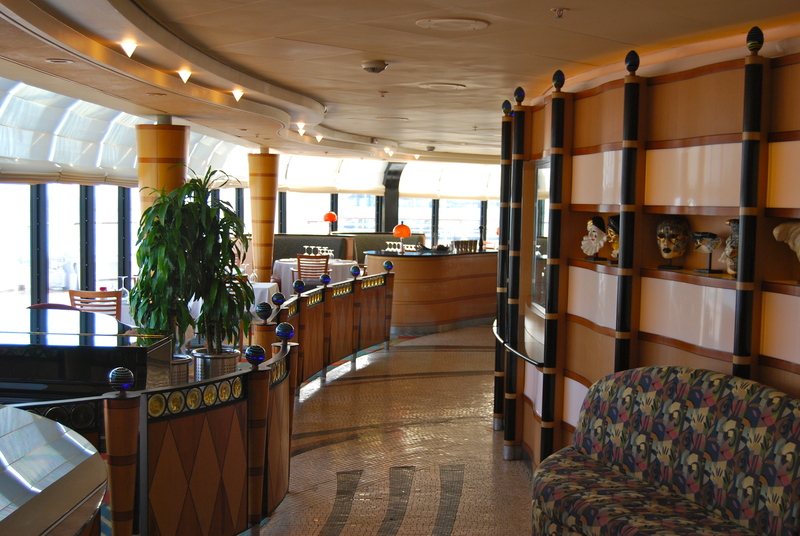 We started today, our second sea day, by having brunch in Lumiere’s. 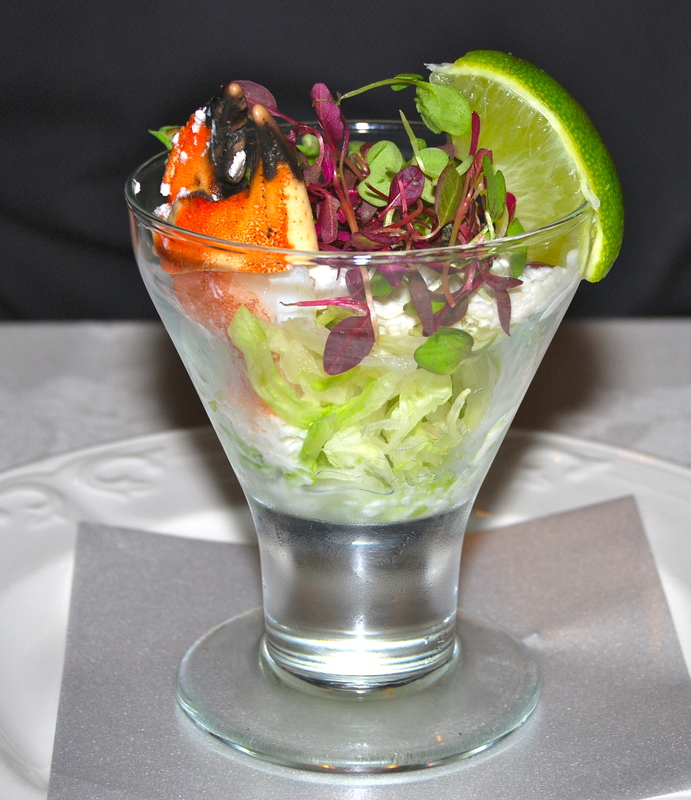 CSP started out with crab cocktail. I don’t know how he can eat fish first thing in the morning! He also had lox and bagels. 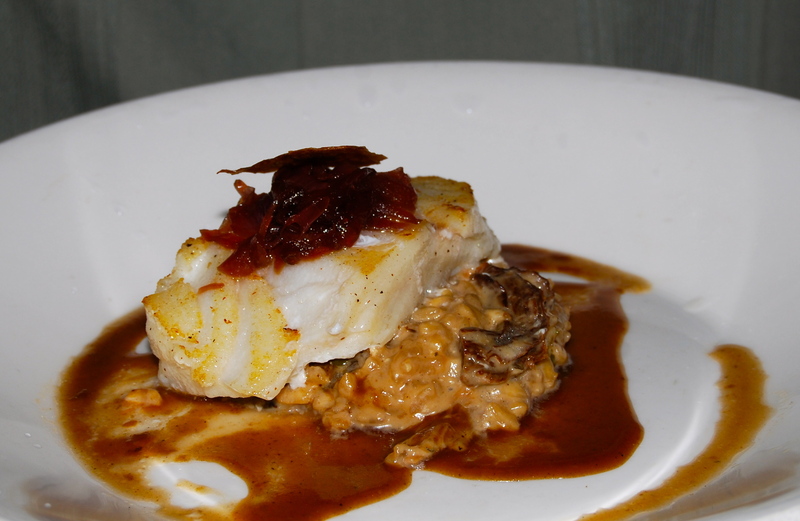 Then for his entree chose sole with crawfish, scallops, and brown butter sauce. I had eggs benedict with fruit. 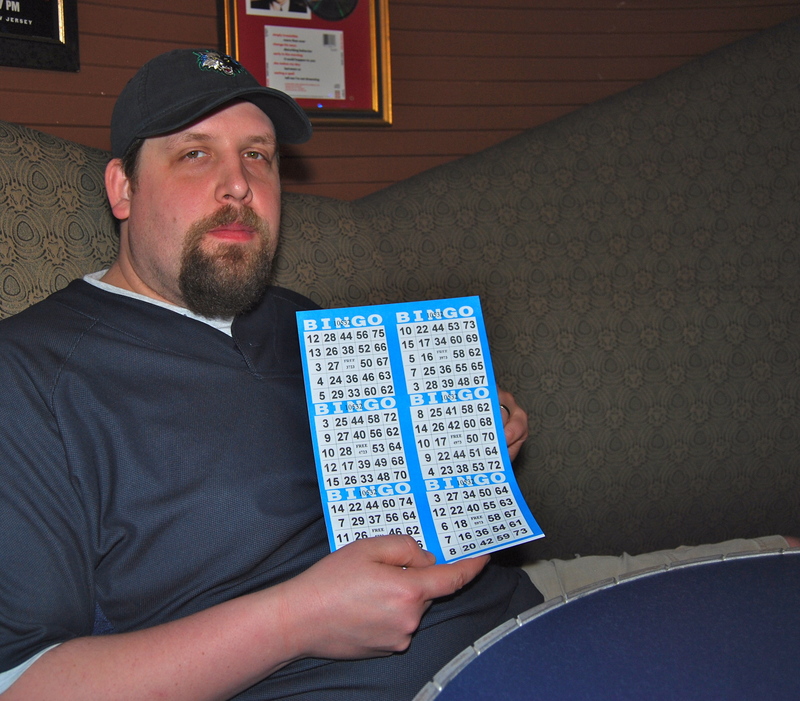 After brunch we went to Rockin Bar D to play bingo. It was fun but we didn’t win. 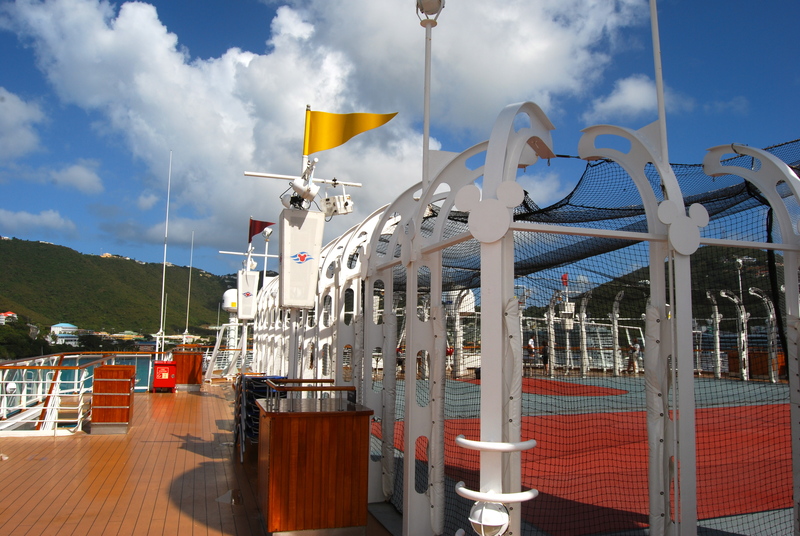 We went out for a walk around the ship then back to our cabin for a nap. 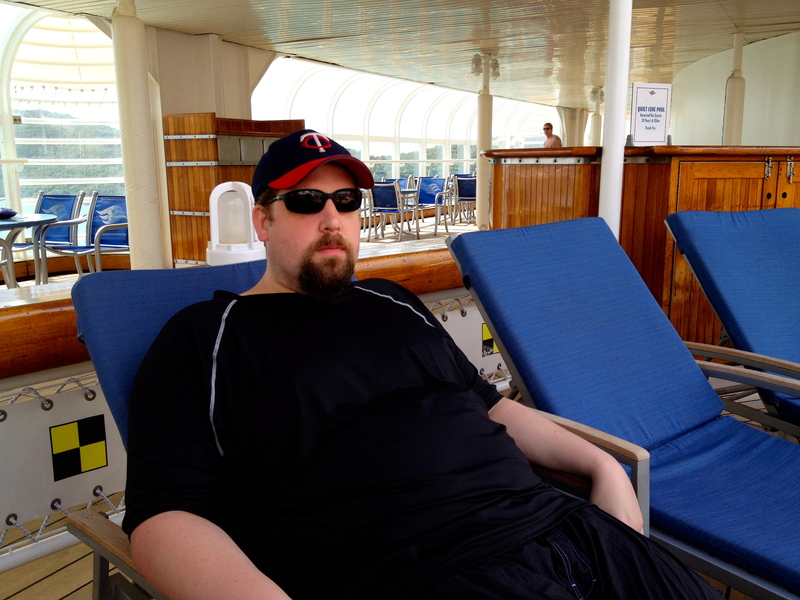 About the naps…We have a schedule on cruises. We stay up late, get up early for breakfast, run around during the day, then take a nap during the hottest part of the day so we can do it all again! 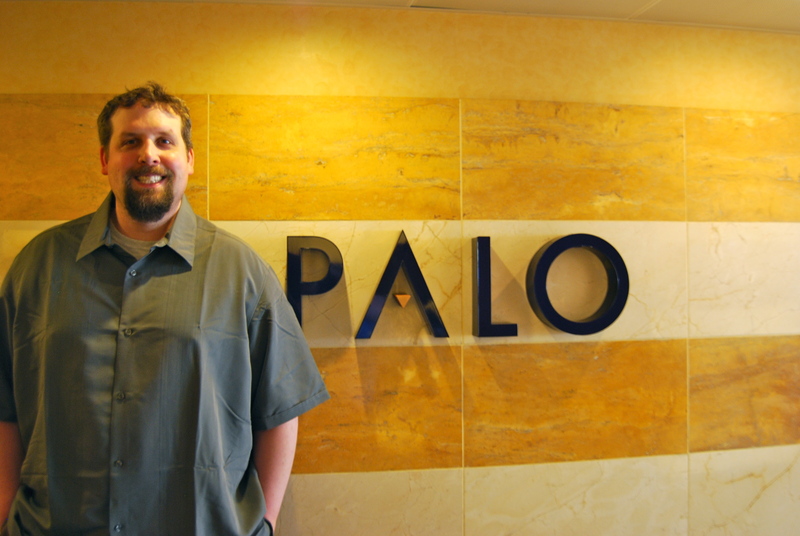 Today we had reservations for Palo for High Tea! I was so excited! I LOVE hot tea and all the traditions surrounding high tea. CSP isn’t a tea boy so he got coffee. But that’s ok. He still enjoyed the rest of it. Again we had a great view of the sea. I went with our server Maria’s recommendation and chose the Chai Tea. I love Chai and this was excellent. First came the finger sandwiches. There were 4 kinds. The dark sandwich is pumpernickel bread with salmon and a dill spread. 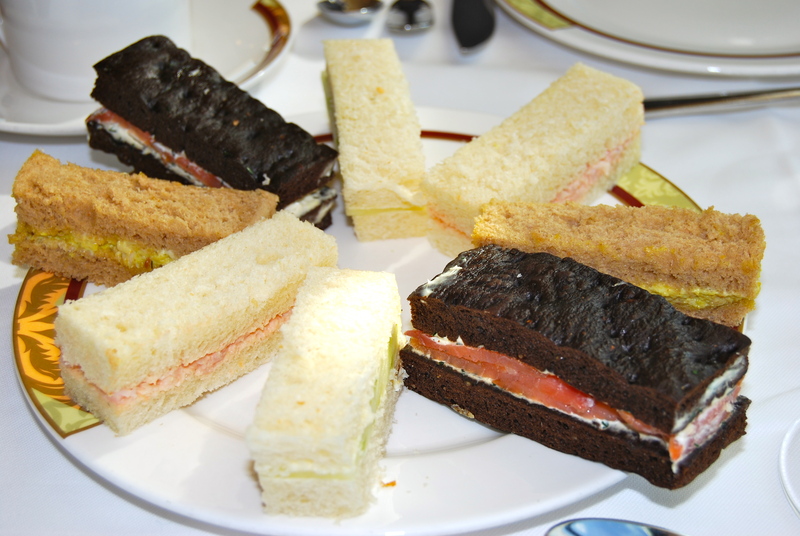 Then to the left of that one is a cucumber sandwich. That one didn’t taste like anything. Seriously, didn’t taste like anything at all. Then we had a baby shrimp sandwich. And finally on wheat bread is a chicken curry. Yummy. Oh, and the salmon on pump? Fabulous! The next part of high tea was the best part. The scones. 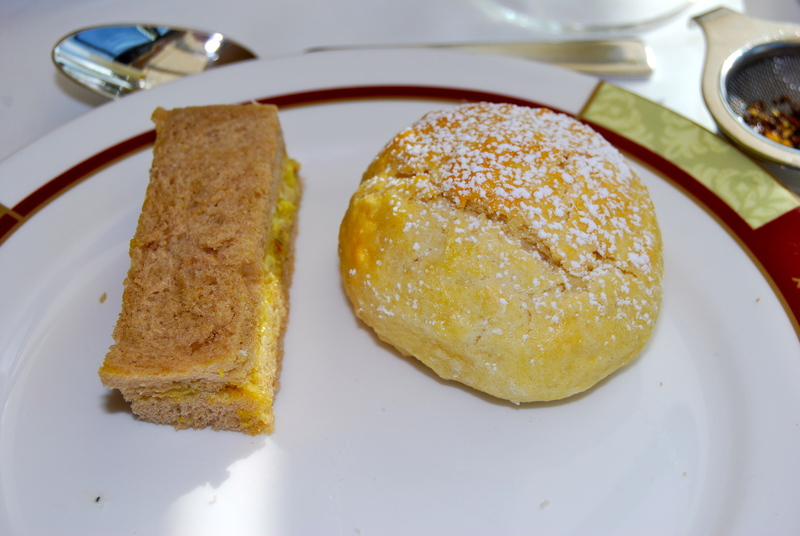 Sure, it looks unassuming, but OMG it was the best scone I’ve ever had. They served it with Devonshire cream and strawberry preserves. The cream was to die for. If the entire tea was just a basket of scones with cream and jam I would have been very, very, happy. Next up was dessert. 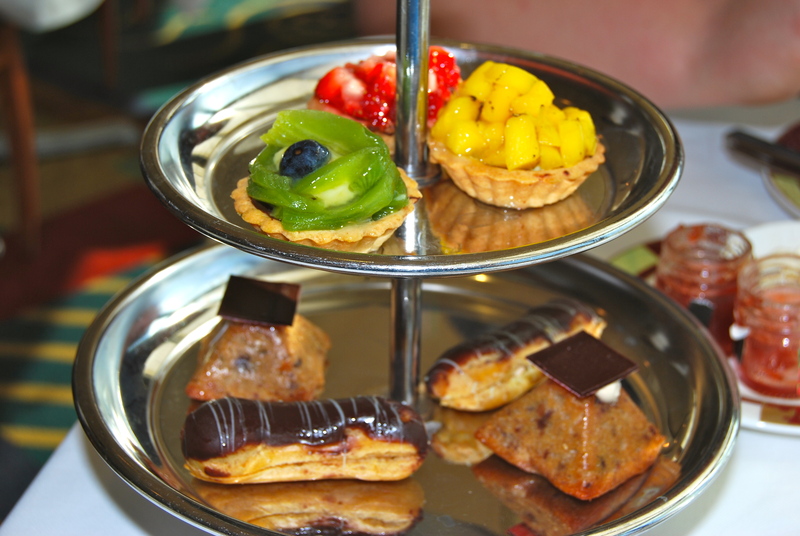 Fruit tarts, ginger cakes, and little coffee eclairs. Then there was more! Apparently the tarts and cakes weren’t dessert! So they gave us a strawberry custard trifle. Look on top and next to that chocolate square is a blueberry that is cut in half. Can you imagine how hard it must be to cut a tiny little blueberry in half on a rolling ship? We were very impressed. As we were leaving Maria gave us a plate with tin foil on it. We peeked inside and it was a plate full of fruit tarts! So sweet! 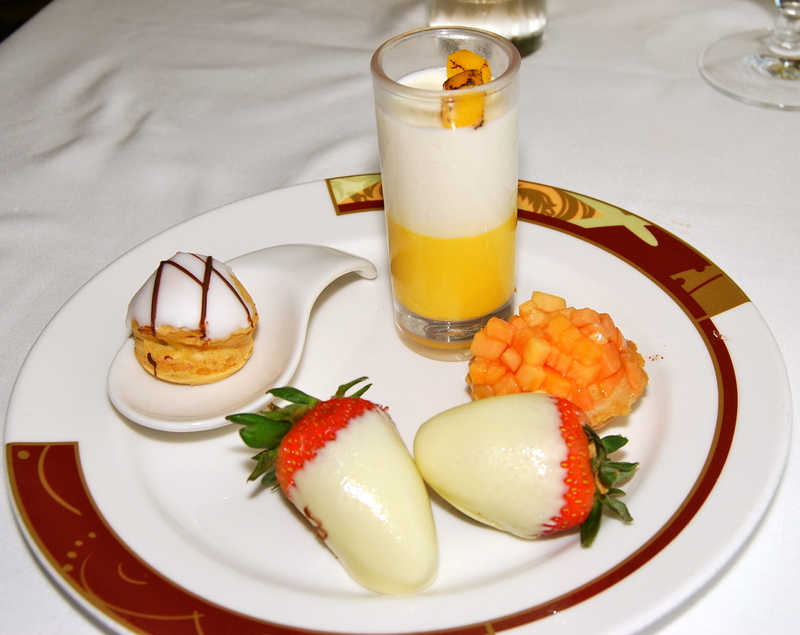 CSP ran back to the room with the tart plate and we went to the future cruise booking desk. While we waited we were able to get some good shots of the empty lobby. 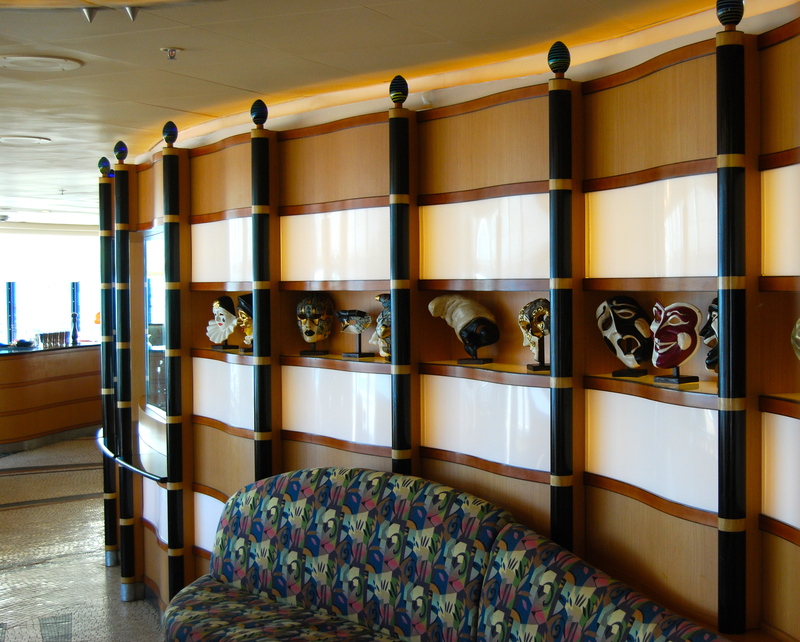 I love how Disney decorated the ships in such a timeless Art Deco theme. Never feels dated, just feels classic. 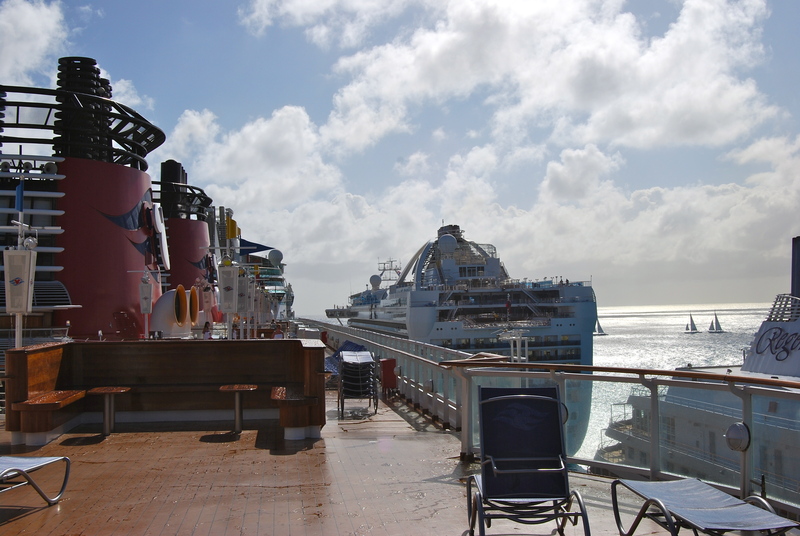 When it was our turn we booked our next cruise. 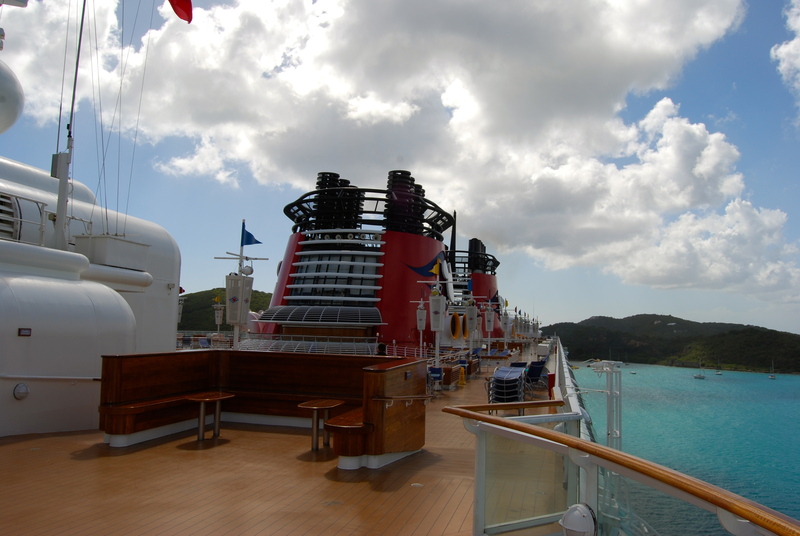 Next year we’re cruising on the Disney Dream! So excited! Then we went to the shops onboard and bought our souvenirs- a magnet and a Christmas ornament. Afterwards we went back to our room to get ready for the show and dinner. The show tonight was called “Villains Tonight!“. It was really funny. The shows onboard are amazing. 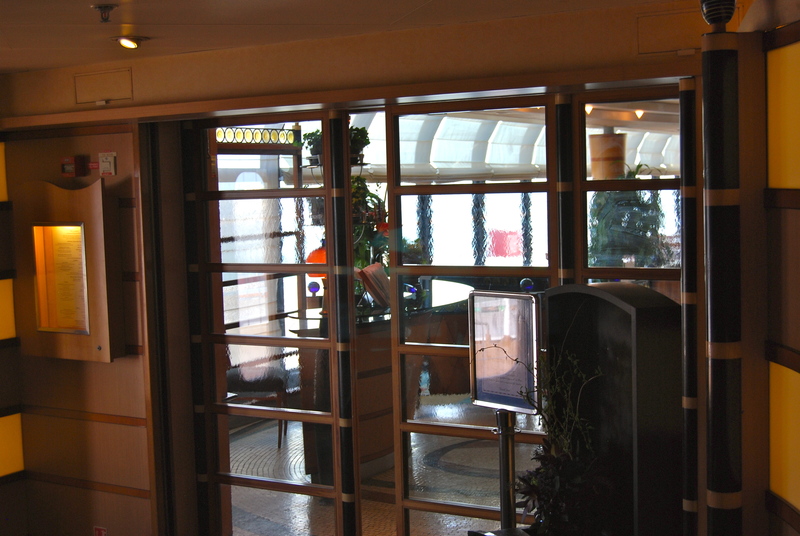 They do so much with pyrotechnics and elevators, you forget you’re on a ship! After the show we went to Diversions for cocktails to wait for dinner. 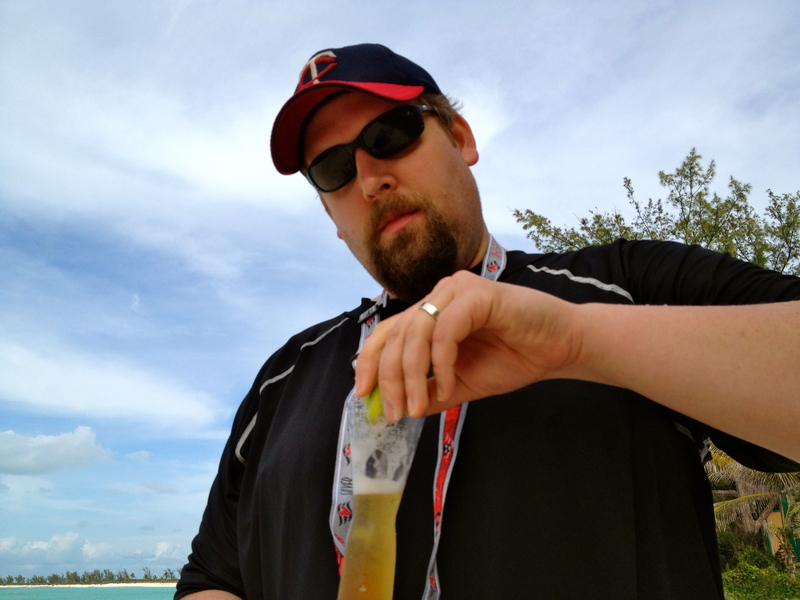 CSP got the refillable beer mug at the start of the cruise so he got a beer. I snuck some whipped cream vodka in my water bottle and added it to a ginger ale. Diversions has a bunch of board games for people to play. Pro tip: playing Jenga on a ship that’s rocking and rolling is an exercise in futility. 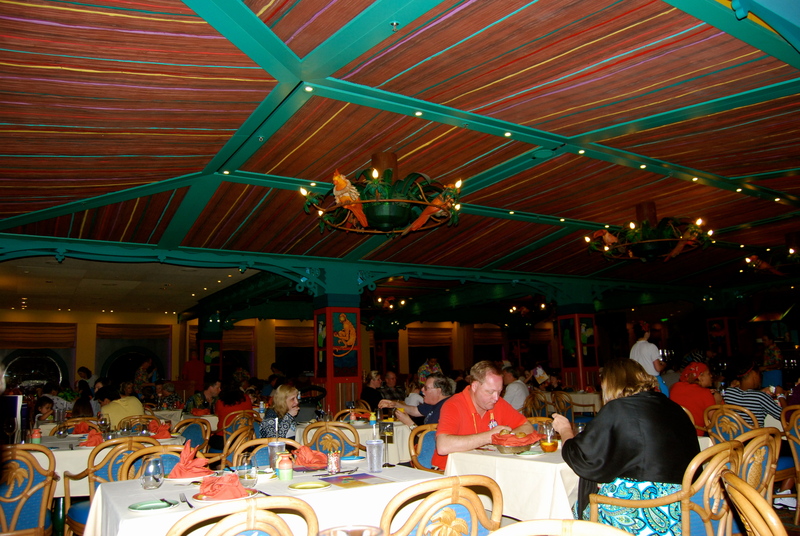 Dinner tonight was at Lumiere’s. 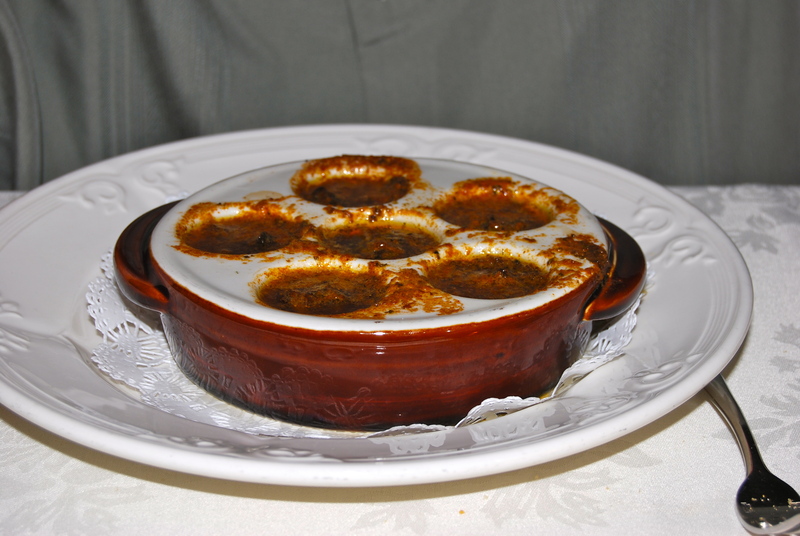 CSP tried escargot for the first time and… …loved it! 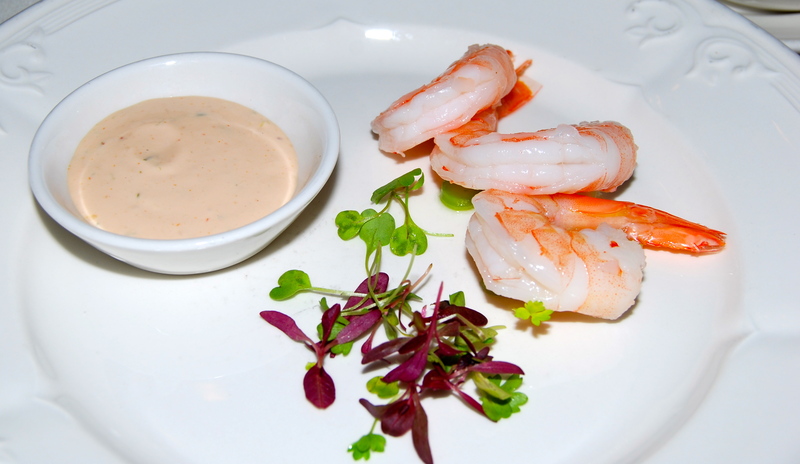 My appetizer was Lisa’s favorite… cold naked shrimp! 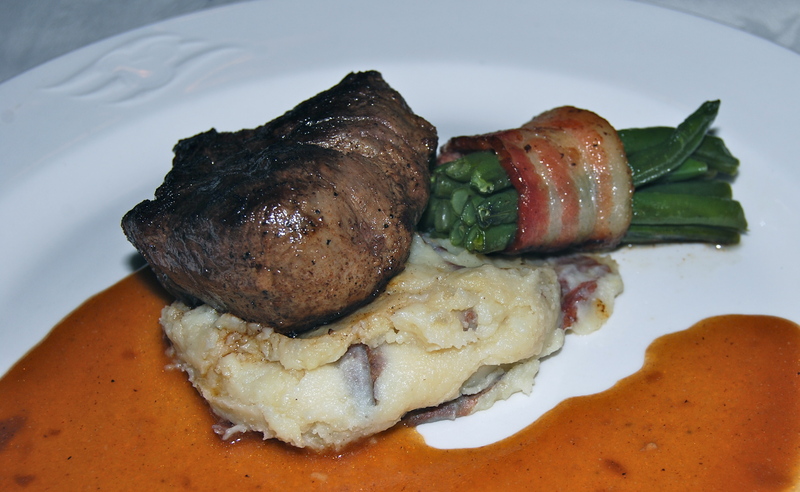 CSP’s entree was sea bass while I had the beef tenderloin. 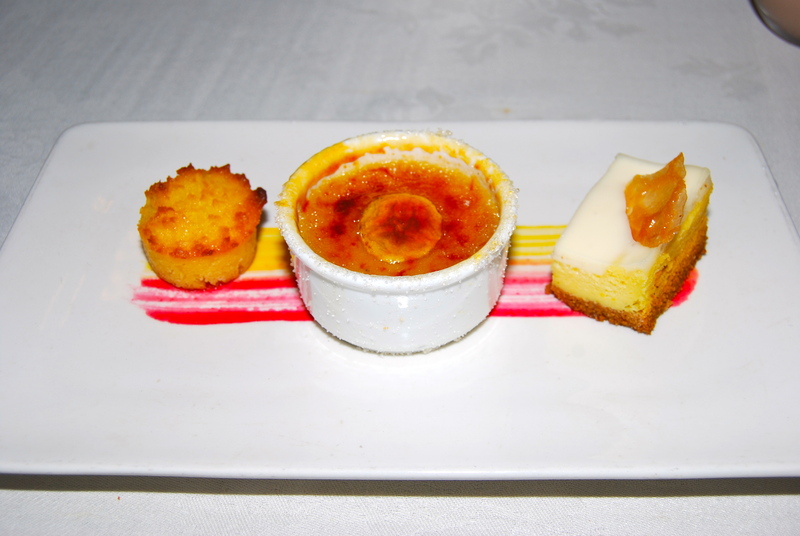 For dessert I chose the creme brulee and CSP enjoyed the trio- chocolate mousse, creme brulee, & a praline. Dinner itself was wonderful but the atmosphere was horrible. We had the late seating for dinner- 8:15pm. Dinner often ran until past 10pm. The problem tonight was screaming babies. I felt sorry for the family who kept taking the child out of the dining room when he would cry. But the other table near us? The table where the parents clearly had given up and didn’t even acknowledge their screaming child? We did NOT feel sorry for them. 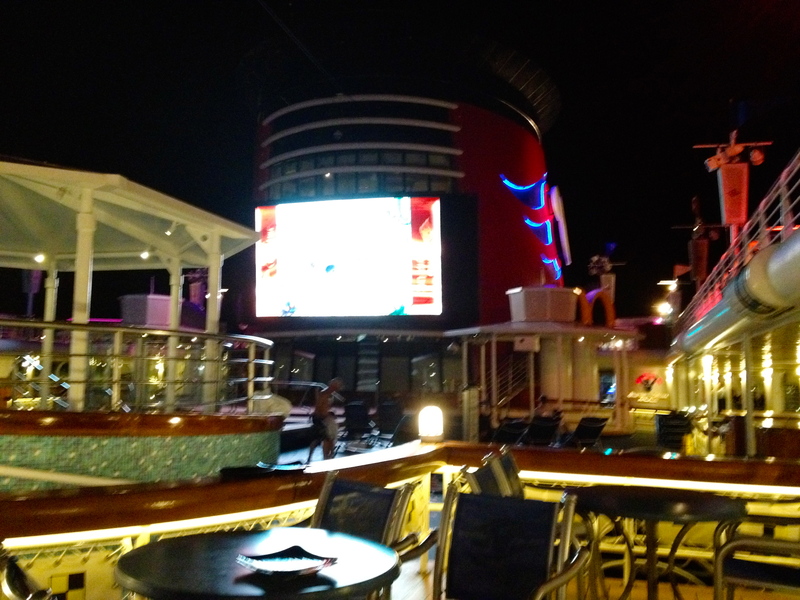 After dinner we went up on deck and watched some of the movie Hercules on the big screen- Funnel Vision. 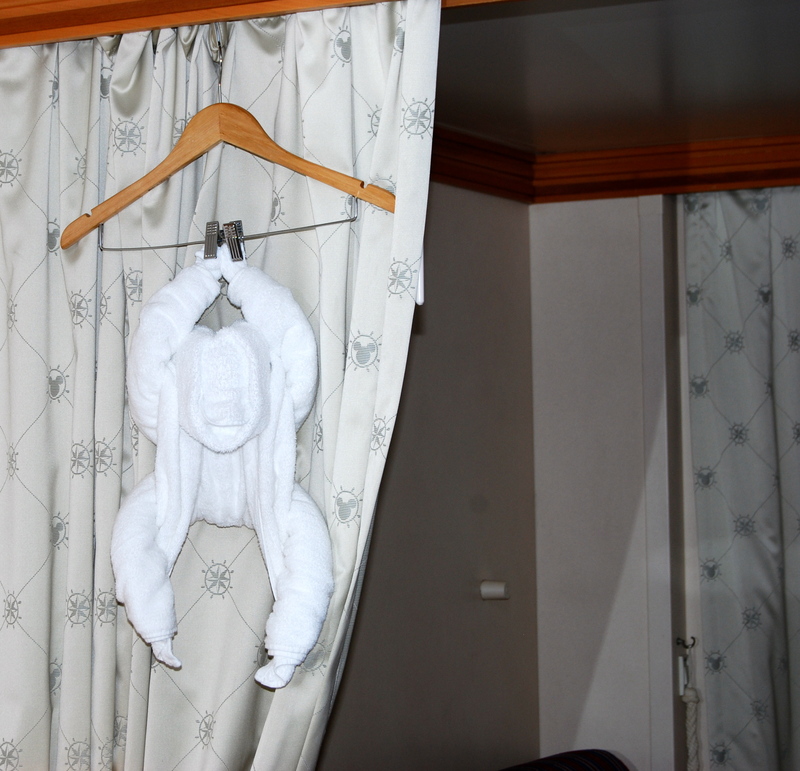 Once that was over we went back to the room, greeted our towel animal and watched Puss in Boots. Then, finally, it was time for bed! We slept a little late today because we had late brunch reservations at Palo for 10:30 am. 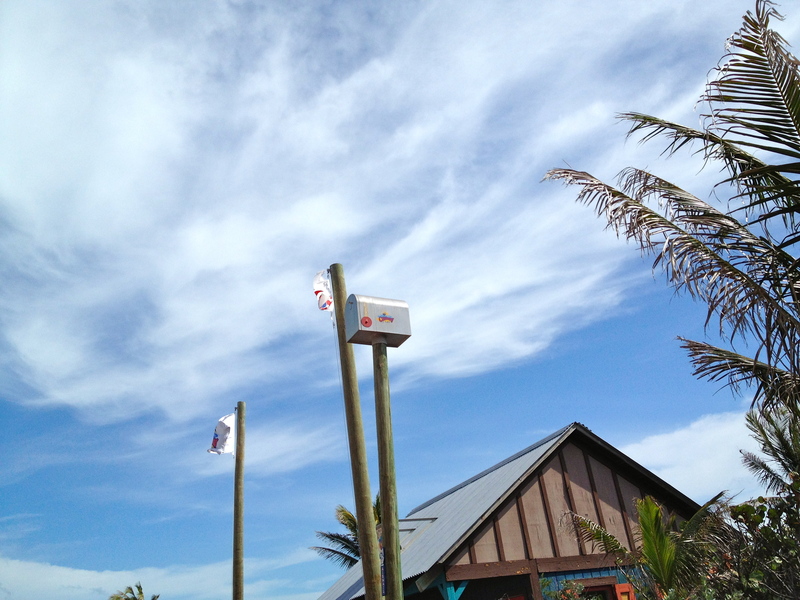 Check out the awesome view from our table: Nothing but gorgeous blue skies and blue water. Well, and the occasional shirtless tourist. CSP was psyched at all the seafood at brunch. 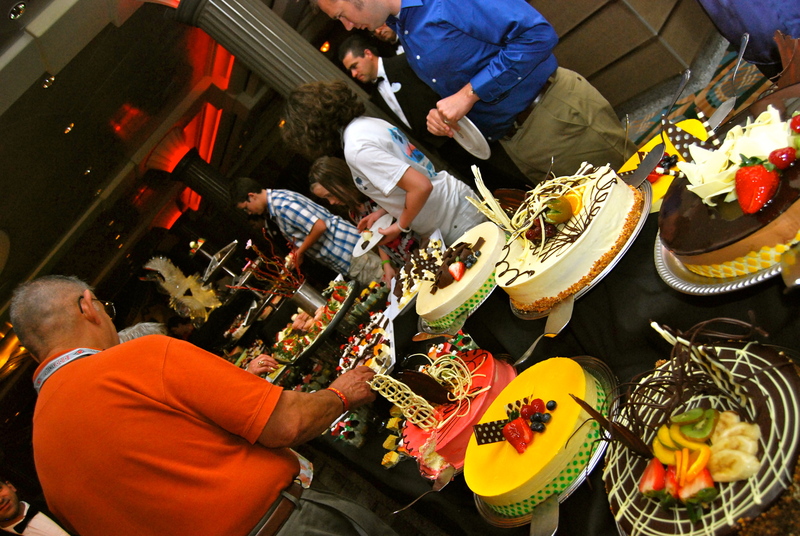 Brunch at Palo is a buffet and I’m normally not a fan of buffets (I don’t like strangers breathing all over my food). 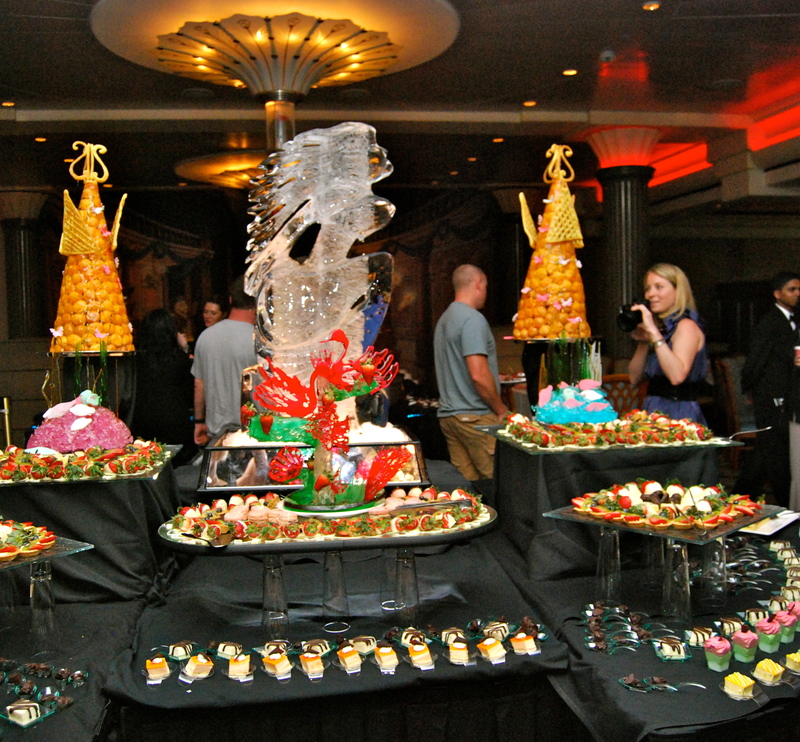 But this buffet was gorgeous! I couldn’t get any pictures of it because it was really busy. 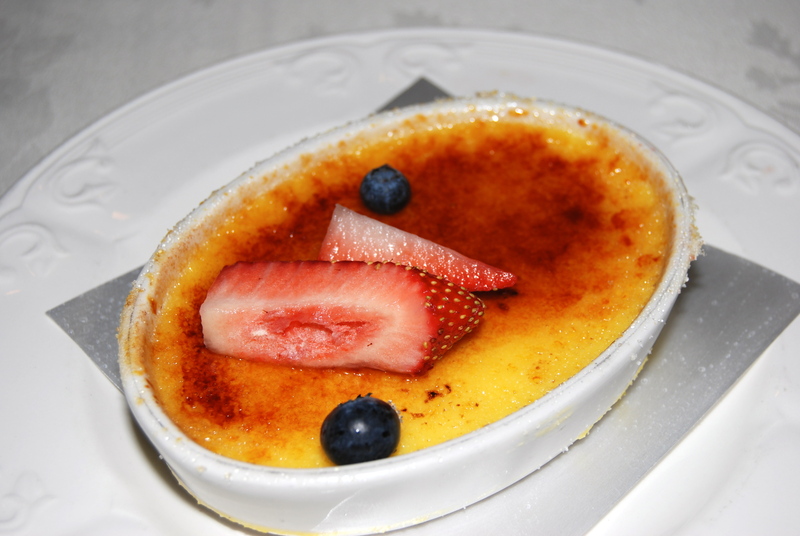 But just imagine- shrimp, crab claws, salmon mousse with caviar, proscuitto wrapped melon, marinated mushrooms, salad caprese, smoked salmon, poached scallops, assorted danish, homemade stollen, mixed berries, chilled strawberry soup, and more and more. 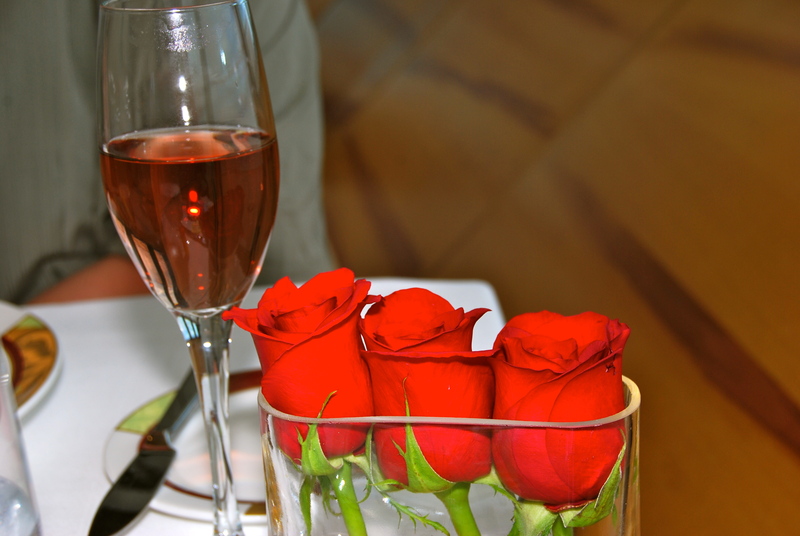 And you’re eating it all at a gorgeous table with champagne and roses. They also have cook to order items on the hot bar. CSP got Eggs Julia, which is Eggs Benedict with salmon instead of ham. I got the classic eggs benedict. We shared a Chicken Parmesan on Lisa’s recommendation. I don’t normally consider chicken parm to be a standout dish but this was the best I’ve ever tasted. Amazing. Then came dessert! I LOVE tiny desserts! We LOVED brunch and considered booking another one later in the cruise. 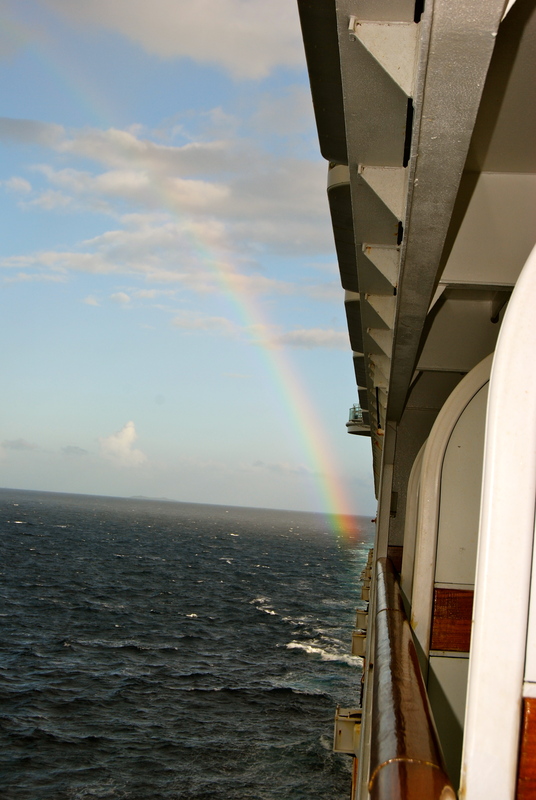 But we decided to wait til the next cruise and keep it a special thing. After brunch we headed back to our room to change into casual clothes. Except…we couldn’t remember our room number! 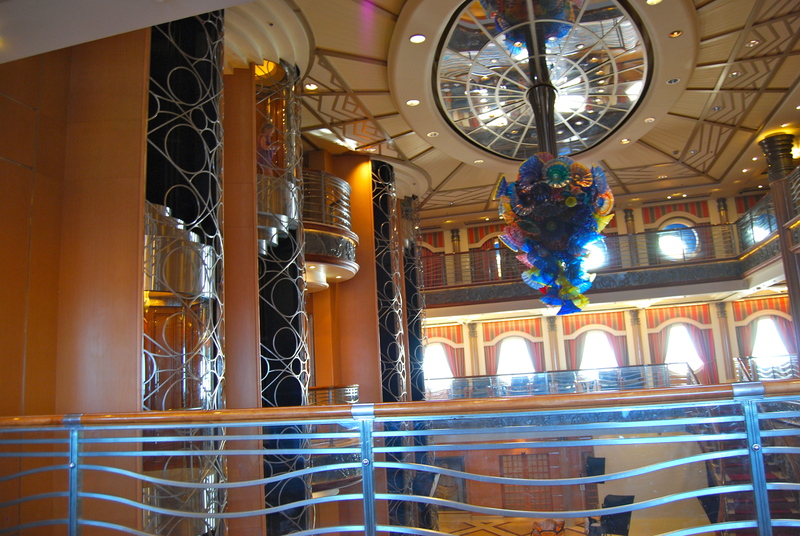 We wandered around deck 6 for a while until I remembered to check our dining ticket. Whew! 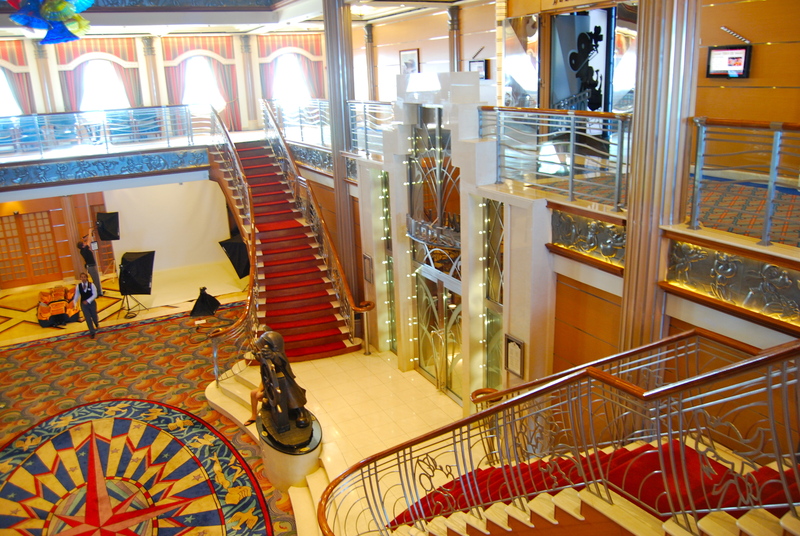 While we were exploring deck 6 we came across this room. I love when people decorate their doors! 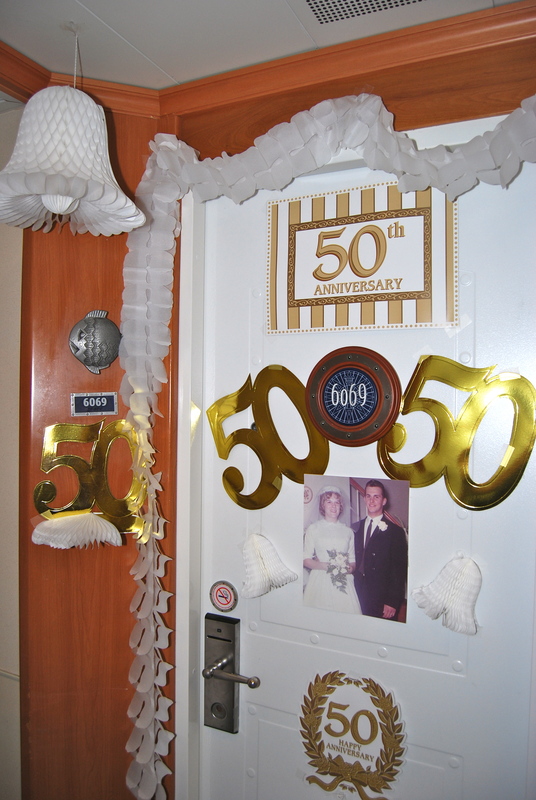 And how wonderful that they celebrated 50 years of marriage on a Disney Cruise! We finally found our room but it was being cleaned. So we went to the future cruise booking desk and got some price quotes for next year. Next thing we knew a dance party erupted! 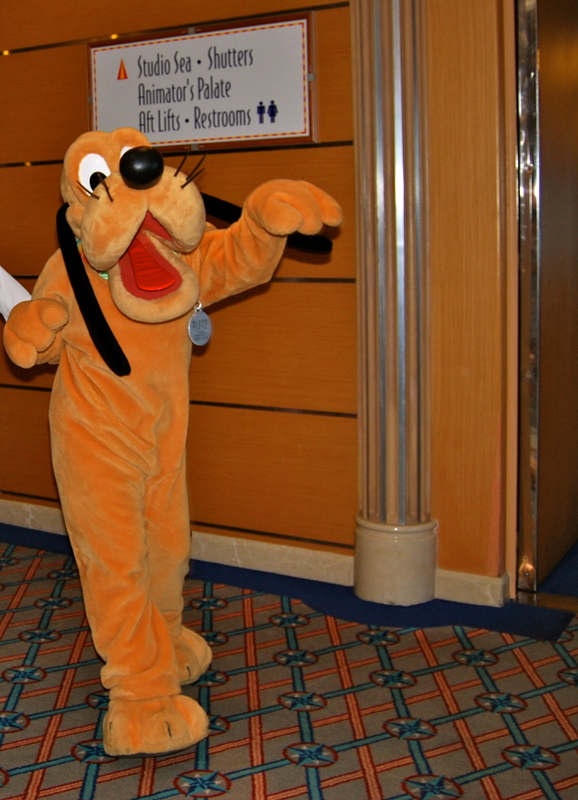 Here came Pluto: and Goofy I wonder why Goofy gets to wear clothes but Pluto can’t? 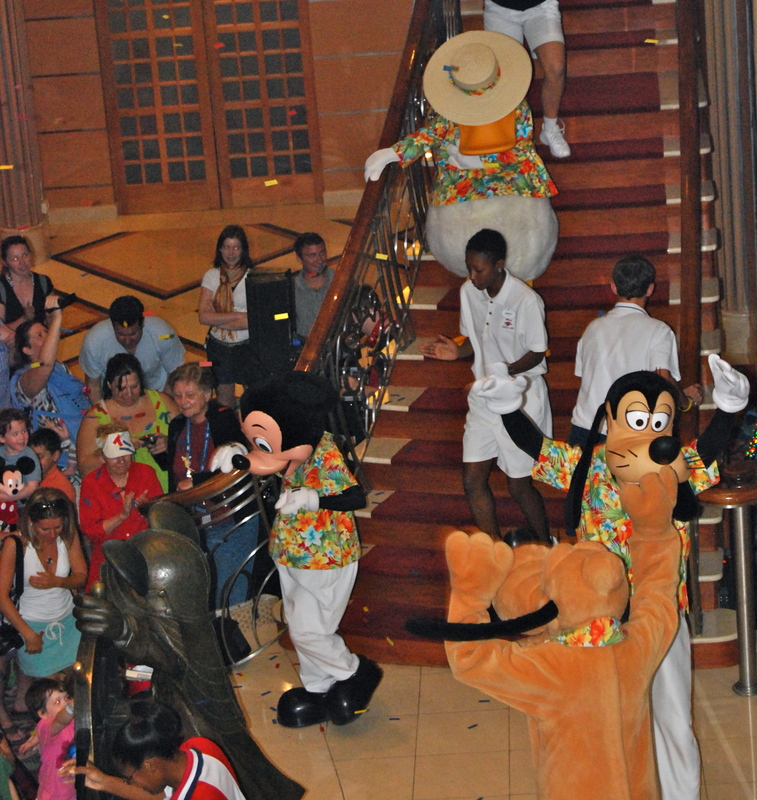 They went down the stairs and joined Mickey and Minnie in a huge dance party! I love how they get right down there with the kids. We watched the dance party for a while then went back to our cabin to nap and read. Then it was time to get ready for dinner. I had a little of my new favorite wine while primping. 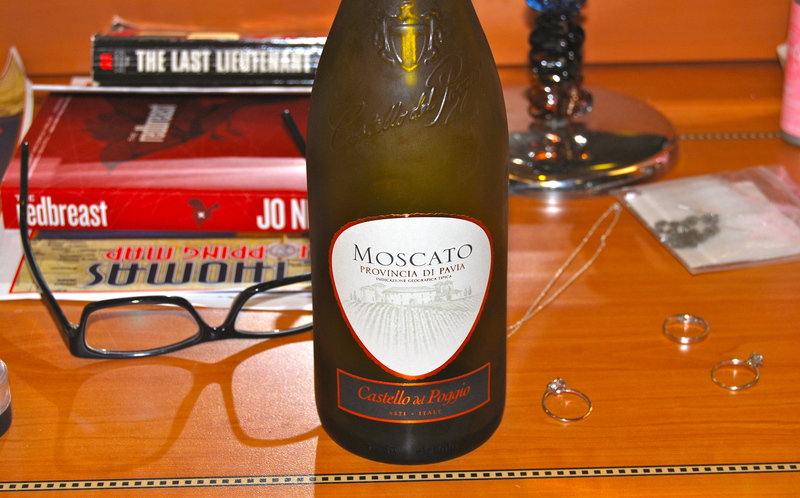 Christina gave me a bottle to bring on the cruise. 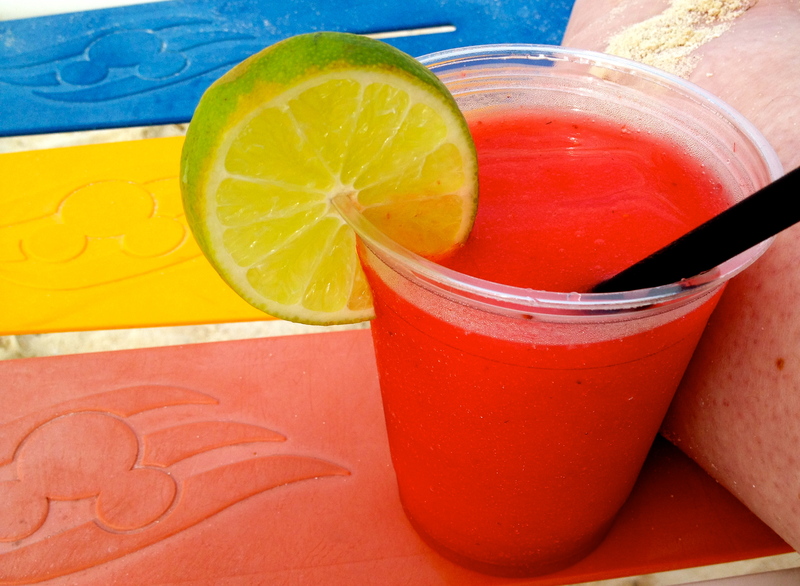 Not everyone knows this but Disney is BYOB. I mean, they do sell adult beverages onboard, but you can also bring your own. Saves a ton of money! 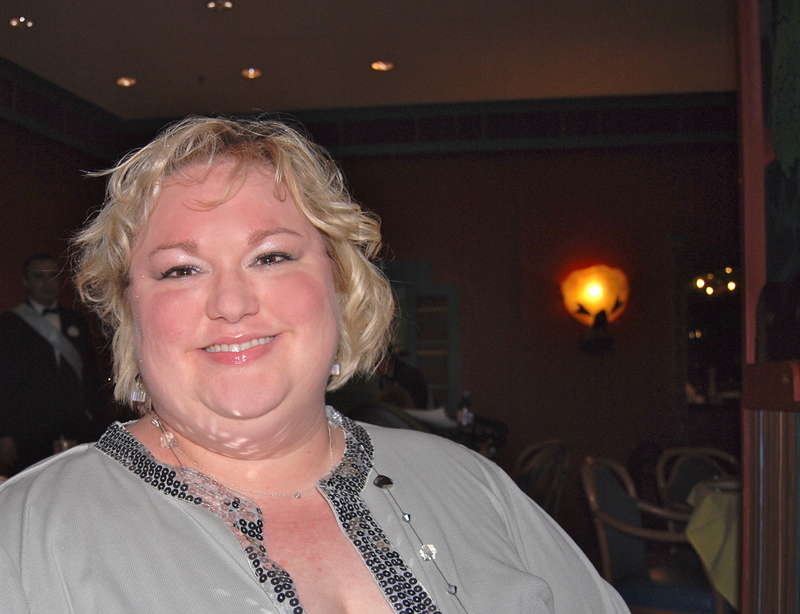 Tonight was Formal Night and dinner was at Parrot Cay. 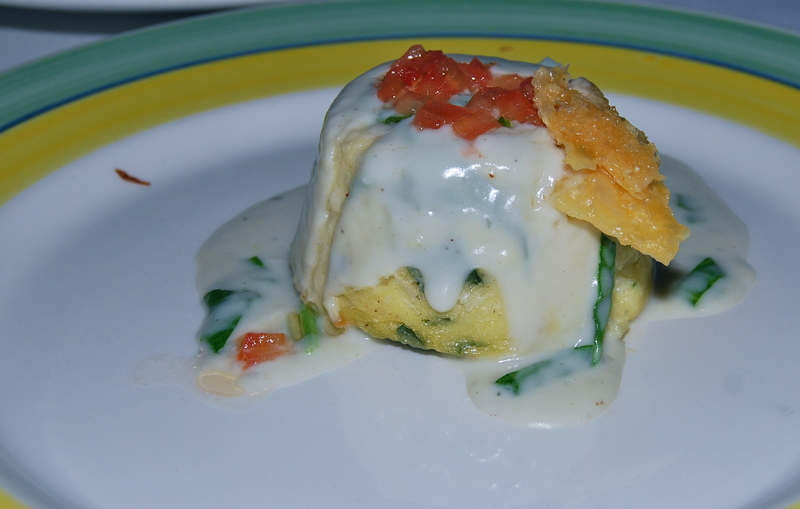 CSP chose the marinated salmon and a parmesan/bleu cheese souffle for his appetizers. I chose a goat cheese and tomato salad. We both had sausage and potato soup (very good but not photogenic). 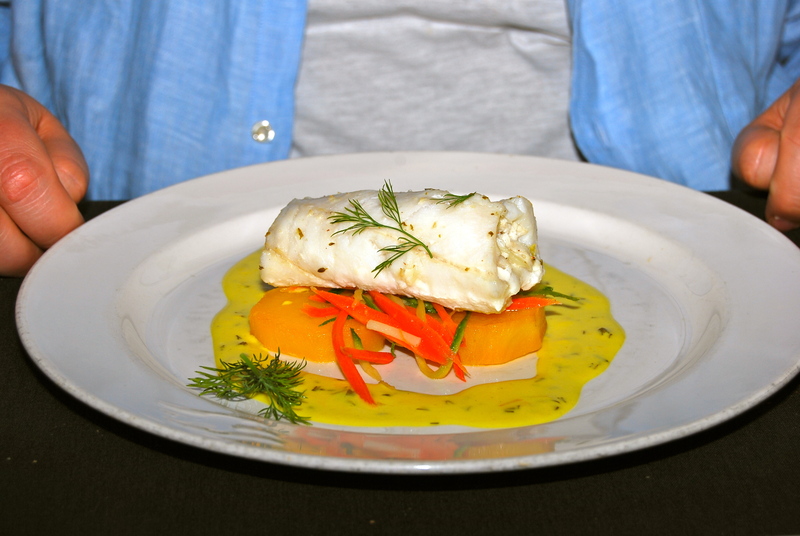 CSP had filet of turbot for his entree. 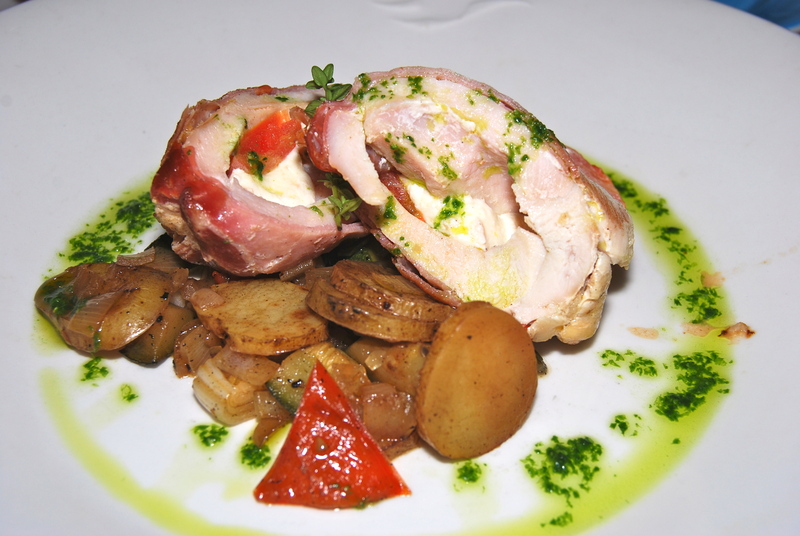 I had proscuitto wrapped chicken with potatoes and zucchini. Dessert was wonderful as usual. 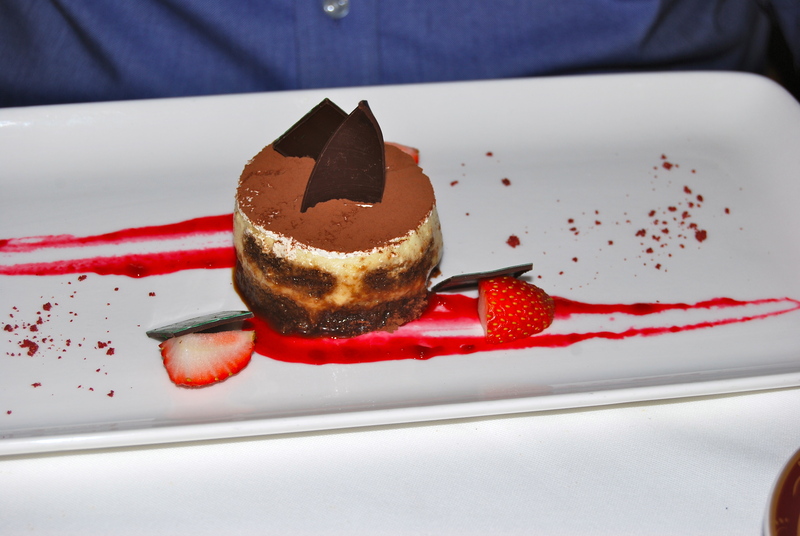 CSP chose a trio- lemon cheesecake, chocolate souffle, and tiramisu. 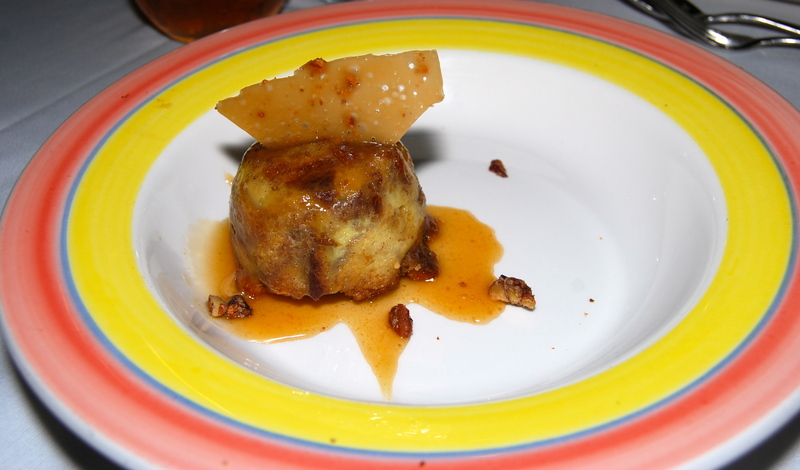 I had the brioche banana bread pudding with caramel sauce. So yummy. We both tried to order things we don’t normally get or eat at home. 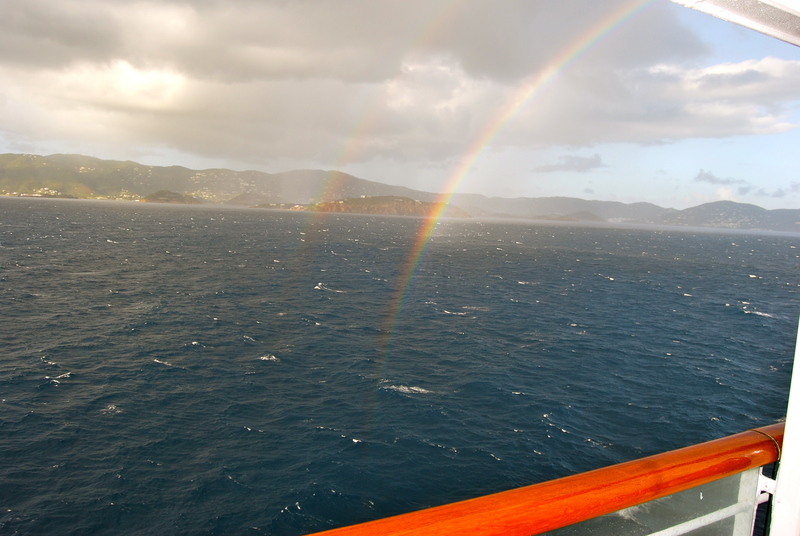 This cruise was a lot of trying new things. And not one thing disappointed. 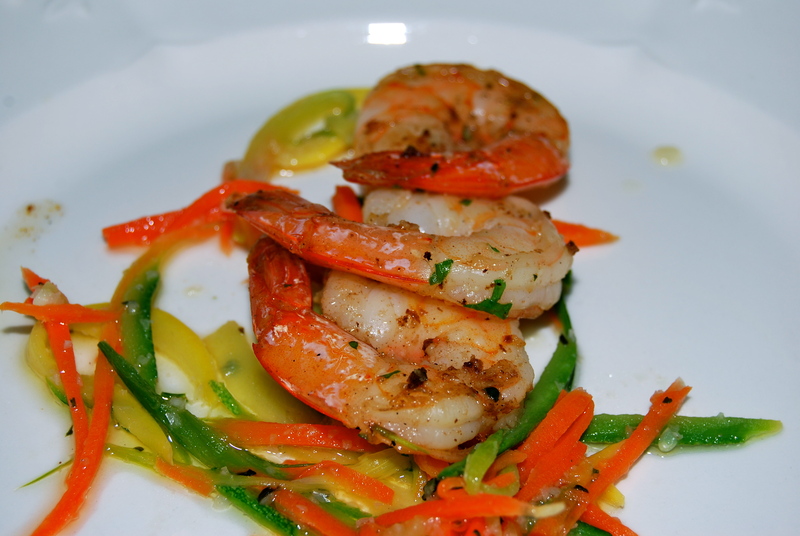 Everything was so wonderfully prepared and delicious! 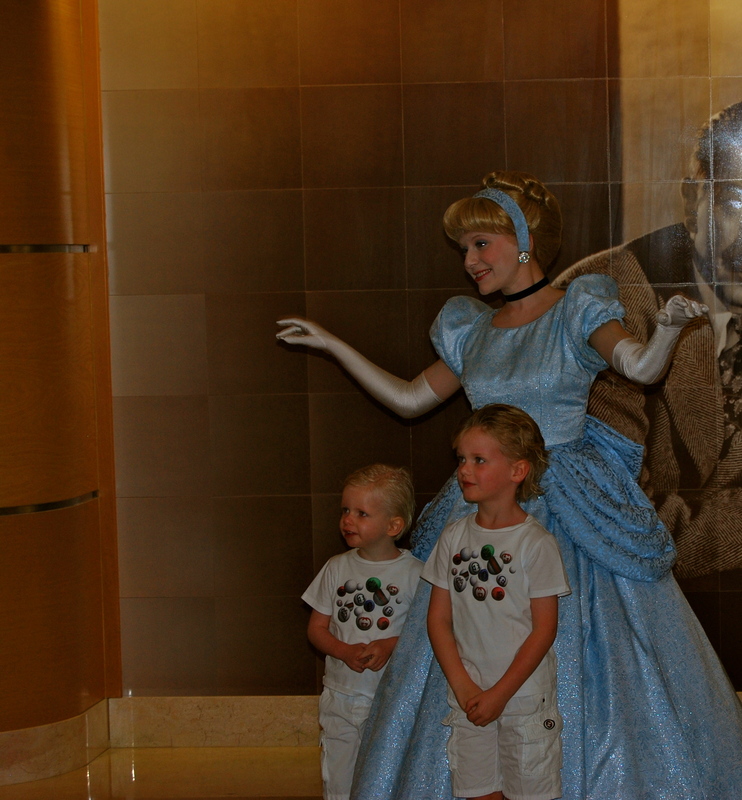 There were lots of people getting formal portraits taken with the characters in the lobby. 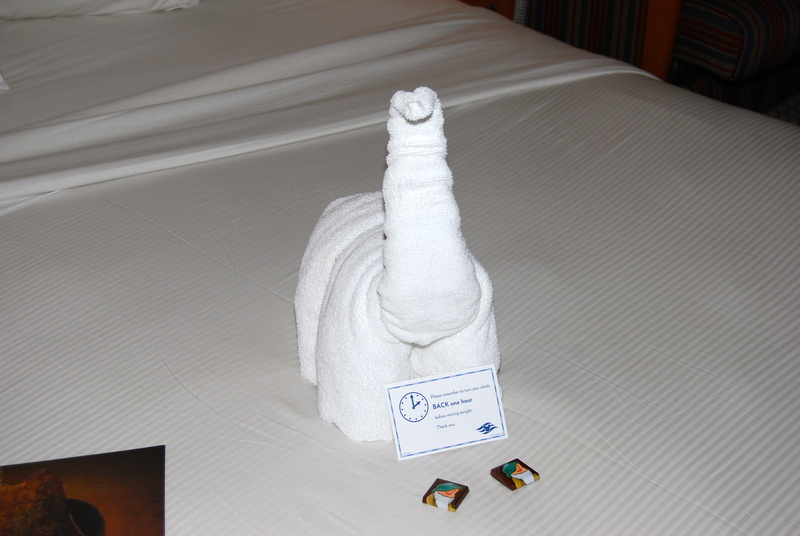 We went back to our room to change clothes and found the latest towel animal. The room host also leaves the next day’s Personal Navigator. 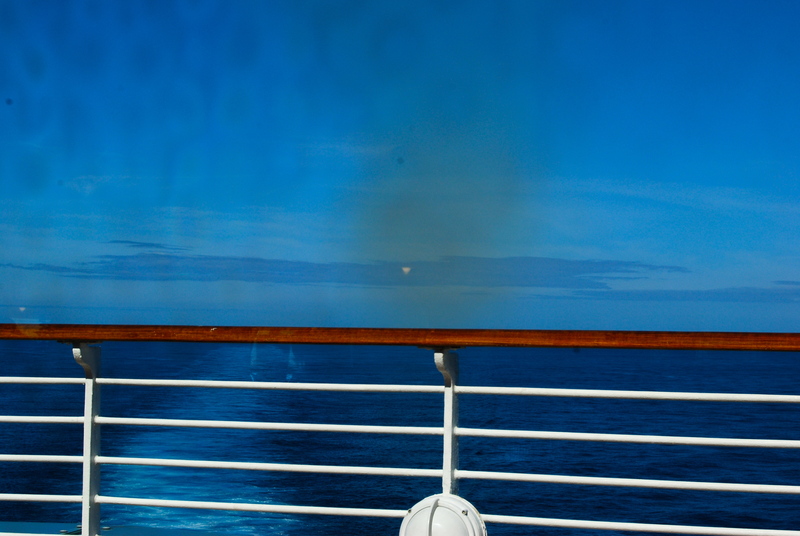 It’s a newsletter of sorts that tells you everything that’s going on onboard the next day. 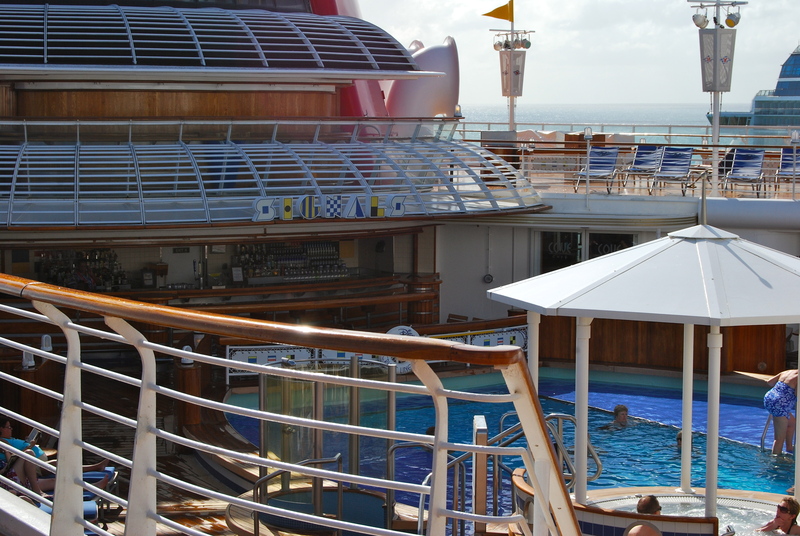 We changed clothes and went up on deck 10 to chill out. The winds were incredible! They were so strong that there were no chairs out for people so we went down to deck 9 and hung out a bit, watching Funnel Vision (the giant tv over Goofy’s Pool). We got some drinks with our refillable mugs and CSP got some pizza (I don’t know where he puts it!). We went back to our cabin, watched Thor and set our clocks ahead one hour before we went to sleep. 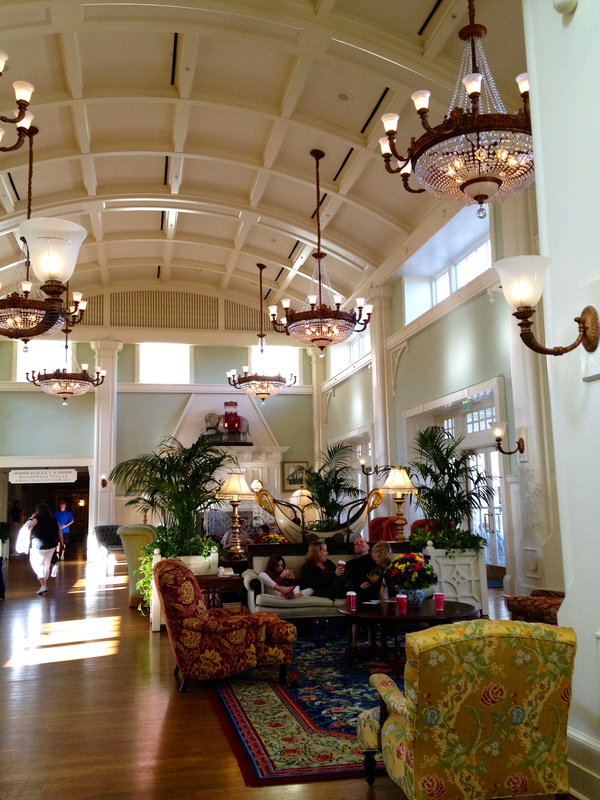 We woke up in our room at the beautiful Disney BoardWalk Villas (thank you Lisa!) and got ready for breakfast. 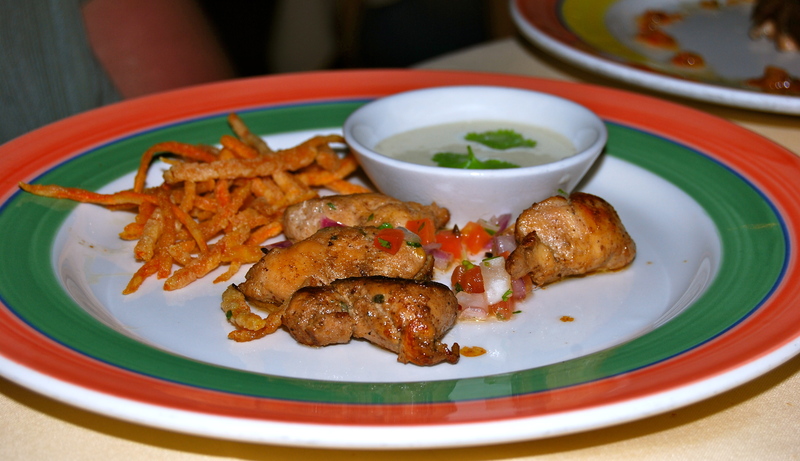 We headed over to Cat Cora’s Kouzzina for our reservation. Gorgeous restaurant! We had a table right by the window so we had a nice view of the pond. 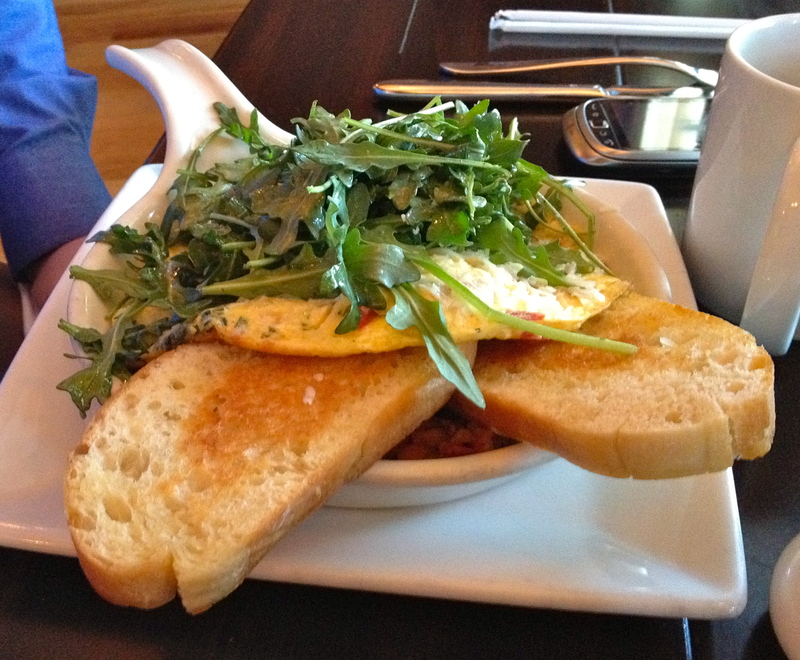 CSP ordered a skillet with eggs, sweet potato hash, pequilla peppers, nueske smoked sausage and arugula. He also had French Press coffee and my frappe (he liked it more than I did so I turned it over to him). I had the waffles. OMG these were some of the best waffles I’ve ever had. 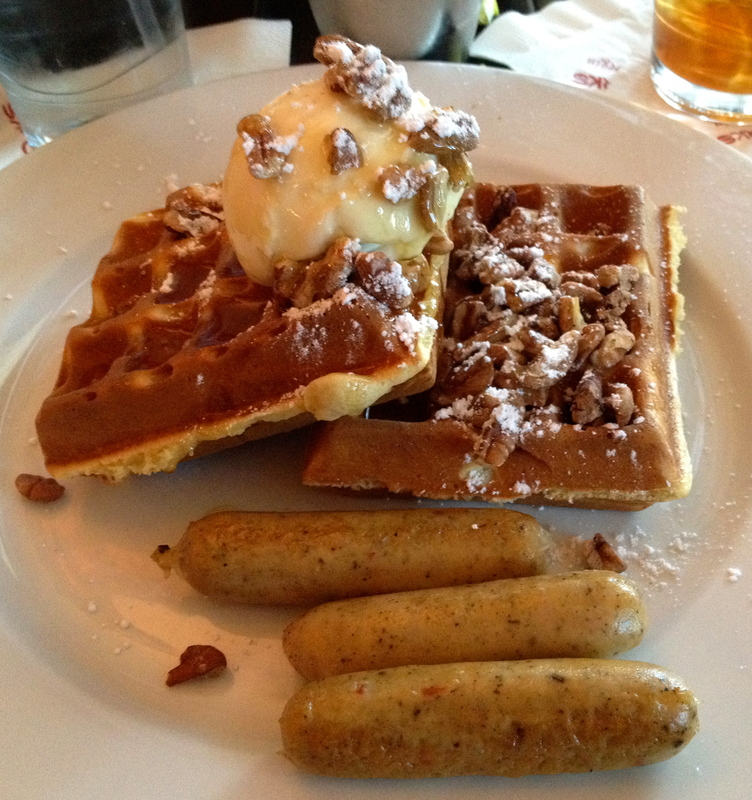 Chicken sausage accompanied them and the toppings were marscapone cheese and pecans. SO yum! We had a lovely breakfast then went to the BoardWalk Bakery to spend the remainder of our dining plan credits. There was certainly no room in our tummies but we didn’t want to waste our dining plan credits. We were entitled to 2 of the refillable mugs so we picked those up along with drinks. For my 2 snack credits I got a fruit tart and a cheese danish. CSP went a little nuts and got a cupcake as big as his head and a tiramisu. We packed our snacks away in the car for later. Now, let me tell you about the dining plan and how much it saved us. We paid $85.52 each for the dining plan. 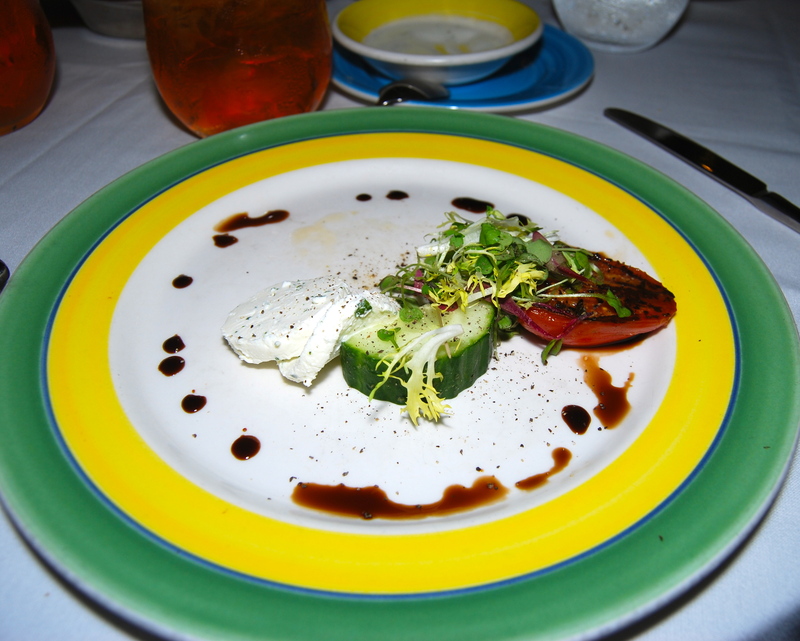 Our dinner at the Yachtsman cost just under $160. Breakfast cost $45. The mugs cost $15.50 each. The treats at the bakery cost $32. 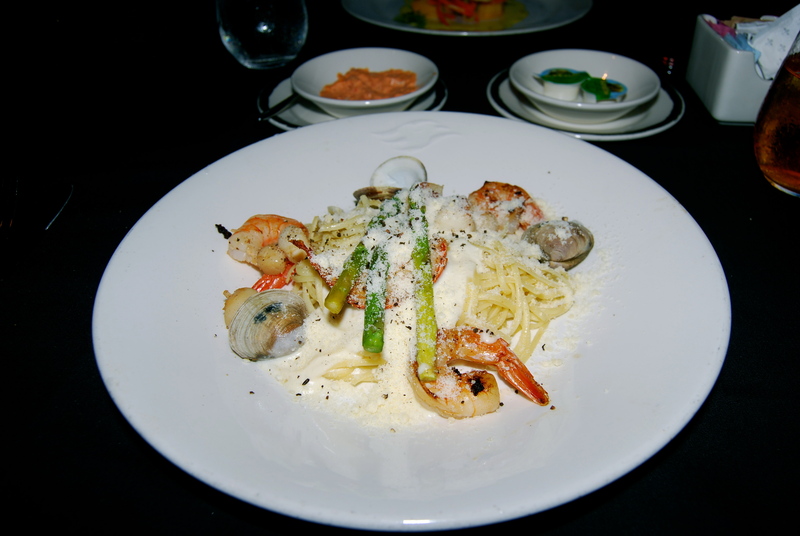 The dining plan saved us $97.00! We aren’t used to $160 dinners and $40 breakfasts. This was a huge treat.